3D model ripped & rendered by Theigno. Profile: "A physician whose reputation is such that it's said, 'There are no patients Biomon cannot cure.' For he who knows everything there is to know about living things, surgery and the like are child's play." 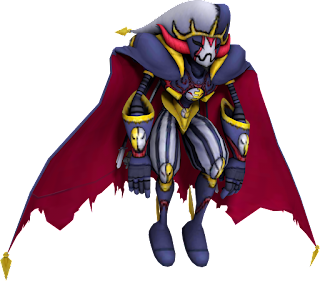 This profile is translated from Digimon Universe Appmonsters: Cyber Arena on the Nintendo 3DS. The 3D model also comes from Cyber Arena. Model ripped & rendered by Theigno. Profile: "An evil clown that creates lies to deceive the whole world. It primarily deals in the art of forgery, often taking the forms of others rather than itself." 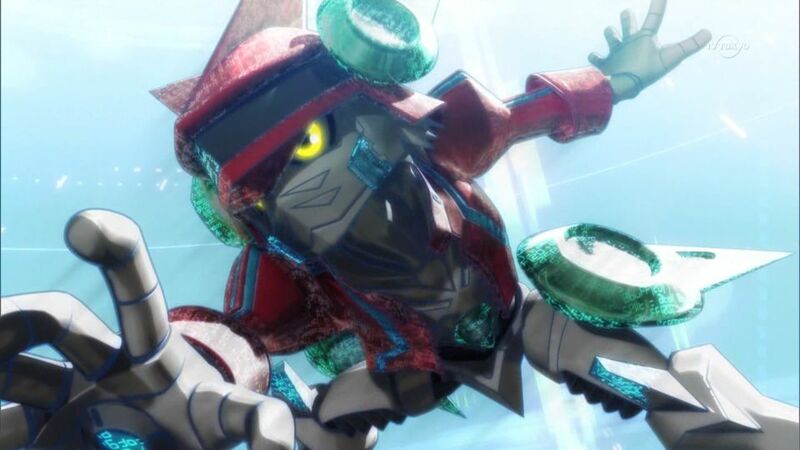 Profile: "An Appmon with restoration abilities. If so much as a single fragment remains, then even completely erased data can be restored to its original state." Profile: "Capable of destroying fully fortified security in an instant, it's an incredibly dangerous existence. It has the ability to manipulate at will any data whose ownership it has commandeered." Profile: "An Appmon whose beauty is exceptional throughout the world. Not only in physical appearance, but also in voice and conduct they are immensely lovely, and so every single move they make enchants the hearts of all things." 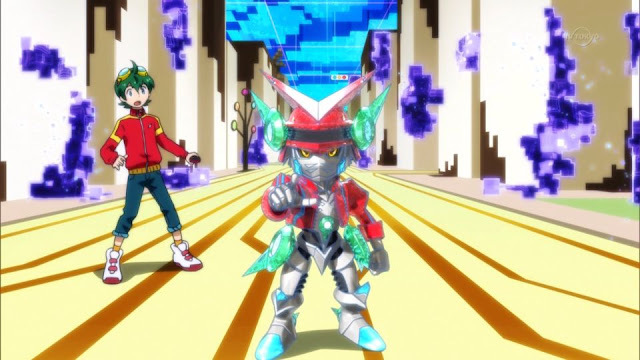 Appmon Episode 2 Review: "The Mysterious Road Guide! I Am Navimon-Degozaru!" I Am Navimon-Degozaru! starts with several threads. 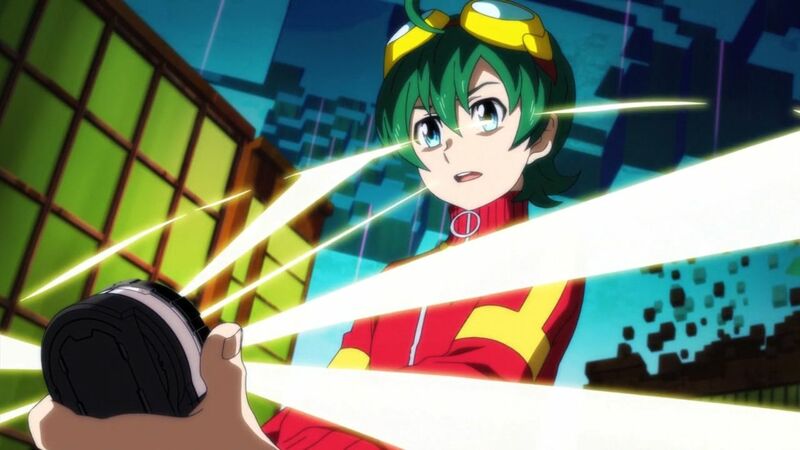 The introduction of Wato "Watson" Takeru, the involvement of Gatchmon in Haru's daily life, and most interestingly a further look into Appmon's world. The anime takes pains to portray this world as our world, setting it on October 7~8th, 2016, and using multiple real-world technologies as reference points for it. 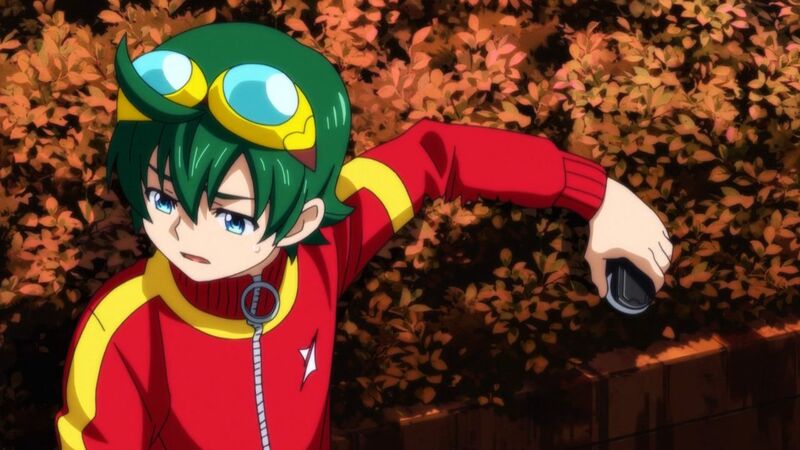 But what starts out as a fairly tame episodic plot suddenly shift in scale as Haru and Gatchmon are confronted by an obstacle far outside their initial scope. 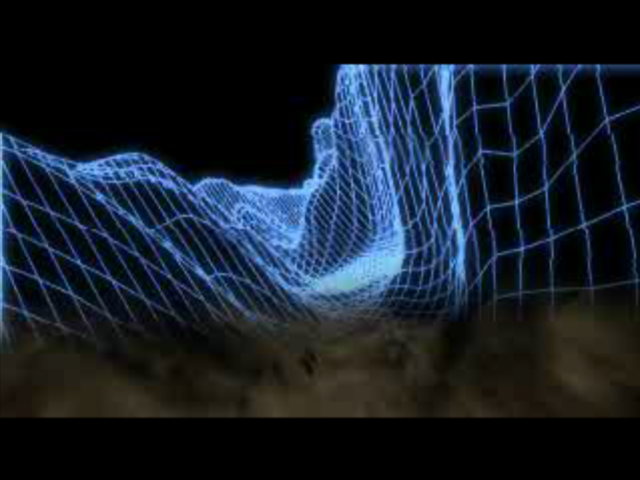 To start us off, Haru walks the viewer through the structure of the Net Ocean. 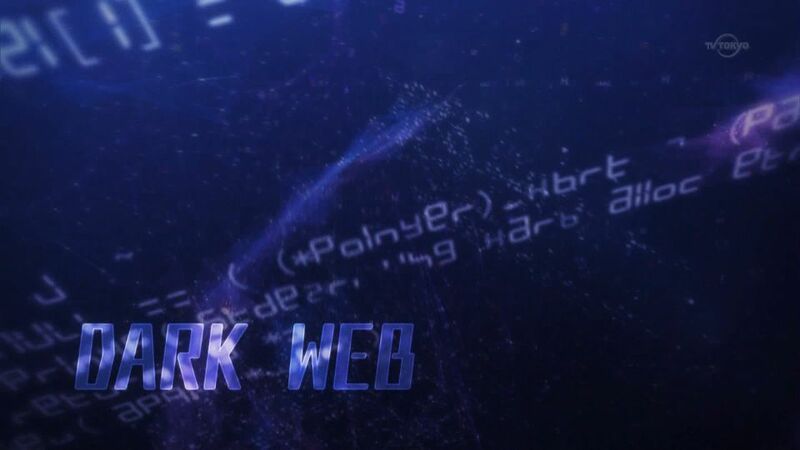 Comprised of the Surface Web at its uppermost layer, then the Deep Web below, and finally the Dark Web underneath. These are real descriptors for spaces of the internet, with the Deep Web being made up of a huge swathe of underground information not regularly indexed by search engines. In the real world, the Dark Web is likewise another step removed as a form of information deliberately concealed from normal browsers. 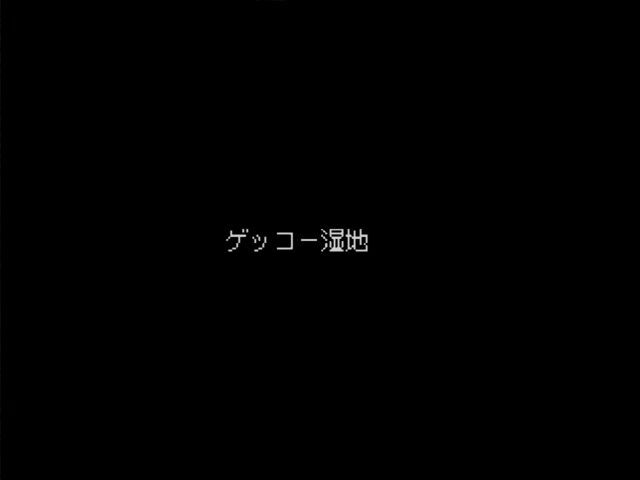 Appmon, which has already drawn favorable comparison with Rockman EXE/Mega Man Battle Network, invokes the Dark Web as a major setpiece. 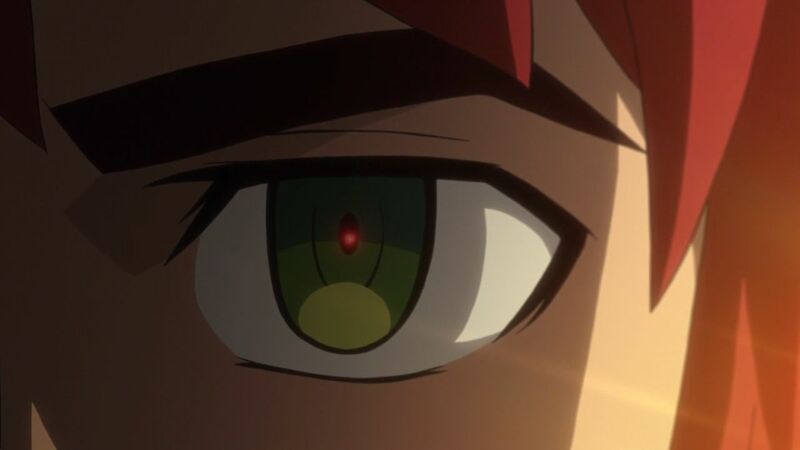 While EXE predicted the existence of the Dark Web three years early via its own Undernet, Appmon is working with a location that's already been implanted in the public imagination. The choice to house its overarching antagonist within the Dark Web is intriguing, as being the abyssal plane of the internet, it follows that the web's own "leviathan" would lurk there. Gatchmon later explains that the "final boss AI" Leviathan is the source of the berserk Appmon. 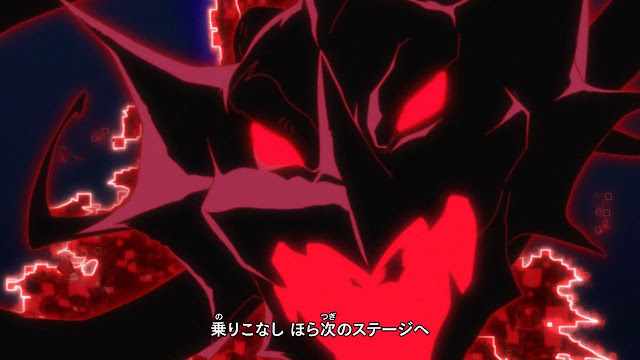 By propagating its L-Virus, Leviathan causes normally-benign Appmon to go berserk, helping it seed chaos throughout the human world. Prior to meeting Haru, Gatchmon had been evading that same AI, intending to thwart its plans. This exposition is coupled to other developments. Navigation apps have been going haywire throughout the town, creating a citywide panic, and Haru's classmate Ai is one such victim. After learning that she went missing while out shopping, Haru immediately volunteers to go search for her--a dramatic shift from his behavior in the first episode, and one that doesn't go unnoticed by Yuujin. This episode takes full advantage of its premise, parodying human dependence on navigation apps. While even Obama gets mislead by Navimon in a montage of lost persons, today's most humorous moment is when Navimon leads a poor girl to walk around in circles. How often have we seen something similar with Google Maps, unable to pinpoint our direction or even where north is? Navimon himself has an archaic speech pattern and styles all of his misdirection as jutsu, poking fun at the popular image of the ninja. 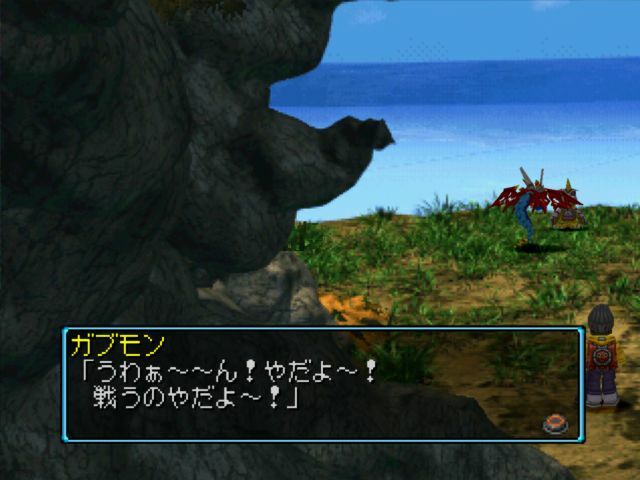 Where Messemon attacked with text messages transformed into projectiles, Navimon sticks his enemies with a Crash Bomb-like pin that turns all of his other shots into homing attacks. 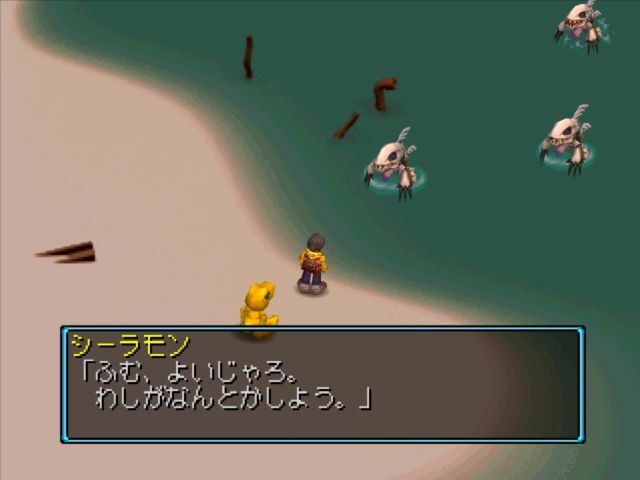 Like in the previous episode, Haru and Gatchmon overcome the monster of the week using Gatchmon's Deep Search function to pinpoint its weakness. 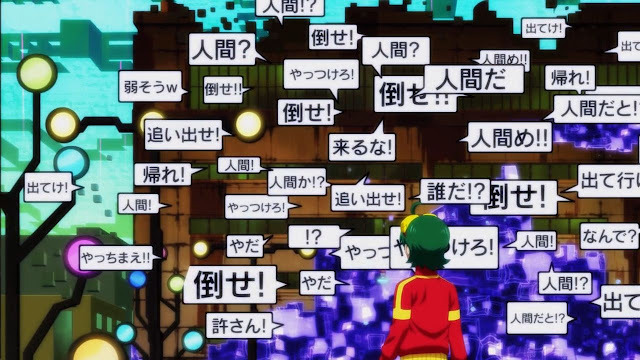 (Not unlike the gamers at home googling Appmon weaknesses in Cyber Arena.) However, this episode established the fears that each episode would only boil down to Deep Search were unfounded. Haru accomplishes his strategy of the week--"Rotate"--by using the much-teased Applink ability, linking Gatchmon and last week's Messemon. One background point to this was that the final combination was shown to literally be more than the sum of its parts, with Gatchmon's base 1000 power and Messemon's base 500 coming out to 2000 as "Gatchmon Plus Messemon." The monster-of-the-week formula that the previous episode left us to anticipate is subverted by the sudden appearance of Cameramon. 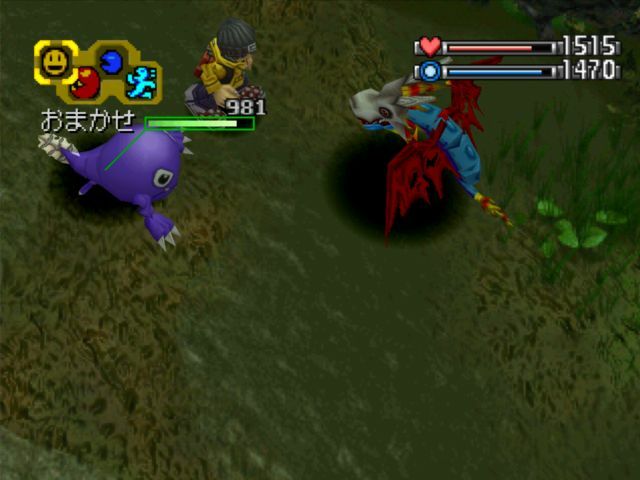 Once Haru captures Navimon, Cameramon stepps in to nip Leviathan's opposition in the bud. The narcissistic Cameramon leaves a strong opening impression, literally conjuring a double line of cameras to walk through as he fights, giving him countless photographs of himself to look back on. 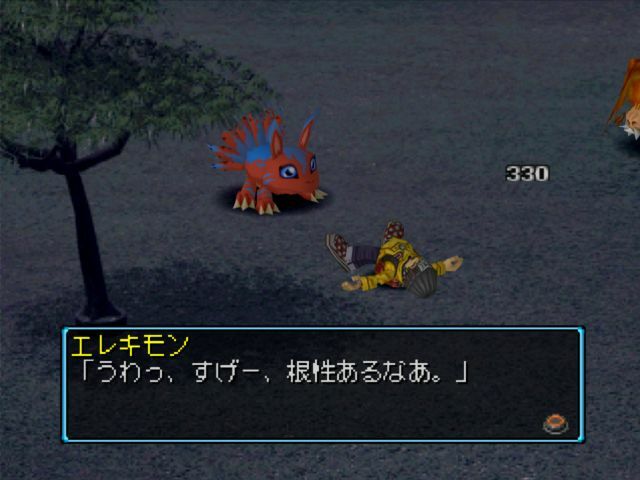 Haru picks up the slack when Gatchmon seems incapacitated, thinking on his feet and figuring out that he can Applink Navimon just like he did Messemon. 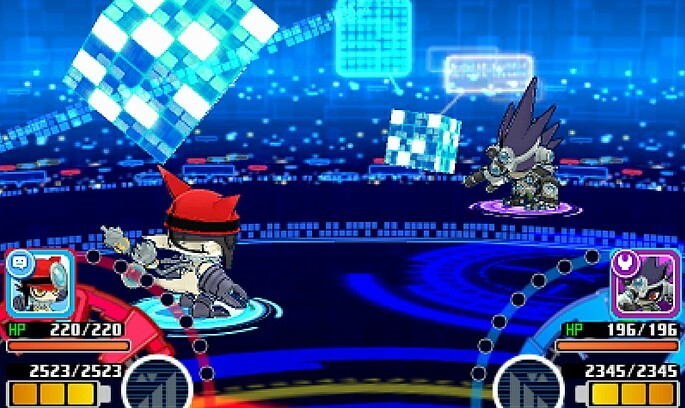 In the process he inadvertently App Fuses Gatchmon and Navimon into his first Super-grade Appmon, DoGatchmon, with an exponentially higher base power of 7500. Overall Appmon's initial episodes have taken on a tone similar to Digimon Adventure V-Tamer 01, introducing and demonstrating the abilities of a monster-of-the-week, then coming up with a creative way to defeat it. Haru's initial solutions are certainly about as simple as Taichi's first strategies ("Let the enemy attack first!" "Wait for it to slow down!") but the series is taking pains to escalate its greater-scope conflicts faster than past seasons. The power level pacing thus far matches the tempo of other Digimon series, giving our first Adult/Armor/Super in episode 2, but the pacing of story beats is entirely different. By introducing a direct subordinate of Leviathan and involving him in a battle with the protagonist so quickly, Appmon's functionally jumped ahead to episode 8 (Adventure) 14 (Tamers) 6 (Frontier) or 12. (Savers) This is a shift I'm critically receptive to--it's trimming the fat, which is what makes it so difficult to introduce Digimon to mainstream audiences in the first place. One thing that struck me regarding this episode was the way Yuujin seemed to get subtly pushed into an antagonistic role again, in a subtler way than at the end of episode 1. Ai vanishes and becomes a motivator for Haru to track down Navimon, but then she turns up safe and sound with Yuujin later. It seems as though the series is pushing for Yuujin to be in cahoots with Cameramon, knowingly or unknowingly. Next week's episode is "The Character I Raised is Stark Naked!? Roleplaymon's School Dungeon!" 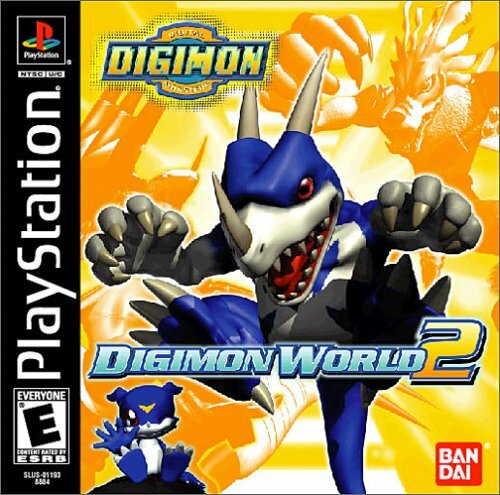 Can We Have A Digimon World Championships? Original image uploaded by Andrew Karklins. 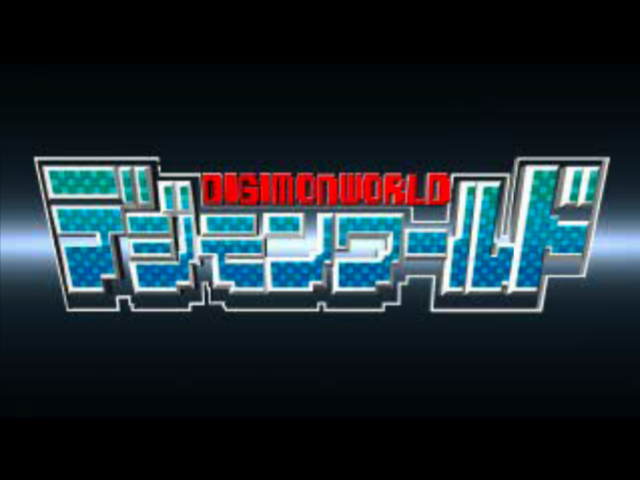 And so my thoughts have turned to the question, can there be a Digimon World Championships series? This is really asking the question; do we have a game worth playing at a high level, and if so, how can we organize competitions for it? 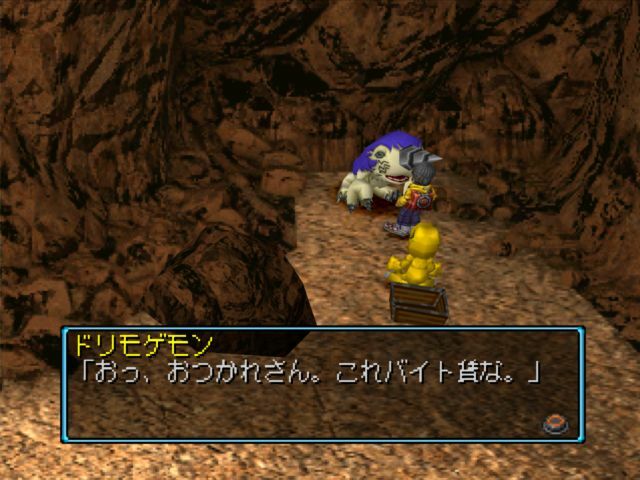 Tournament play is nothing new to Digimon, but it's certainly been dormant for many years. The last official Digimon tournament was during the Xros Wars era in 2010, but that was a Jump Festa event and a blip on the map compared to Digimon's former lineage of competitions. 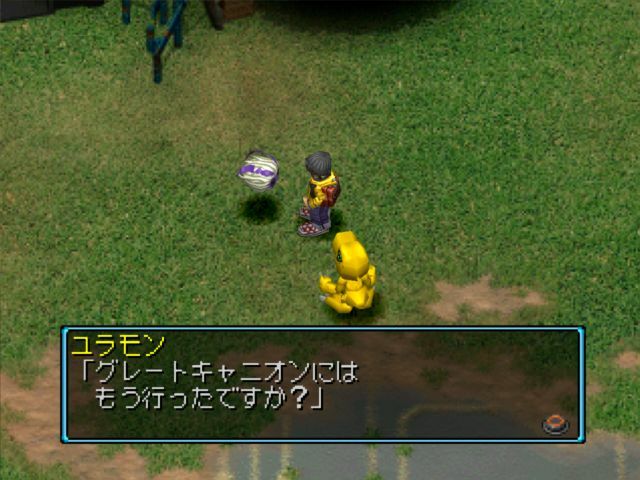 Continuity with past tournaments was actually broken in 2007, when the Digimon Twin virtual pet became the last such pet to have official organized play for it in toy stores across Japan. 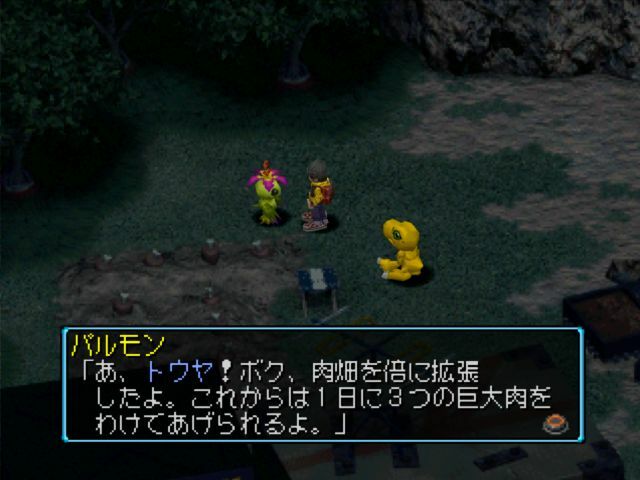 The D-1 tradition dissolved during Digimon's 10th anniversary. The closest thing we have in modern times are the DIGIMADO conventions, which meet four times a year in Japan and are only attended by ~40 persons per event. 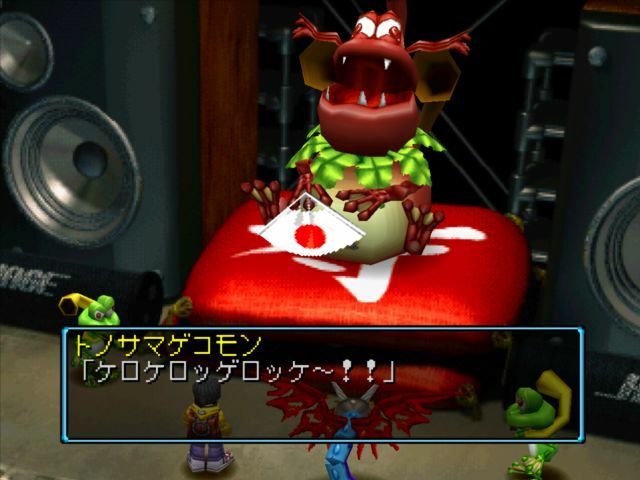 DIGIMADO is primarily for Digimon's Hyper Colosseum trading card game and miscellaneous video games like Digimon Racing, with Cyber Sleuth being the most visible. 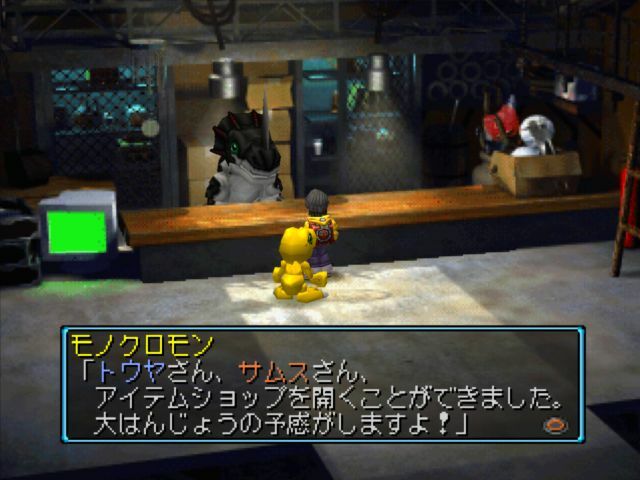 In past years, DIGIMADO has also featured Digimon World Re:Digitize and Decode tournaments, which were among their most highly-attended competitions. 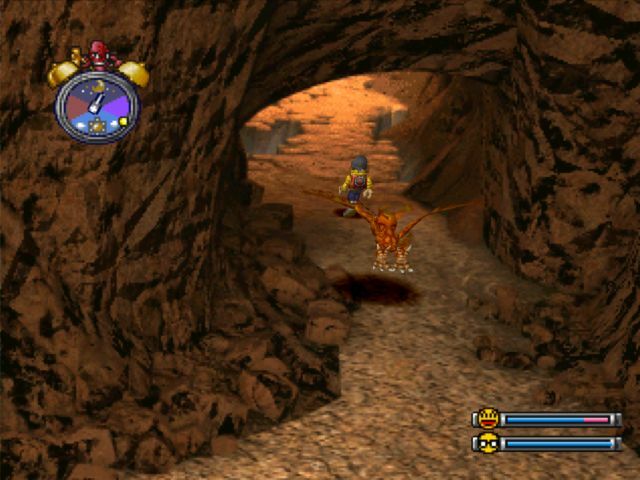 Those games, which required less time devoted to raising a competitive Digimon and were overall fairly intuitive, particularly lent themselves to such events. These days DIGIMADO is lucky to see six people in the Sleuth tournaments, whereas the Decode tournament had sixteen entrants, enough to have a real eight-man top cut. We're facing the Super Smash Bros. dilemma, having to single out one game among an entire franchise that's representative of the best it can be as a multiplayer experience. 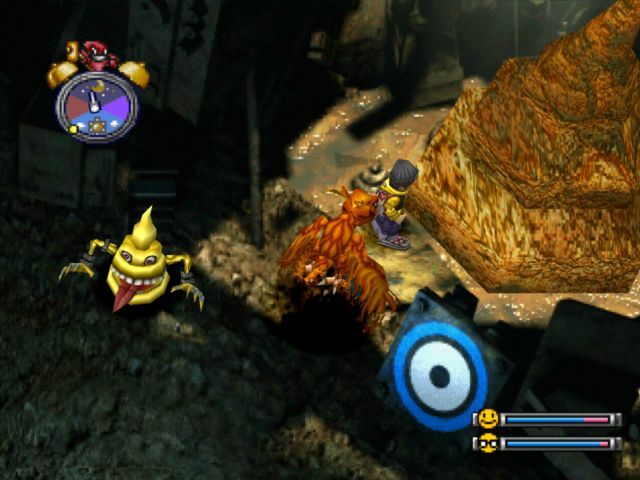 It's tempting to assume that Cyber Sleuth would be the go-to for a World Championship, but Sleuth was primarily designed as a single player RPG with the multiplayer as an optional component, whereas Pokémon games are designed with both single and multiplayer as part of a seamless whole. When you get down to it, Sleuth just isn't a very well-balanced game. The fact that it made the gen I mistake of consolidating Special Attack and Special Defense into a single stat isn't even the biggest issue--the game features direct turn manipulation, speed manipulation, evasion boosting that forces tamers to run no-miss moves, and numerous HP and SP recovery skills that cause most matches to run straight into the time limit. 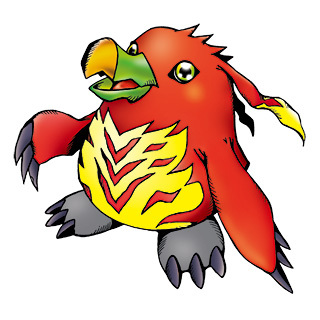 DIGIMADO attempted to rebalance Sleuth with rules restricting the use of healing skills (and to prevent rule exploits) but these regulations are difficult to enforce on a grand scale and don't deal with the problem of most Digimon just not being very playable. There are also practical concerns at work. The PlayStation 4 version of Sleuth doesn't support local multiplayer, so the only people that could participate in a World Championship series would be those with PlayStation Vitas or PSTVs. PS4 users can import their save data onto the Vita, so they wouldn't have to start from scratch, but that's an additional $40~$100 invested just to play. While in Japan the Vita has enough of a consumer base in a relatively close area that makes this practical, the PS4 version is without question the more popular one overseas. 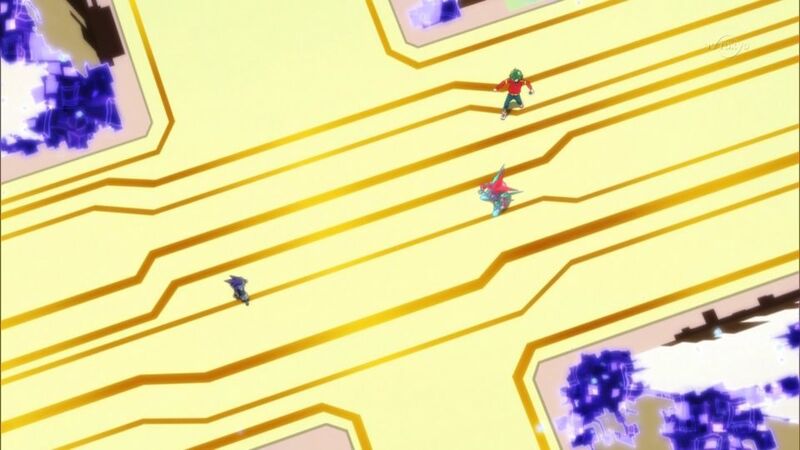 A common sentiment among competitive Sleuth players is that some Digimon should be banned--namely key members of the Royal Knights and Seven Great Demon Lords--but banlists are tricky to balance without recentralizing a game around whatever the next best thing is. 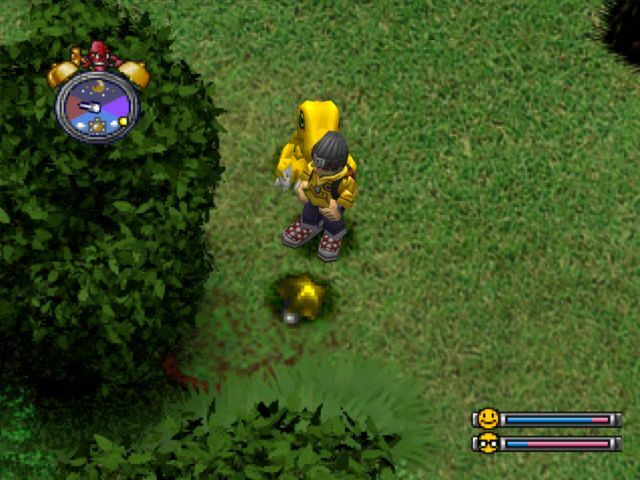 Assuming you did put a blanket ban on "legendary" Digimon, Sleuth's multiplayer would immediately revolve around speed manipulation with teams like triple Metal Garurumon running around, or evasion boosting via Mirage Gaogamon's Support Skill. 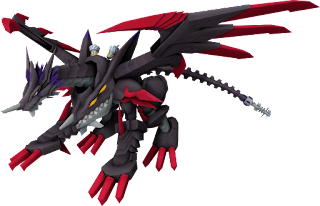 If you ban duplicate Digimon, that actually cripples a number of monsters that were seemingly designed around using duplicates, like Diablomon. 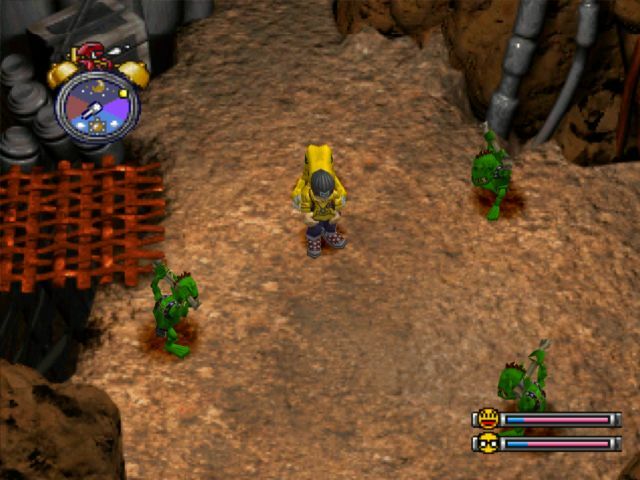 Without duplicates, those Digimon become functionally useless in multiplayer. Where do we draw the line? Ideally we would reach the point where the game allows a multitude of viable skill-based strategies without overcentralizing the game, but reaching that point would be a long road indeed. The most played alternative format to VGC in Pokémon is Smogon's, which uses a combination of usage statistics, player input, and oversight committees to divide 721 Pokémon into usage-based tiers that try to give all of them a viable niche. Smogon draws a lot of fire for their infamous bans and restrictions, which remove chance elements and abilities (nominally) to promote diversity and prevent a situation where trainers "have" to run certain Pokémon in order to win. Whether you agree with them or not, there's no denying that Smogon's methods are well intentioned, and that tournaments within each tier are much more diverse than VGC. We're going back to our roots. Like WAAAY back. Maybe further back than you could have ever possibly wanted. There is one "quick fix" balancing method. It's more obvious than it may seem on the surface, and also completely contradicts every established idea about Cyber Sleuth--make the game one-on-one. This fix completely removes every single one of the unbalancing elements of the game; when healing requires you to take a turn and you don't get access to infinite SP restoration, you now have to choose between offensive and defensive plays instead of having your cake and eating it too. Team-buffing effects like Godspeed and Feral Impulse stay useful but are no longer overwhelming, as you're only talking about one extra turn instead of three to nine. Revival skills become a non-issue, and the limited number of skill slots limits the amount of status errors that can be used by each side, making it more proportional to the number that can be blocked on a single Digimon. From the perspective of organizing tournaments, it would also greatly democratize the game by reducing the amount of time devoted to training expected of newcomers. More players would be able to participate, the impact of Support Skills would be reduced, and (theoretically) greater diversity would be observed without needing to hard ban specific Digimon. There would be no more cumulative passive speed boosting, and the Digimon that get hurt by banning duplicates in normal play would be more viable in singles as they're now competing against a lower power scale. Playing around the clock as is seen so frequently now (especially on pure Ulforce teams) also becomes less viable, as each tamer only has a single 60-second turn rather than three of the same, while the timer is still fixed at 30 minutes. 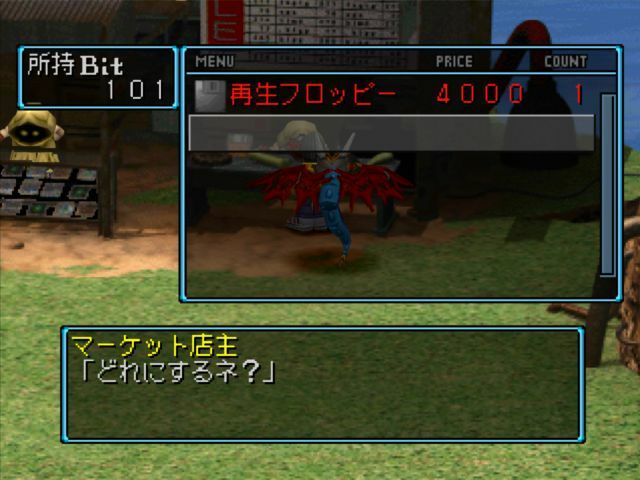 This does introduce some potential complications where certain Digimon may be able to score one-hit kills from the onset with specific matchups, potentially pointing to two-on-two being the better balance, but this would require direct testing to determine. The overall problem with this idea, as with any bans or restrictions, is that it can't be enforced in online play. All you can do is refuse to match with tamers that aren't compliant to such rules. With Cyber Sleuth's small but dedicated fanbase it may actually be possible to keep a registry of 1-v-1 compliant tamers, but the ideal is to grow the player community over time. As that community grows, you're looking at potentially hours of refusing matches until you finally get paired against a compliant tamer. The competitive ideal for any game is that real-world local tournaments will get started by small regional communities and expand to eventually encompass a national and/or world level (think Evo) and any restrictions make such play that much harder to organize. I think that it can be done, but the Digimon fandom has to seriously want it first. It would be easiest to use a game that doesn't need to be rules-patched, and has some semblance of balance out of the box. 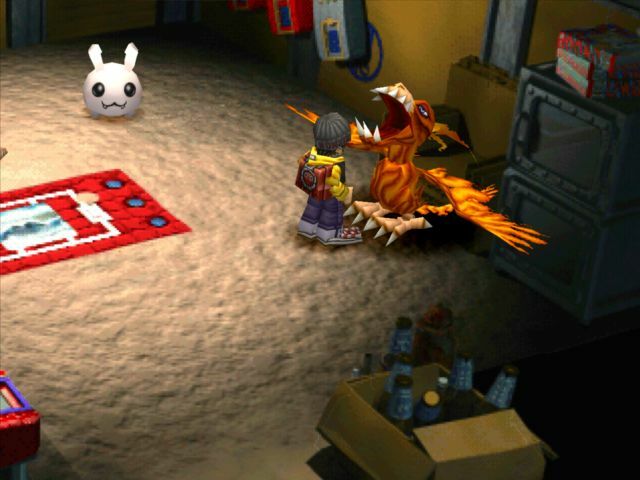 Digimon isn't exactly known for great game design, but there are a few diamonds in the rough. 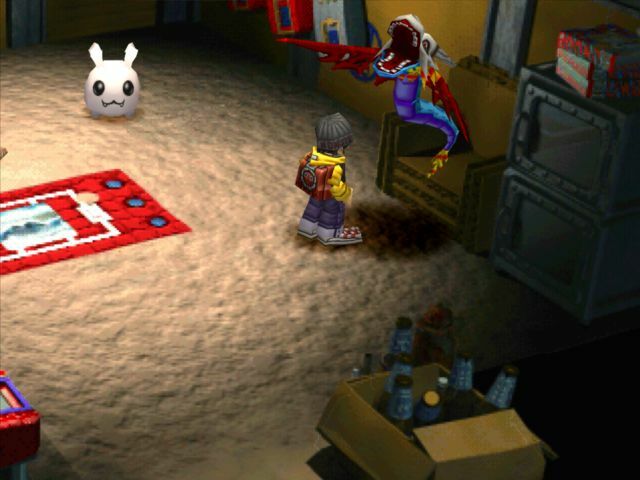 There are a couple examples, past and present, of games that might serve for a theoretical Digimon World Championships. Digimon Universe Appli Monsters: Cyber Arena is an upcoming 3DS entry in the franchise that's built around the entire concept of multiplayer, with the early downloadable version featuring the PVP and the later physical release comprising the full story. 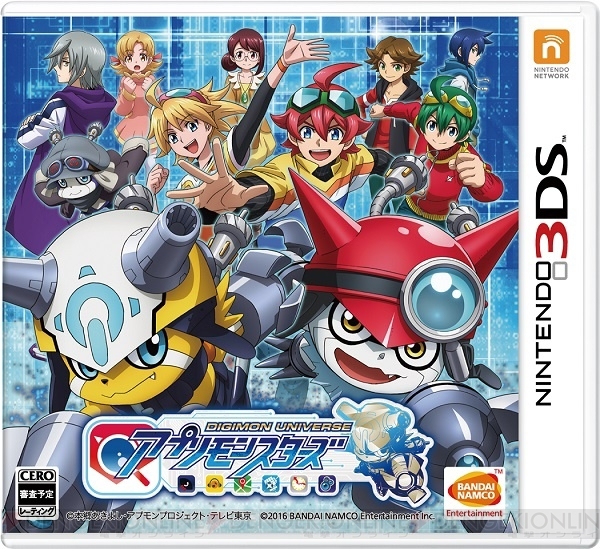 This game actually centers on one-on-one combat, with tamers battling using a single Appmon at a time and supporting it by equipping other Appmon from their deck to borrow their abilities. Gatchmon and Cameramon face off. 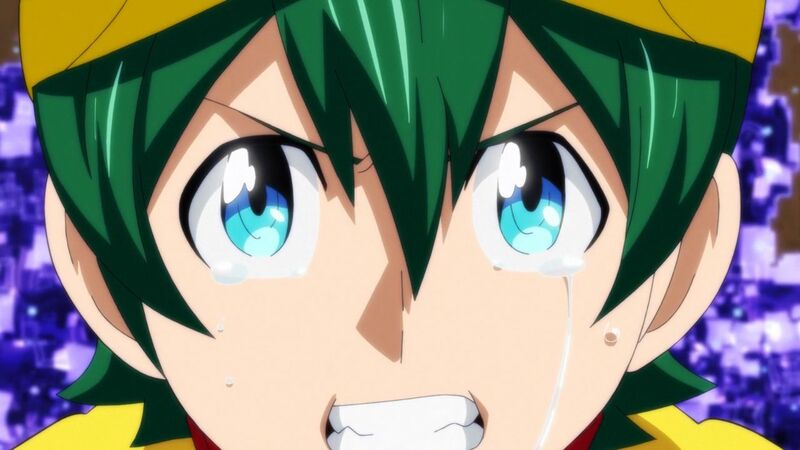 Moreover, the Appmon series as a whole is a hard sell to the core Digimon fanbase, which is infamous for being unreceptive to change; this is the same fandom that successively decried Tamers, Frontier, Savers, and Xros Wars. 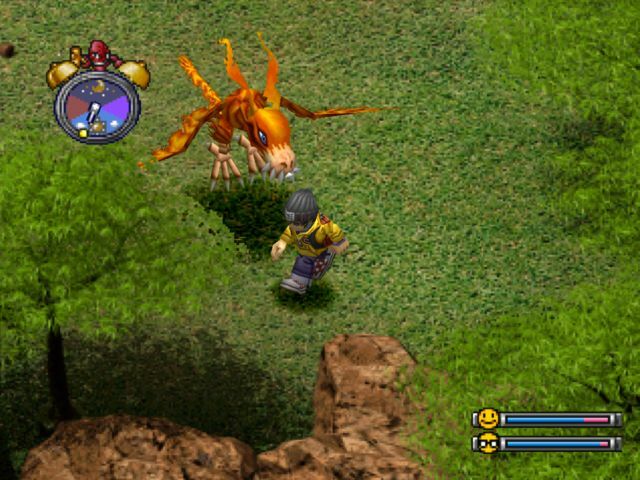 It took years for fans to grow into Tamers, and only since 2014 has Frontier begun to see serious appreciation. (Meanwhile, fans still have to be careful about where and how loudly they praise Savers or Xros.) 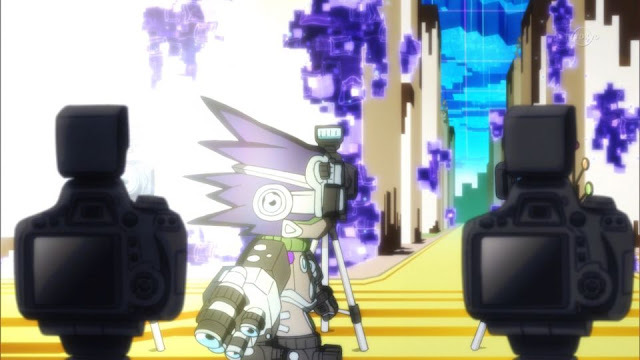 The new game also hasn't shown any signs of containing "traditional" Digimon, focusing on the Appmon subspecies that arise from smartphone applications. 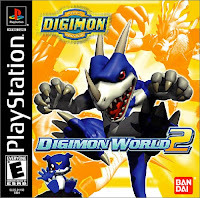 If a large audience refuses to embrace it, then even if Cyber Arena were the best Digimon game ever, it wouldn't be viable for a World Championships series. Competition requires positive reception. 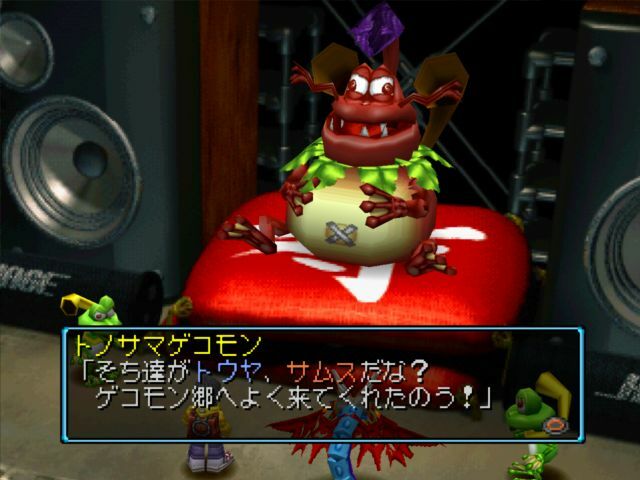 As mentioned above, Re:Digitize and Decode are both viable multiplayer games, moreso now that we have Rommstar's fan translation of the former and tools for playing online in an emulator. (An international release for Decode would greatly simplify things, as the 3DS game has built-in online play in addition to the local wireless features of Re:Digitize.) 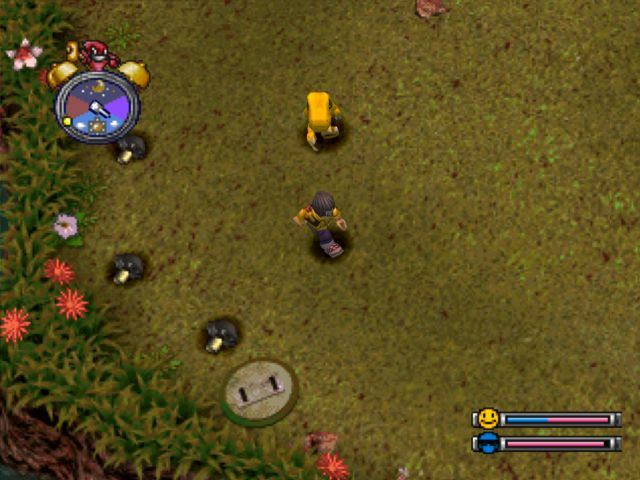 Digimon World is also a surprisingly well-designed game with its 99-second timer and real-time combat, but it has even less diversity with a definitive "tier 1" set of Digimon. (Heracle Kabuterimon, Coelamon, and most things with Ice Statue.) Online play is possible via Kaillera used in conjunction with ePSXe. The game is not available on PSOne Classics, which means the only way to host physical tournaments is via physical disks running on one of the first three PlayStation consoles. There are methods to import ePSXe save data to PS3 via USB drives, which makes it easy to transition playing at a desktop or laptop to a tournament scene. And unlike every other game listed here, World has a strong cult following and quite a bit of mainstream exposure. Since stats gained from Jogress can decrease if not paired with a Digimon of comparable stats to the base Digimon, and with a cap of 999 on every stat, creating a fully competitive team with perfect stats is incredibly time consuming and probably not something that can be done in a human lifetime. There is one particular tempting alternative. 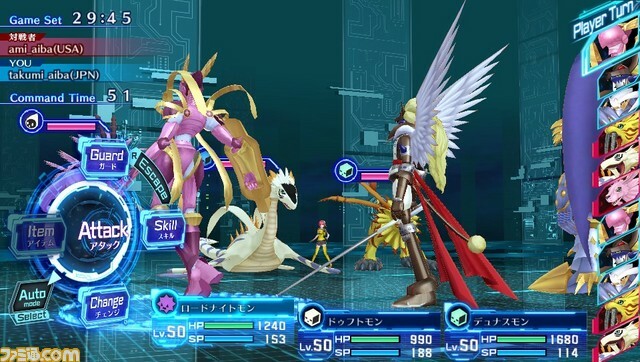 Digimon Linkz in general is a watered-down port of Cyber Sleuth for smartphones--it features a handful of graphical enhancements, but the battle system has been greatly simplified to accommodate the platform and interface. Traditional handheld gaming like the kind seen in VGC isn't "dying" per se (2017 is allegedly set for $250,000 prize pools at every major event) but represents a larger investment to players compared to smartphones, which are virtually essential to the workplace. Most potential players already have the platform Linkz is on, which is what makes it attractive. 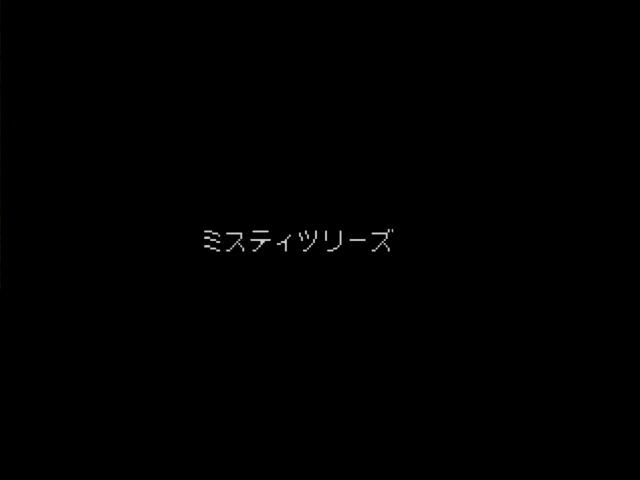 As with Re:Digitize and Cyber Arena, the game isn't yet available in English, and no localization has been announced. The last two of these are still questionable choices because of the difficulties of the platforms being discussed. 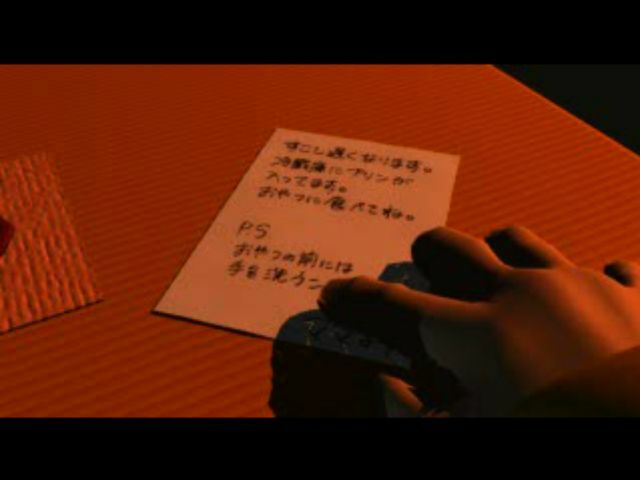 If Re:Digitize or Decode were localized, or World were available as a PSOne Classic, it would be another story. But Cyber Arena is the game with the greatest potential install base and arguably the most important game for Bandai to localize at this point in the brand's life--pending that, Cyber Sleuth is still the most accessible game on the list. 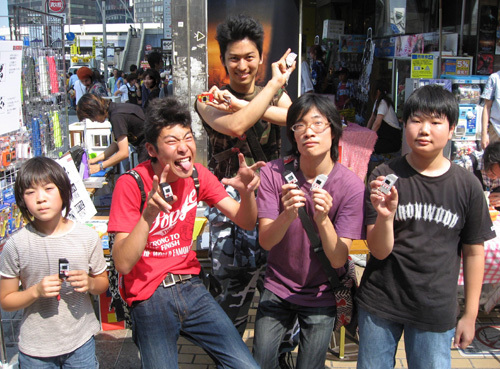 Four boys and Digimon mascot character "Commander Yu" after a weekly Digimon tournament at a toy shop c. 2007. So how does one go about organizing such an event series? 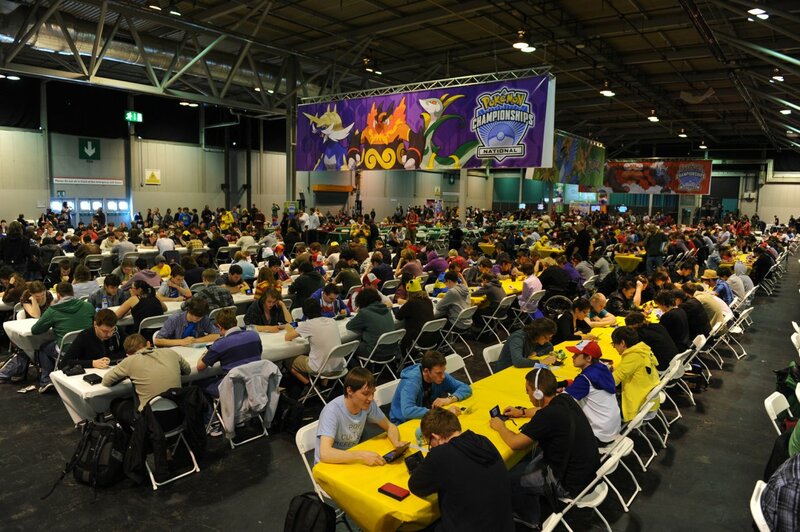 The Pokémon World Championships work because they're sponsored by a massive multinational company with the resources available to invest in multiple large prize payouts. Pokémon is deeply integrated into world culture and is the second-bestselling game franchise of all time after Mario. 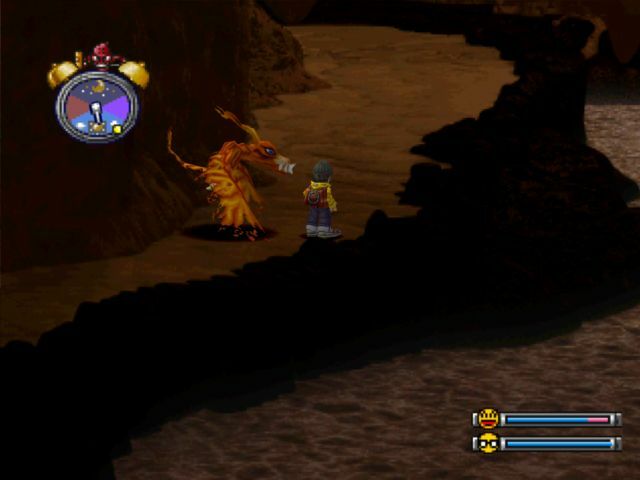 Obviously, Digimon has a lot fewer resources to work with--the franchise has been on hard times more or less continuously since 2002, it has low recognition outside of a narrow section of Millennial viewers, and it doesn't have the constant growth that Pokémon's been experiencing post-gen V.
However, having both observed and assisted just such a scene emerge for the (then no-name) Cardfight!! Vanguard TCG, I can attest to the fact that a championship series is possible. It took Vanguard approximately four years to make the transition from grassroots play to paid professional competition. The bulk of that growth took place in 2015, under Altered Reality Games' supervision--a third party unaffiliated with Vanguard's parent company, which worked in coalition with the player community to organize a proper national championship series with cash payout. Commander Yu leads the Liberation/Revolution Battle, the final D-1 GP tournament, c. December 2007. ARG didn't lose money on the events, but they also didn't turn a profit on them. I had the opportunity to speak with their CEO, Jim McMahan, several times prior to retiring from writing for Cardfight Pro. As McMahan explained it to me, anybody could have done what they were doing. As long as you run the numbers right on entry fees (which were usually never more than $20 per player) and manage an effective social media campaign over Facebook and Twitter, you can rent out some incredible spaces for hosting events while still breaking even. When run correctly, the events pay for themselves, and the key struggle is getting players to participate. These types of competitions promote a special part of fan culture, and the experience of being able to play with a large collection of like-minded individuals is what keeps drawing the players to attend even when it's not always convenient. As a business, it makes sense for ARG to support such events because it eventually goes back to them getting more traffic to sell trading cards and merchandise like card sleeves and playmats. Such a sponsor would be hard to find for a video game series with no associated merchandise, but the success of finding sponsorship for Smash Bros. and other games suggests it's possible. 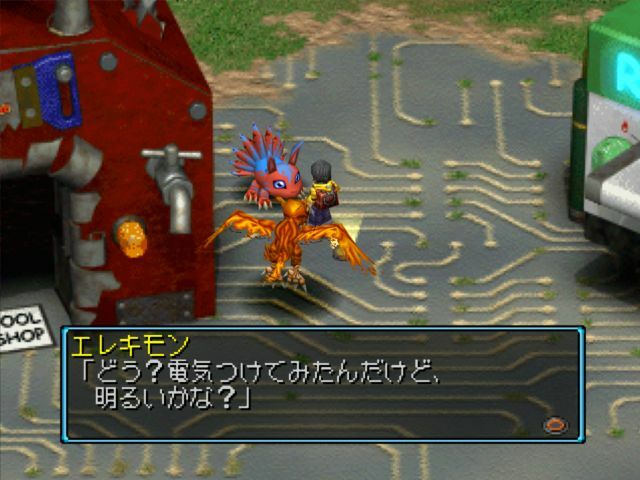 Restoring Digimon to its former glory is a long road filled with challenges. 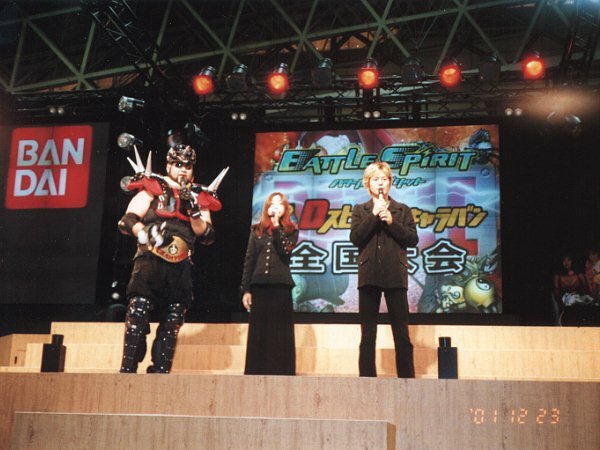 In this photo taken December 23rd, 2001, Volcano Oota and his co-hosts lead day 2 of the D-Array Grand Prix finals & Battle Spirit Caravan at Jump Festa 2002. The key at this moment would be to do community organizing and grow a large number of scenes within local gaming communities to the point where they could no longer be ignored. Fan-organized events like the Pound series and early Apex tournaments were instrumental to the growth of Smash. Video streaming was an integral part of these events' exposure to the general public and the "mainstreaming" of competitive events into spectator sports. If a grassroots effort can help cultivate a large receptive audience that is too profitable not to pursue, then Bandai will be put in a position to directly cater to that audience, and sponsors will have an incentive to support the events to expand their products' visibility. 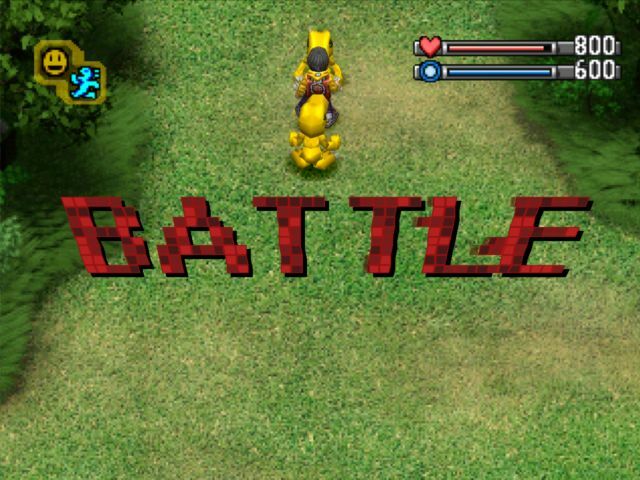 For Digimon to reach the same eSports potential as Pokémon, it needs a strong centralized community put in constant communication with one another, numerous regularly-held locals that can contribute to the cultivation of a skilled playerbase, and large events exposed to the general population. 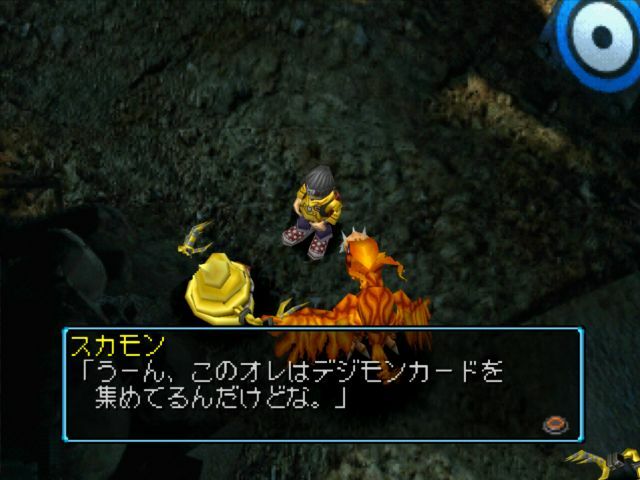 At the onset, every player would be a kind of ambassador for Digimon, responsible for quickly bringing in new membership. We can have a Digimon World Championship series, but it's a long road to walk. While Digimon hasn't been in direct competition with Pokémon since 2002, the overnight success of Pokémon Go undoubtedly dealt a decisive blow to the brand. Pokémon was popular before, but its sheer visibility now guarantees that newcomers will always view Digimon as a rip-off. Overcoming that image on top of everything above is a daunting task. A name means everything, and on that front the title Digimon isn't doing us any favors. 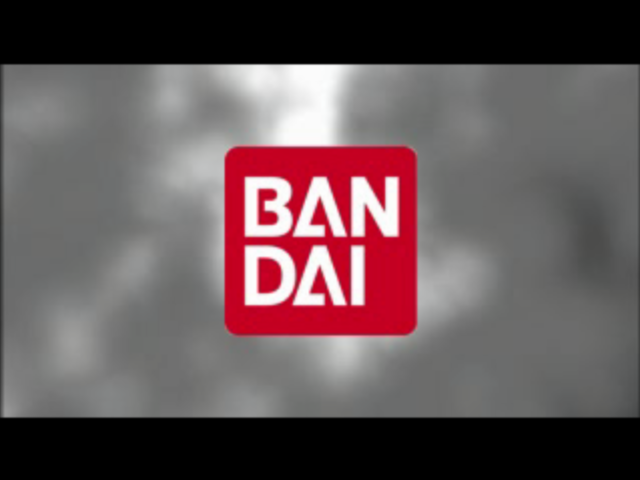 The Appli Monsters rebranding may actually be one of Bandai's smarter moves. 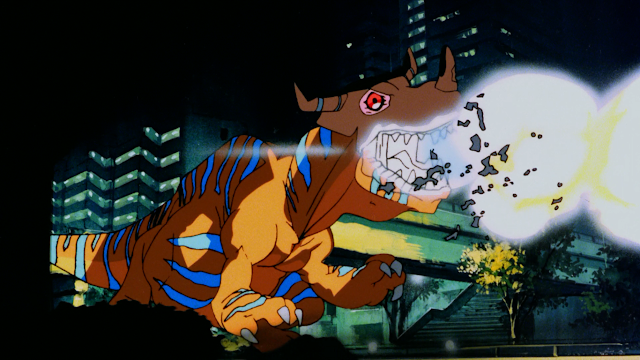 It's the same idea--the nebulous differences between a program and an application ensure that "Digital Monsters" versus "Application Monsters" are functionally similar terminology--but the new name is an invaluable weapon against Digimon's public image. 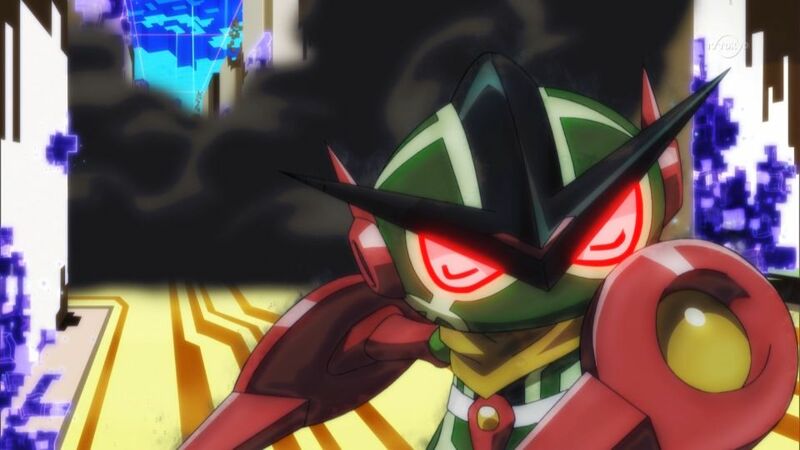 The new series isn't actually called Appmon, and for good reason. 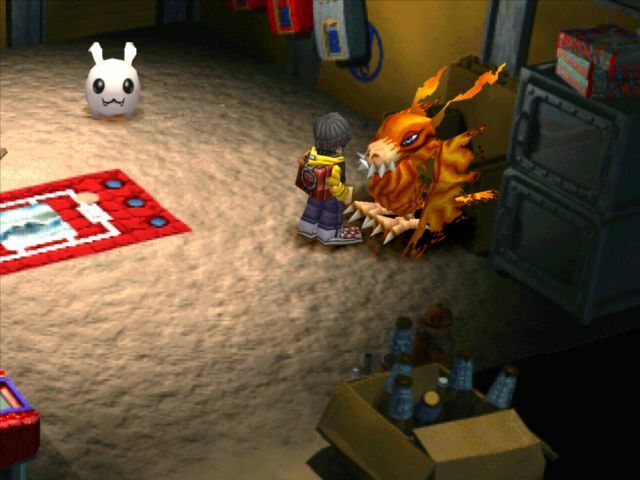 To move forward at all, Digimon has to overcome the initial impression that its title brings. It makes Cyber Arena all the more appealing as a potential basis for a large-scale competition. I wouldn't sit around waiting for it to arrive though; if we're to have a DWC at all, it would make more sense to lay the groundwork for it now with Cyber Sleuth or another game so that Arena could hit the ground running. 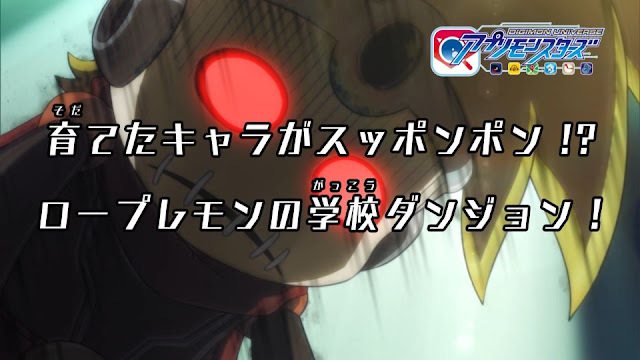 On July 31st, the Appmon joint project published its region-locked second preview video for the upcoming anime Digimon Universe: Appli Monsters. 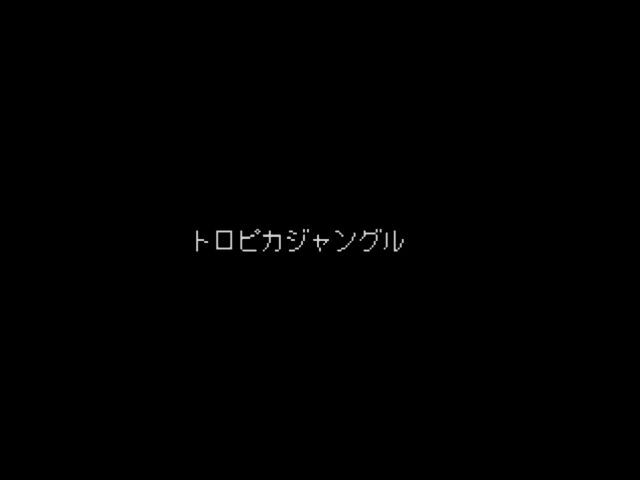 The latest entry in the Digimon franchise will begin airing weekly on TV Tokyo October 1st, 2016, at 7:00 AM every Saturday. It will be the earliest half-hour anime in TV Tokyo's children's block, accompanied by the biggest toyline and game series Digimon has seen since its Frontier days. 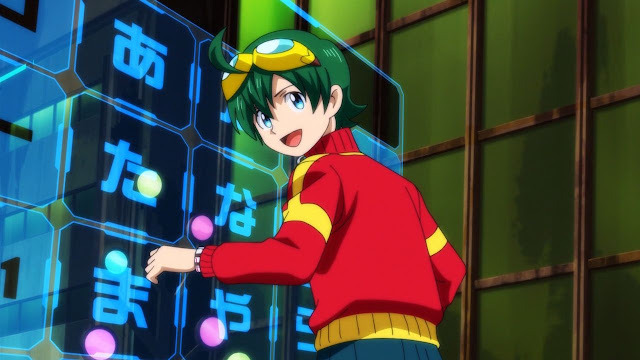 Rather than being "tamers," "Chosen Children," or "generals," the new generation of Digimon protagonists are called Applidrivers. 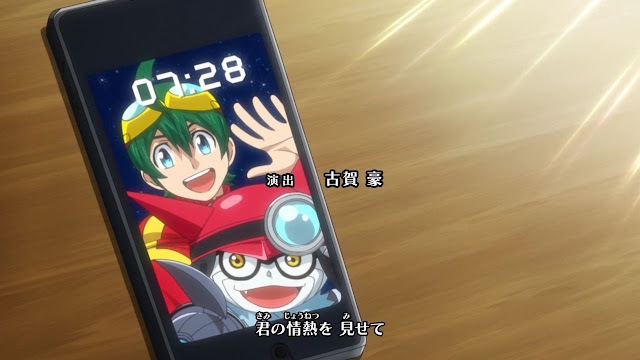 The second video introduces the anime's core four human characters and their Buddy Appmon, using text messages between the Applidrivers and their Appmon as a framing device. In order we meet Shinkai Haru and Gatchmon, Karan Eri and Dokamon, Asuka "Astra" Torajirou and Musimon, and finally Katsura Rei and Hackmon. 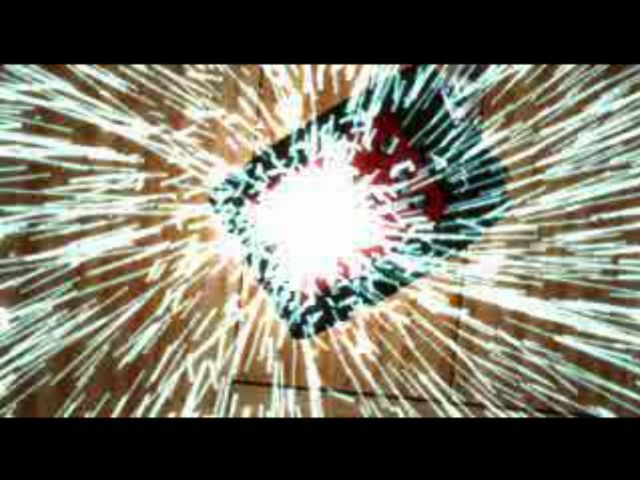 Tamer Union's subtitled version of the video is provided via an independent host above. The links given below are eBay affiliate links. These are hyperlinks which redirect the reader to products on eBay; if a reader accesses one of these listings through one of the links below, and/or purchases the item listed, the editor is provided a referral fee and/or commission fee. 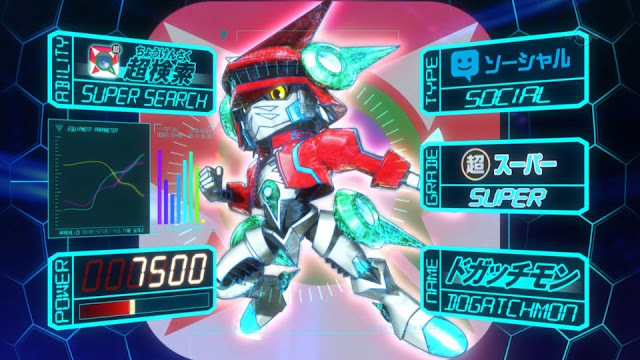 Preorders have been open for Appmon's toylines since early July, with the Appli Drive getting special attention. Taiwanese seller matrix-king is still taking preorders for the Appli Drive SP Set --comprising the Appli Drive, Appmon Band, three R-rarity chips and a Premium Rare Scopemon--for $83.98. The overall markup on this listing is around $20 from base price. The same seller is also selling a set of three Appli Drive Pair Ring covers together for $44.98. These include the blue Dokamon ring, orange Musimon ring, and black Hackmon ring. 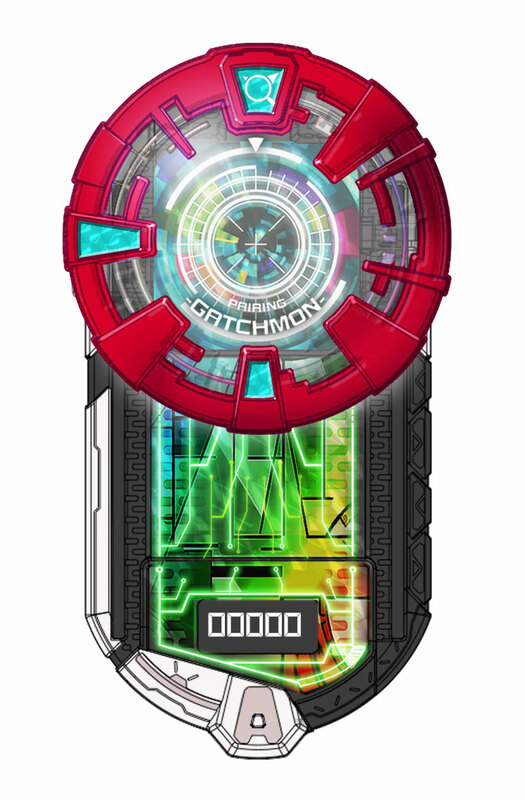 Introduced in lieu of alternate Digivice designs, the covers allow tamers to add a degree of personalization to their Drives, and come with additional Appmon Chips. Japanese seller okinawam1978 currently has the Pair Ring Cover Special Set listed at a total $47. 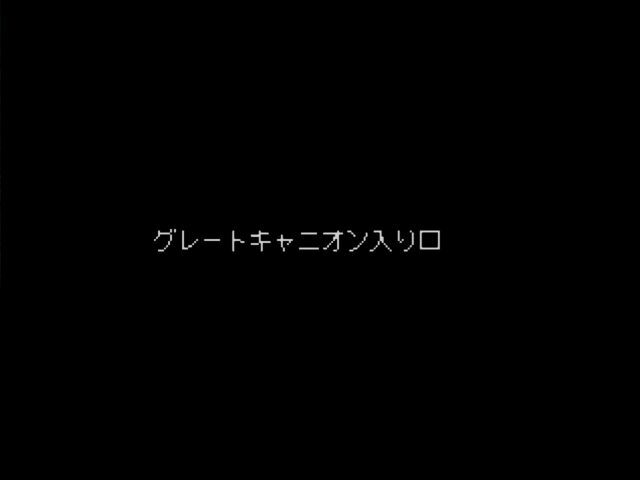 Odaiba Day Special - Let's Re:Translate Digimon World! About eight months back I said that there would come a time when Bandai and Toei would try their hands at airing another weekly Digimon anime. I also said that we would be ready for their pass. That time has come, and I don't feel ready. When I look at this fandom, it doesn't feel ready either. It feels more like Yagami Taichi kicked us the ball and that it hit us right in the face. Appmon isn't the first blow. Digimon World -next 0rder- on the Vita was one of the biggest disappointments of 2016, while the first two chapters of Adventure tri. predictably split the fanbase over everything from character designs, to best dubbing practices, and the continued existence of 02. The sudden deaths of four singers and actors in the past six months has devastated this community--and put many on edge on top of our grief. This Odaiba Day is the sixteenth since 02 formalized the observance, but the occasion remains mired by uncertainty and even infighting. Though I try my best, I'm not above being affected by the push and pull that's going across the net right now. It's not a secret that I can exactly keep, it's plastered all over my site's sporadic calendar! I've lost sight of my reason. What was it that drove me to start a site like Tamer Union and try to--perhaps naively--unite the disparate forces making up the Digimon fandom? Why did I want to do this? 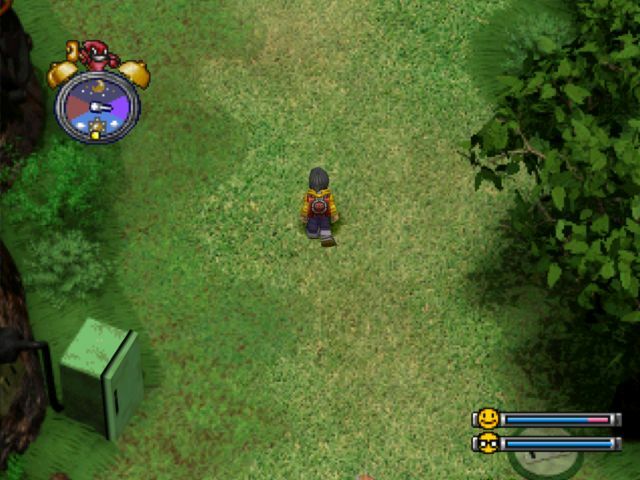 At a time like this, my recourse is to turn back to the game that first drew me to Digimon. Video games are a kind of mirror, in that unlike books or films, the viewer's actions are reflected on them as they "read" it. And unlike a sport, the presence of a player character causes those actions to be observable in the third person. In that sense, we learn more about ourselves by playing a game. Last Christmas I was gifted two games, Xenoblade Chronicles X and Digimon World. Only one of those games carried winter break for me, and the other sat on a shelf. It was my first time owning World instead of having to play it at a friend's house or on an emulator, and there was something incredibly special about that time I spent with it. On June 26th, 2016, the 19th anniversary of the franchise came to pass. 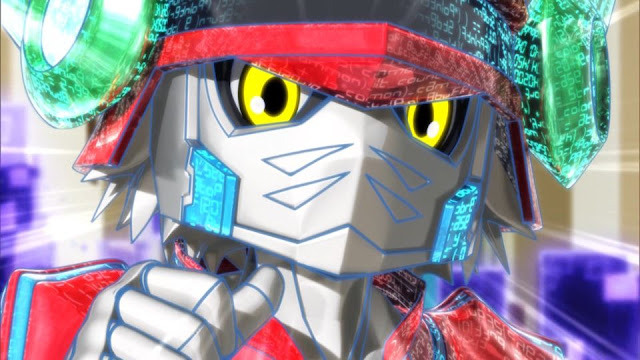 We're looking toward the 20th, wondering where Appmon will have taken us by next year. We've already averted the fate of less fortunate franchises like Virtual On or Boktai, but nobody really knows where Mr. Hongo's Wild Ride is headed. Perhaps another dive into the Digital World can assuage that uncertainty. I'm going to do what I originally intended to: play. 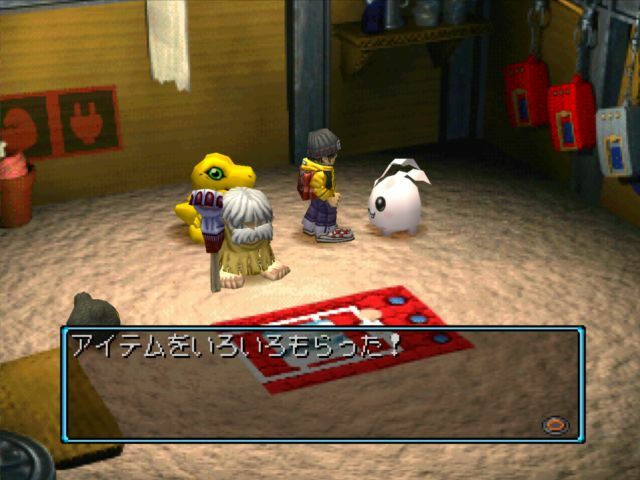 Digimon got its start with the Digital Monster virtual pet. That pet was an overnight success that rode on Bandai's recent Tamagotchi boom, forming lines in major Japanese department stores like Sogo, and Digimon became a core structure in Bandai's markets for several years while its other major brands were at critical weakpoints. 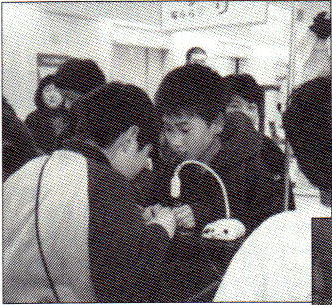 Two boys battle their Digimon Pendulums in a toy shop, c. 2000. 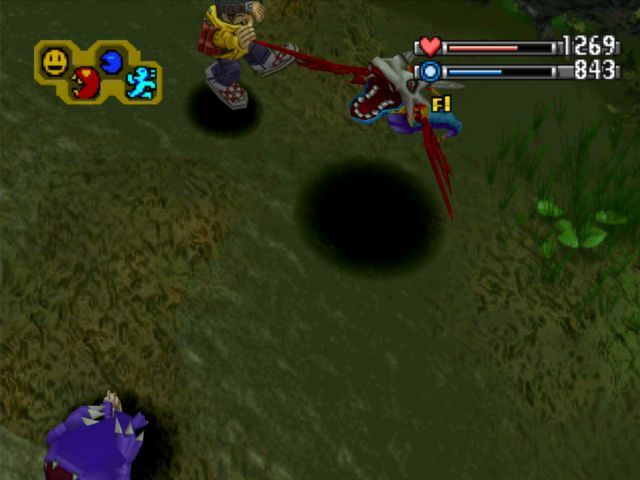 The Digital Monster pets were followed by the even bigger Pendulum series, which ramped up the depth of gameplay, number of Digimon available, and the complexity of its lore long before any anime series would come along to expand the franchise. 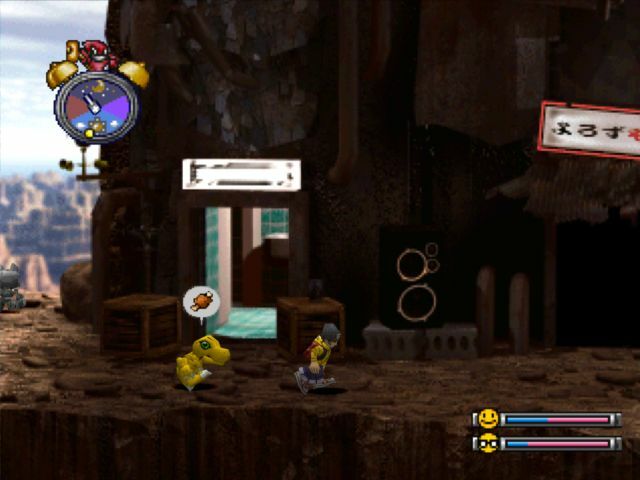 In January of 1999, the gameplay of those virtual pets was immortalized in Digimon World, which also went on to become the first Digimon game localized internationally. I'm celebrating the coming anniversary and this Odaiba Day by giving World the translation it deserves. 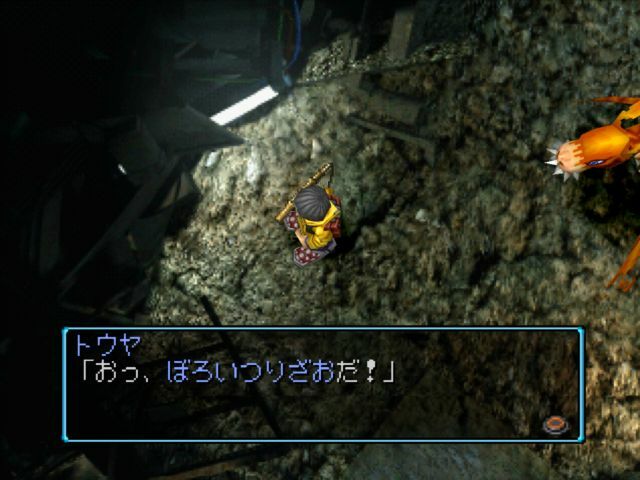 The game's English localization is a mess of poor translation, bad grammar, and numerous bugs. That's all in contrast to the gameplay, which is the most solid the series has ever had. 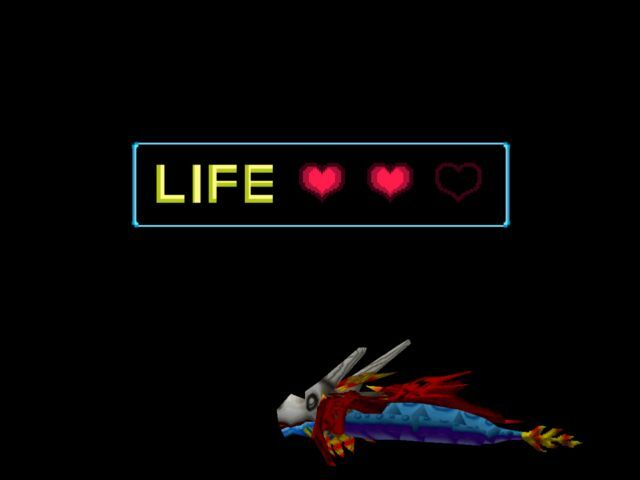 Load times are short, adventure is paramount, and Digimon World never tries to sit you down and ask you the meaning of life. At a time when games were getting increasingly cinematic, World decided that kids really just wanted to explore and have fun. Raised a completely different Adult than what the starter choices are supposed to allow. Solved a puzzle that has never been solved before. And this is only a fraction of what we'll inevitably end up covering. I'll be playing both the NTSC English and Japanese versions of Digimon World simultaneously, but gameplay will primarily be from the Japanese game. I'm doing this is to keep the English dialogue fresh in my mind for comparison. 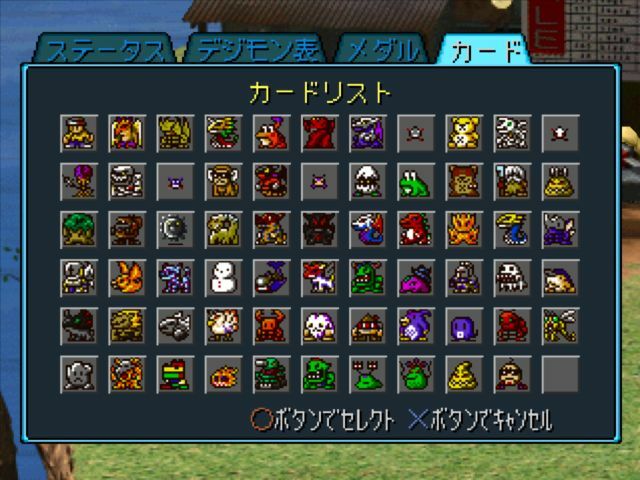 In the Japanese game I'm going for a 100% Legend run that maxes out Tamer Rank, completely fills out the evolution chart, and unlocks every medal. I'm no stranger to doing such a run, as I've come within a few hours of completing one on my actual memory card. For the soundtrack samples, I'll be providing a look into the game's remastered Ver. Neo soundtrack, which was included as a free download with Japanese editions of Digimon World -next 0rder- earlier this year. The identity of whoever remastered Yamada Kouji and Ishii Yuuko's OST is unclear--the original artists may well have come back for it--but the resulting music preserves the alternating punk and atmospheric sound of the original game in much higher quality. Unfortunately, not every track is found on this OST, as it's a remaster of an already-incomplete soundtrack. 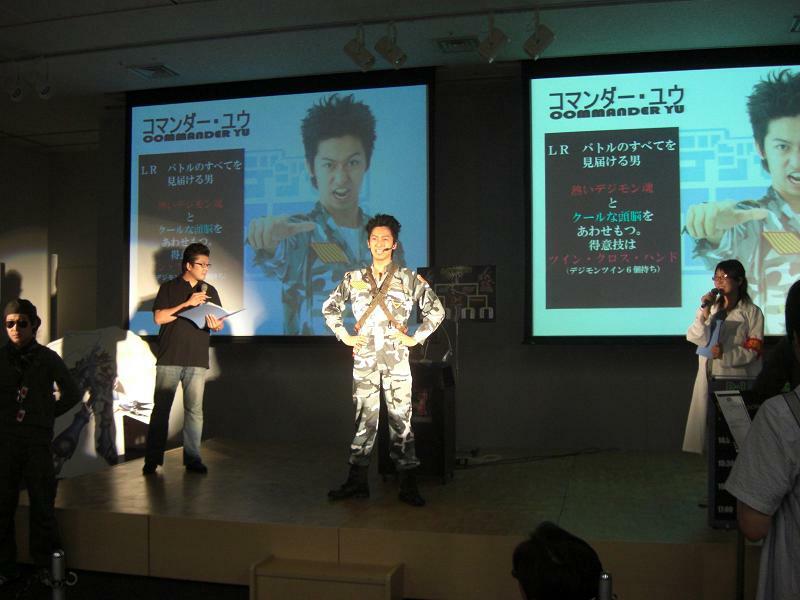 The remaining samples have never been officially available, and are sourced straight from the game disc. 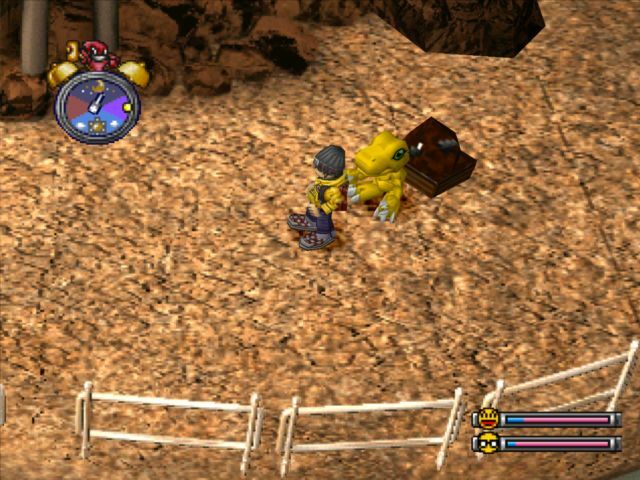 For those that want to play along, it's strongly recommended that you make use of the various guides available on the net when it comes to raising your Digimon, as this game is notoriously esoteric. I personally recommend studying this document made by MechaBread and Orange Fluffy Sheep back in 2011, as they were responsible for several major breakthroughs in our current understanding of the game. Neve's and Alitheiaa's evolution guides are also based on this information, which was originally put together when OFS was unable to determine the requirements for Herakle Kabuterimon during his second LP of the game. Joining me for this playthrough will be my Digimon partner, Samus. She will be paving a path of violence through File Island while I sit back and yell at her to shoot ice beams harder. So here goes. 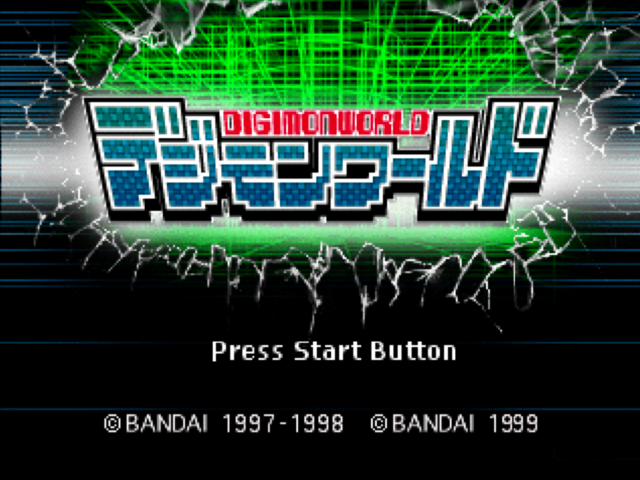 My ultimate playthrough of Digimon World. 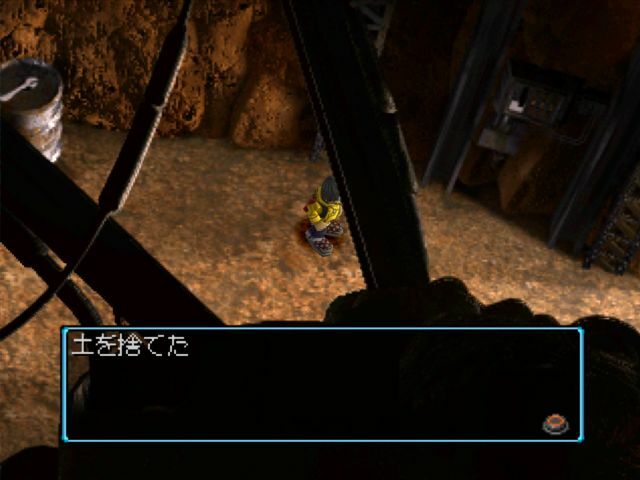 Digimon World has a handful of grainy prerendered cutscenes, which may as well have been in Sony's requirements for PSX games considering how ubiquitous the technique was. Like other games of the time, these clips were mined for screenshots to reuse on World's cover, commercials, and posters, but the quality is actually less than we should expect for the era. 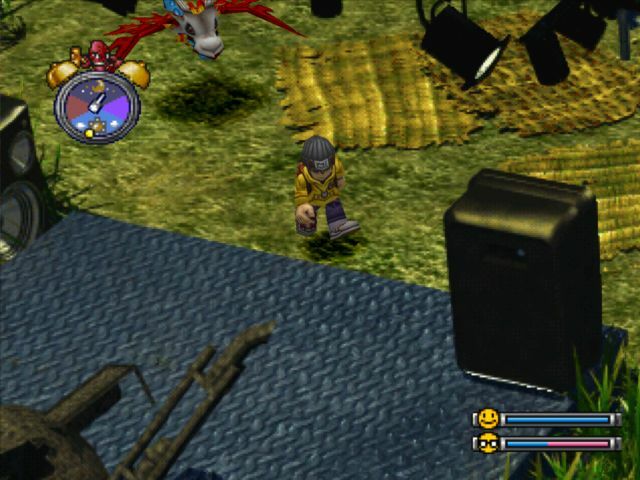 This was the same year that Final Fantasy VIII, Chrono Cross, Legacy of Kain: Soul Reaver, and Legend of Dragoon were all bringing cinematic effects to the forefront of the PlayStation experience, so critics on both sides of the Pacific were naturally unimpressed with what World had to offer graphically. 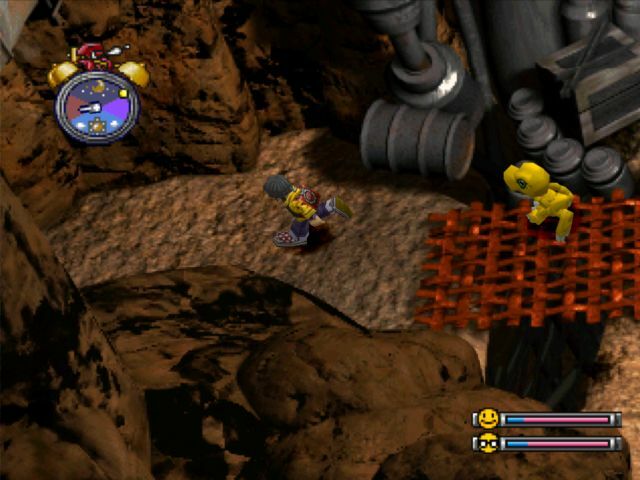 As a whole, the game is frontended with a lot of cutscenes and dialogue while the main game has far less of it, which isn't unusual for the period. Even then, World has a lot fewer of these than its contemporaries, and these FMVs can all be skipped with the start button. Start-to-save is only a few minutes if you hurry. The real world sequences are set in Tokyo, which you can just barely make out from the writing on the screen. Kids: My Metal Greymon's the best after all! I'll battle your Metal Mamemon next! Despite being exposed to a lot of Japanese brands when I was younger, I never thought twice about any of the urban landscapes I was seeing. Maybe it was the combination of cramped urban conditions and being on the seaside, but Tokyo in the late 90s-early 00s didn't look so different from the various parts of California I lived in. Kids: He evolved just today! Cool! 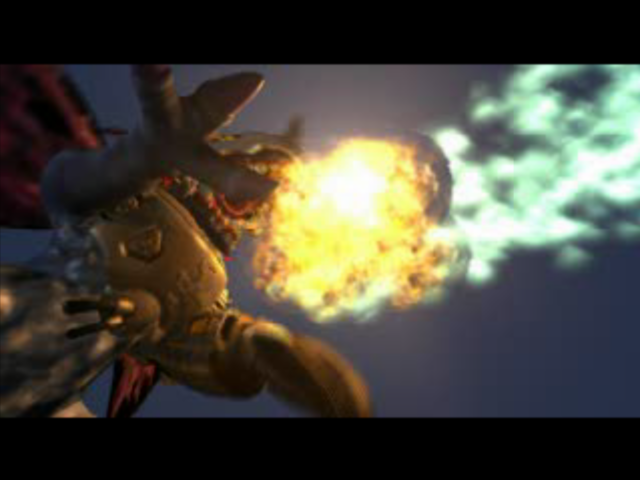 Do you think Metal Greymon will beat him too? It's useless, I'll stomp 'em in no time! 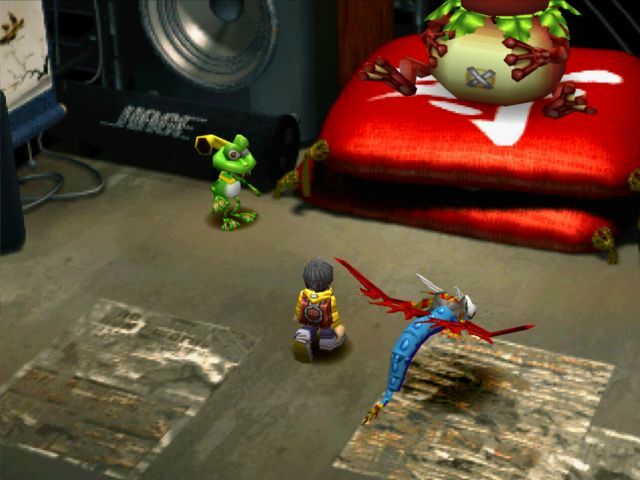 The virtual pets used in the opening are the same Digital Monster pets that launched nineteen years ago. These are Ver. 1s specifically, as those are the only versions to have Metal Greymon and Metal Mamemon. 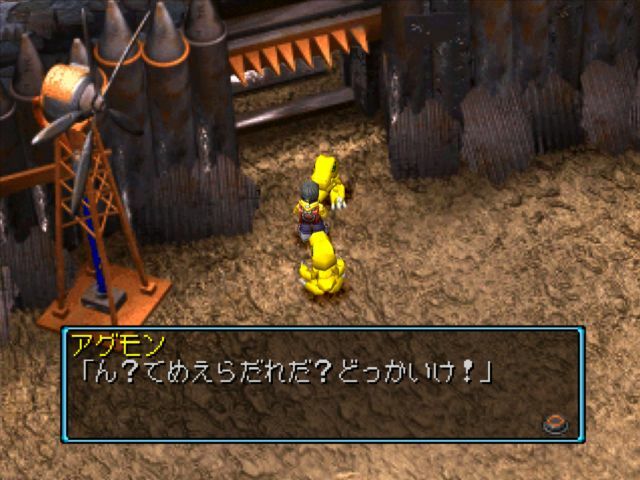 "Whoa, Metal Greymon and Metal Mamemon!" A bit of trivia, knowing that they're Ver. 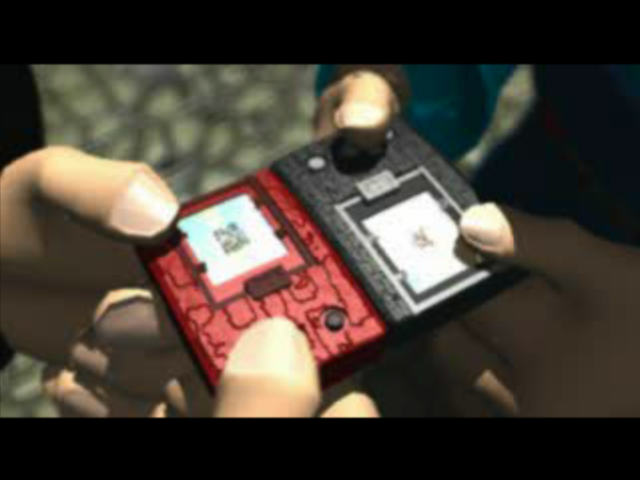 1s, the black virtual pet in this scene is an impossibility. The first version didn't come in black. 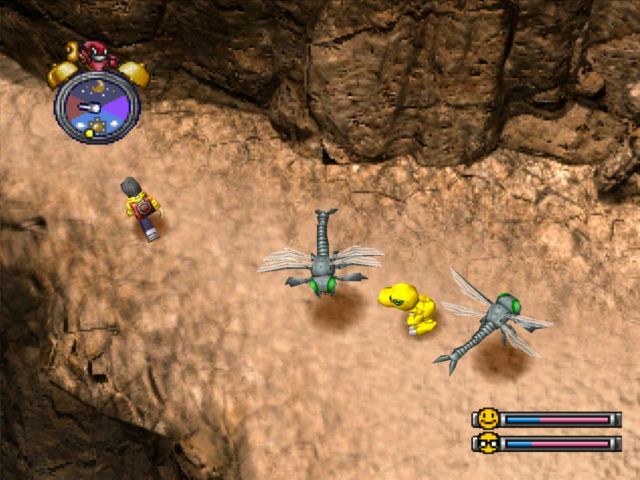 Later Digimon games brought in staff specifically to prevent this kind of thing by making sure that the products matched up with the real ones 1:1. 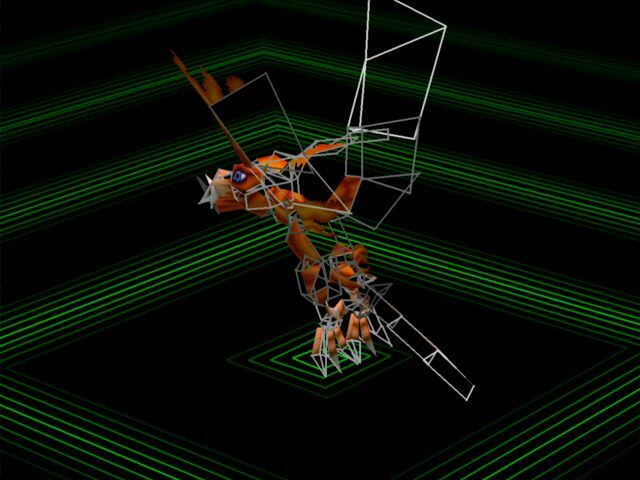 This paritcular digitizing sequence was reused in the first previews for Digimon World -next 0rder-. There was a lot more creative use of the first game's assets in -next 0rder-'s marketing than in -next 0rder- itself. The Viral Metal Greymon is somewhat infamous as World's mascot. American players had no idea why Metal Greymon was the "wrong color," but the orange Vaccine variant didn't exist at the time. 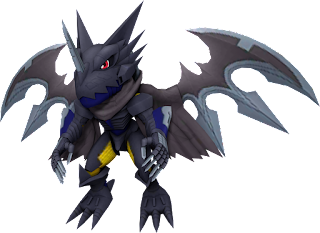 In virtual pet canon, all of the Metal Greymon on File Island are Viral--their bodies can't sustain their own cybernetic enhancements, and their flesh loses color, becoming blue. 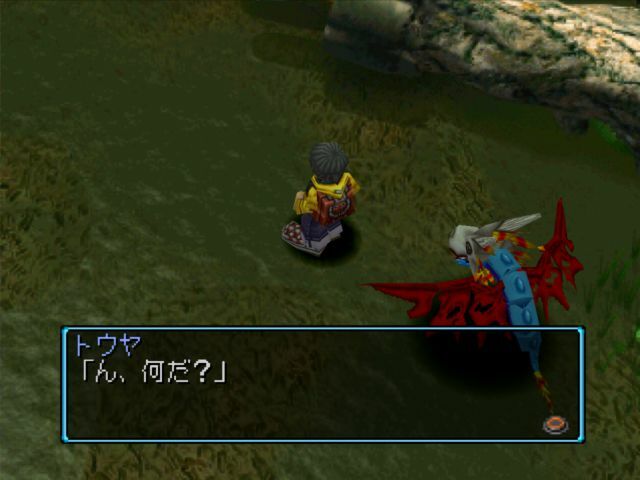 While Metal Greymon is the posterboy for World, this game and its sequels drop a few hints that the Mamemon line is the actual "face" of the series. Metal Grey is more its heel, though he gets a lot of love all the same. 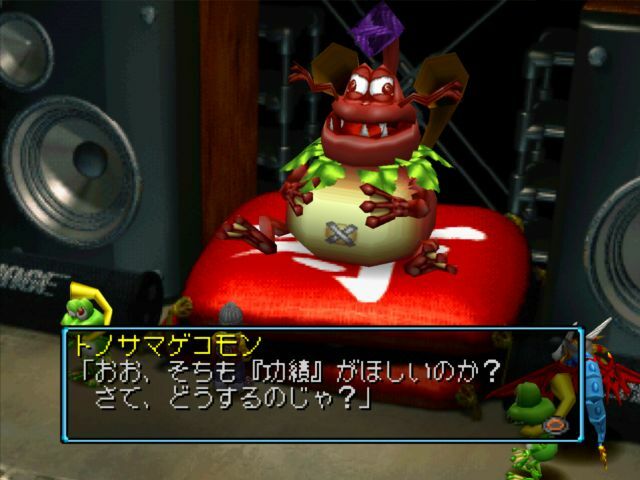 The rivalry between these two is a bit of an in-joke on the dev team's part, as in Digital Monster Ver. 1 they were the two "standard" Perfect-level Digimon. 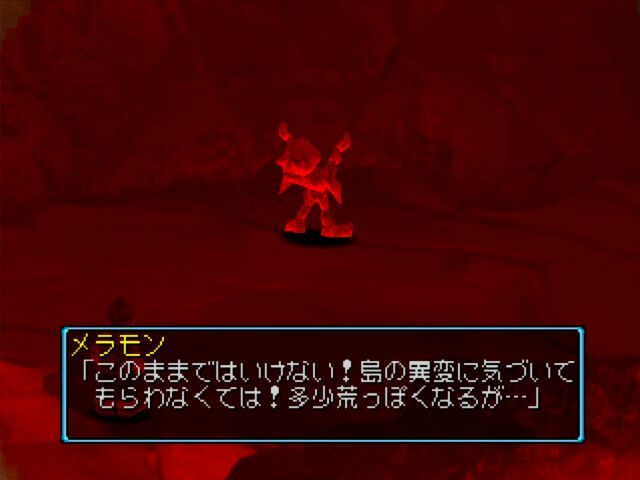 Metal Greymon was actually weaker than Mamemon; it had a cumulative 90% chance of winning versus any given Digimon, while Metal Mamemon had a cumulative 96% chance, and Greymon had a specific weakness to the metal bean. Both were weaker than the "secret character" Monzaemon, who clocked in at a 98% win ratio. But a lot of players unaware of the game mechanics still used Metal Greymon--the species has this inherent appeal to it. 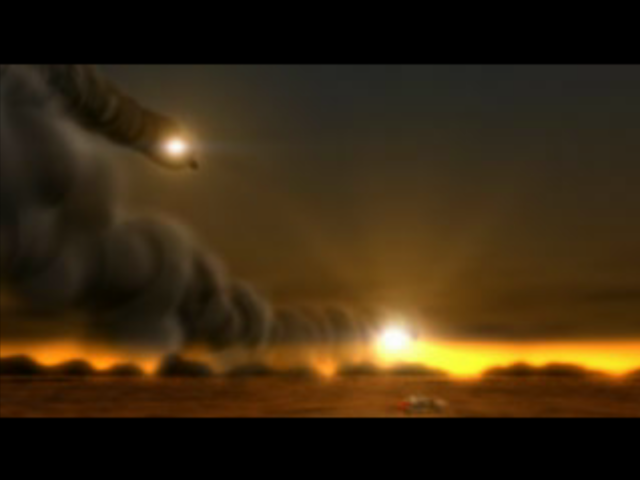 The end of the opening FMV is the only part that had to be redrawn in the English localization, due to the different characters used for the title. Other elements were "plastered over" with textures displaying English text. Jijimon: My name is Jijimon. This may be sudden, but won't you tell me a little about yourself? To begin with...do you have a Digital Monster? Uh-huh. Next question, then. Do you have a lot of friends? I see, I see. Ohh, that's right, I forgot to ask your name! 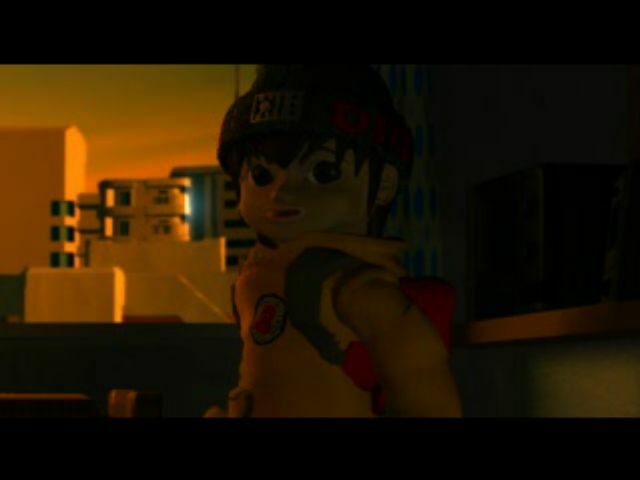 The protagonist has been unofficially called Hiro by the English-speaking fanbase for years, and Analog Boy by the Japanese fandom since at least 2010. -next 0rder- gives him a canon "nickname" but cops out of a real name. 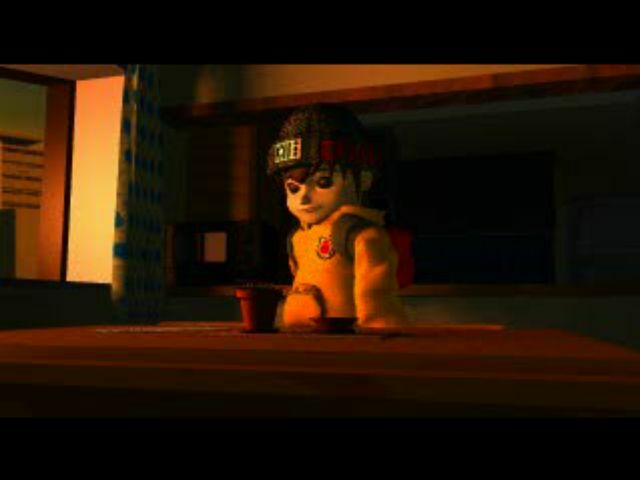 Like with many such protagonists, the intention is that players will project themselves onto the game world. Jijimon: You're Touya? Input the name of the Digimon you're raising. Samus' name comes from a joke about Angewomon. 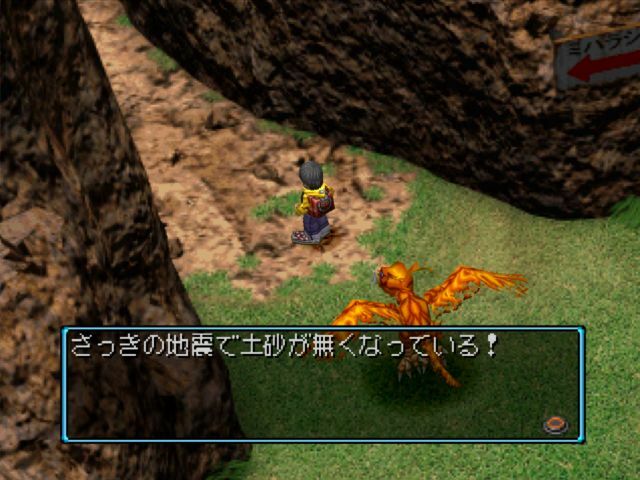 The protagonist is voiced by Takayama Minami, who went on to voice Kudou Taiki in Digimon Xros Wars. 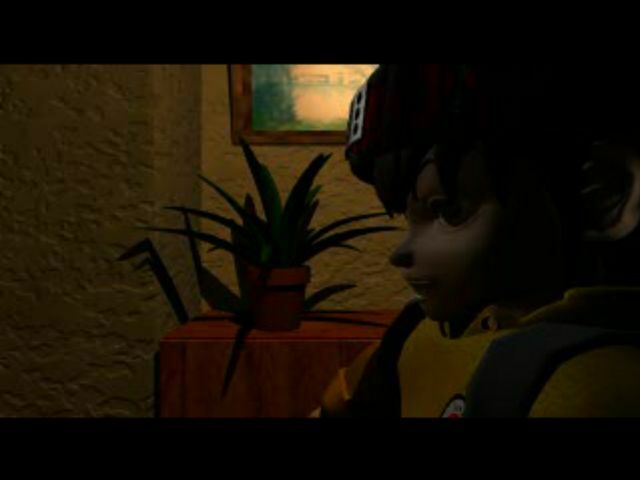 Her voice was only dubbed out by Mona Marshall in the opening and epilogue FMV, while in normal gameplay her lines were left intact. 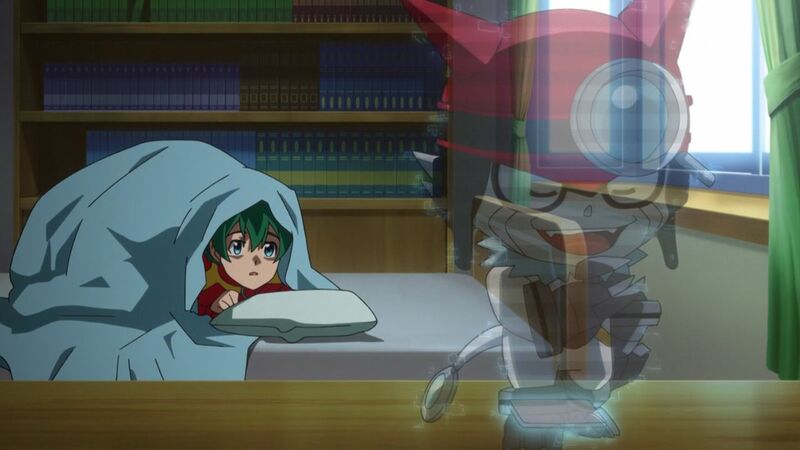 (The infamous "good afternoon" said when a Digimon goes to sleep is actually a misheard oyasumu "sleep well.") A whole lot more Digimon fans were exposed to Takayama's voice than anyone expected prior to Xros Wars. I'll be a little late. I put pudding in the refrigerator. Have it for an afternoon snack. P.S. Wash your hands before eating your snack. The "pudding" here is is specifically a custard pudding (プリン purin) whereas other types of pudding would be pudingu. (プディング) Giga Purin! This line is translated literally as "It's Digimon" in the English dub, but the voice direction is different. 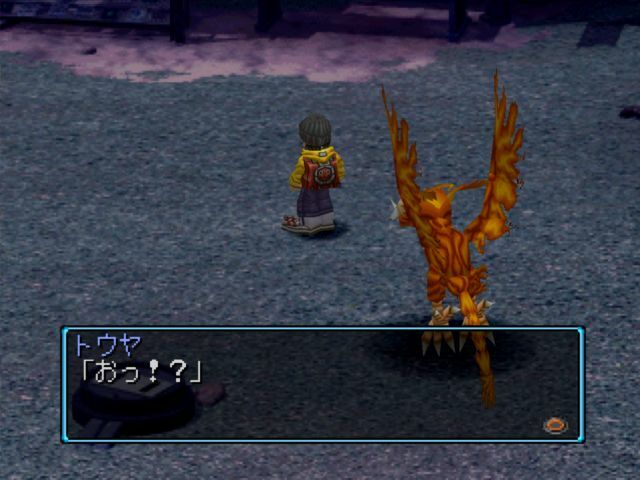 In Japanese it's intoned as a question, whereas in English it's turned into the (pretty goofy) exclamation "It's Digimon!" The Village of Beginnings was renamed File City in English, and the NTSC-U version has a strange glitch where the opening notes of When I Want to See You delay in gameplay. Jijimon: Hm...Has he awoken? It seems we were successful! 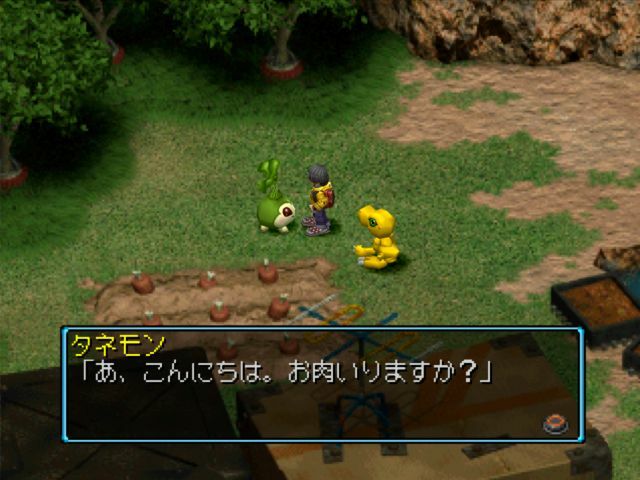 Poyomon: A human...It's just like Ji-chan said. 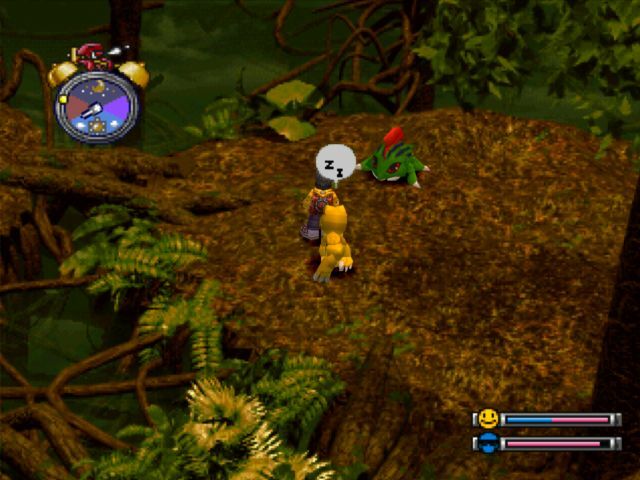 Jijimon: Shh, he's waking up! There are only four character models on screen here. 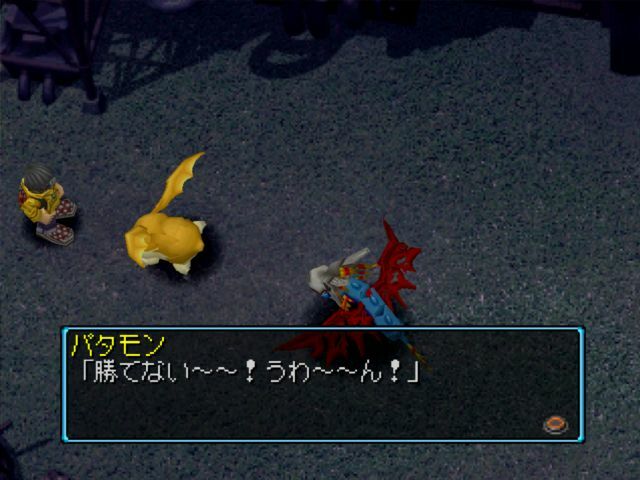 The remaining seven Digimon are textures. The PlayStation has problems whenever a lot of models are on screen at once, and for World in particular even five can cause slowdown. 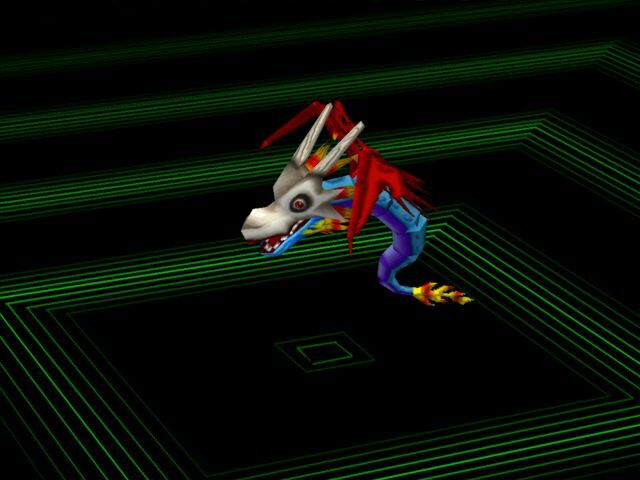 Jijimon: Welcome, to Digimon World! Touya: Where? Uwaaaa!!! Ehh? What? What? W-w-what the heck are you!? Jijimon: Hm? Don't you already know about Digimon...? Touya: Nn? Ahaha, I get it, so this is a dream? That's it, that's it. Tokomon: It's not a dream! It's the real thing! Touya: What are you saying? How do you know my name? And just who are you? 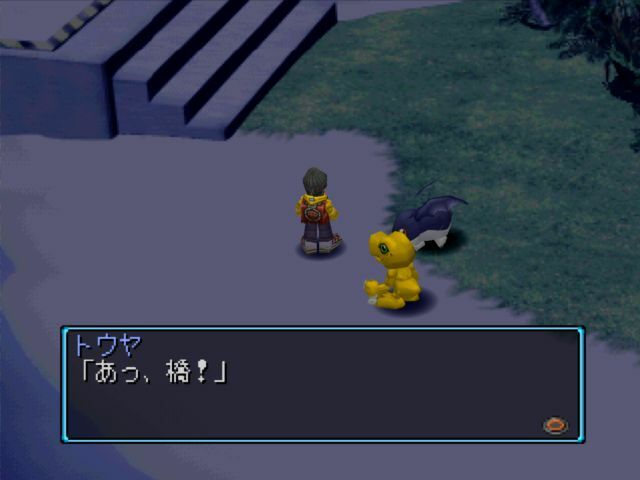 Touya: Ehh, so there's a Digimon like that? 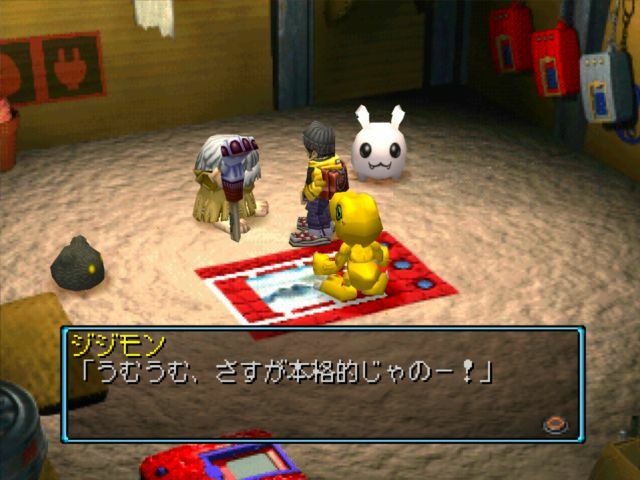 Jijimon: Hoho, there are more Digimon than just the ones you know of. 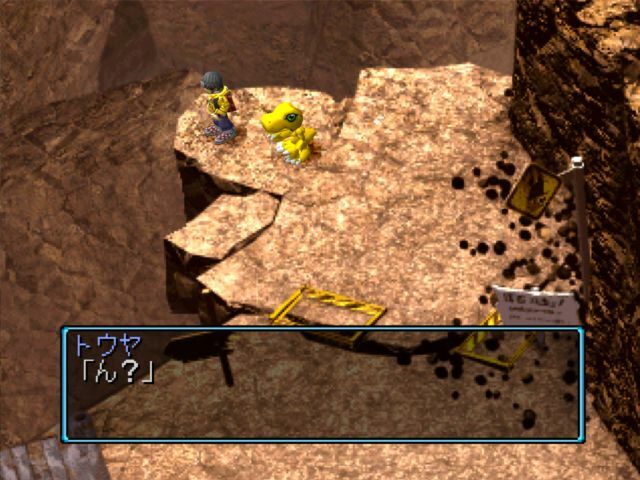 Anyhow, this is Digimon World. 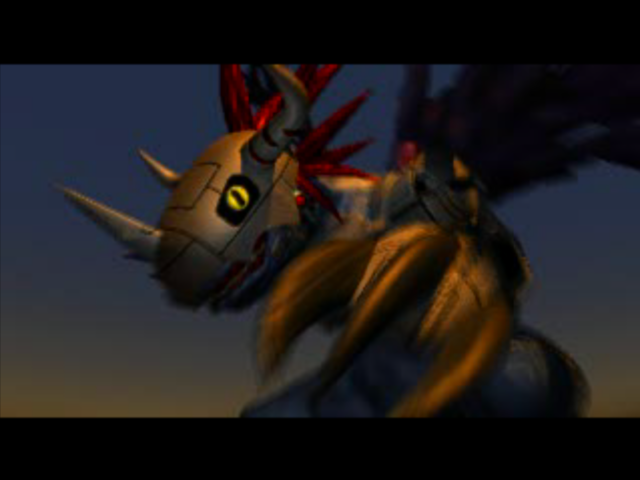 Jijimon: This world is not a dream nor reality, but the world of Digimon. Jijimon: Look behind you. This will be plain as day. Jijimon: That's right. You understand? Touya: I get it, but...why am I...here? Jijimon: Hm...Come into our house, and you'll understand. We'll continue this discussion there. 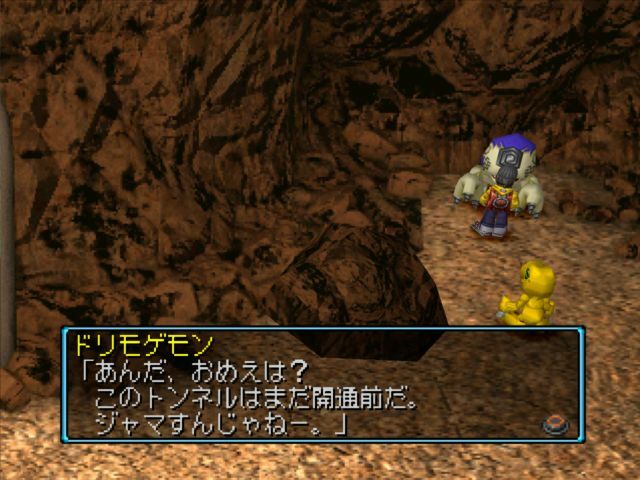 Depending on how you respond to Jijimon's questions, you start the game with either an Agumon or Gabumon. From Gabumon, the optimal route for completionist purposes is to evolve to Drimogemon > Metal Greymon and then mess with death evolution, and this was the route I was originally planning to follow. 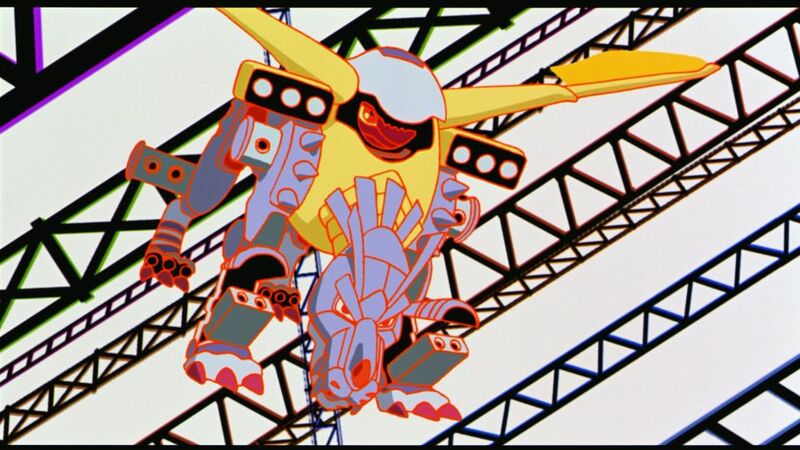 Agumon can go down the same route via Greymon, but I'm going to delay that a bit in favor of showing something else off, seeing as we won't get access to places where we can learn Metal Greymon's techniques for quite a while. Jijimon: Now then, let's continue. I am the one who called you here. This was for the sake of saving us. Touya: Save you??? What from? What's wrong here? Jijimon: The place we are at now, the "Village of Beginnings," lies at the center of the isle we call File Island. Touya: Village? Here? But it's really small, and broken up. 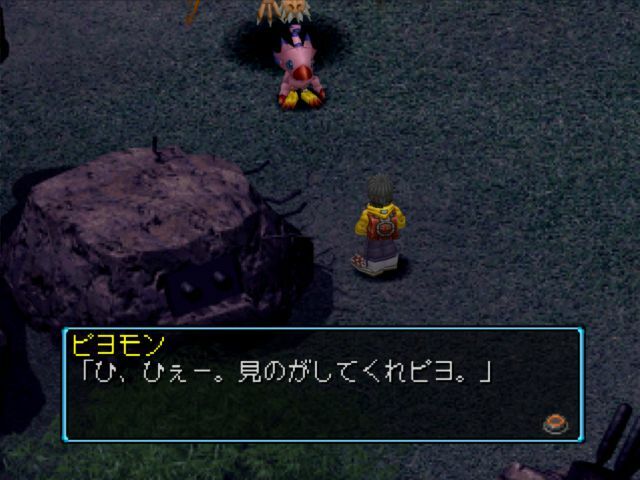 Jijimon: Hoho....Well, originally it was a village. 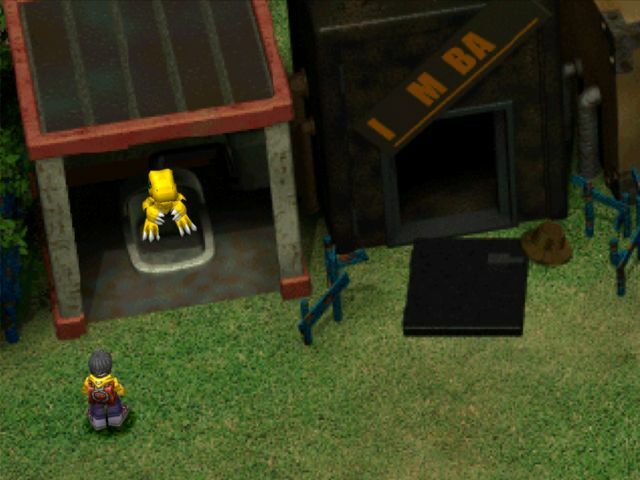 A long time ago, all kinds of Digimon lived here. 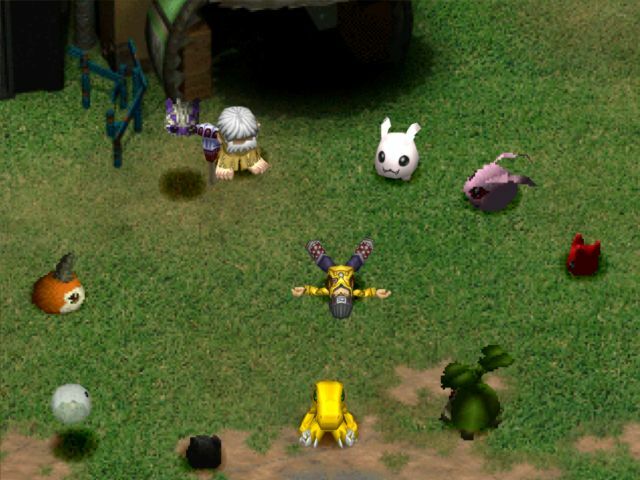 However...It's uncertain when, but the Digimon began to lose their minds...Everyone became scattered outside of the village. Normally machi 町 is translated as "town," and Digimon is actually the only place I've seen it called "village." Machi identifies a slightly higher degree of urban density than mura 村 which is what we normally would call a "village." You could just as easily call it "Starting Town." Protagonist: What do you mean by that? 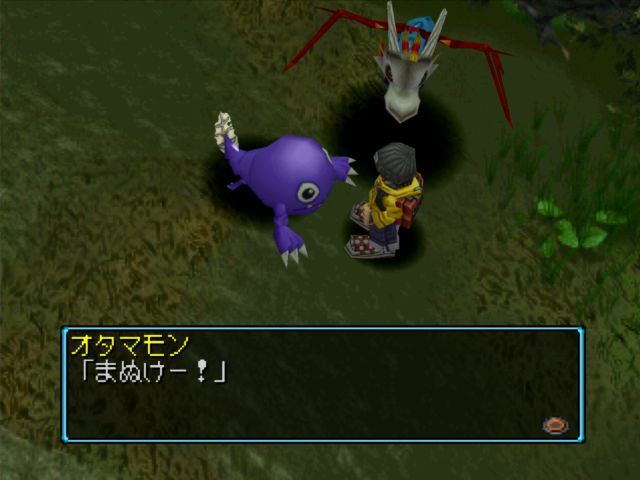 Jijimon: I don't know the cause...The Digimon...became unable to use words and speak. There are still a few that can talk...Those who used to live in the village lost their memories. Protagonist: I see, I see, that's what you mean by losing their minds. Jijimon: Yea. It's dangerous as things are. 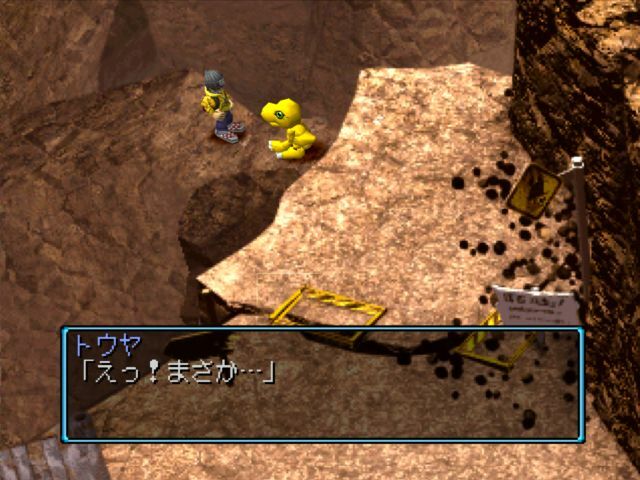 According to tradition, the crisis of the Village of Beginnings is a crisis for all Digimon. Protagonist: But still, there's nothing I could do. I'm no one special, right? 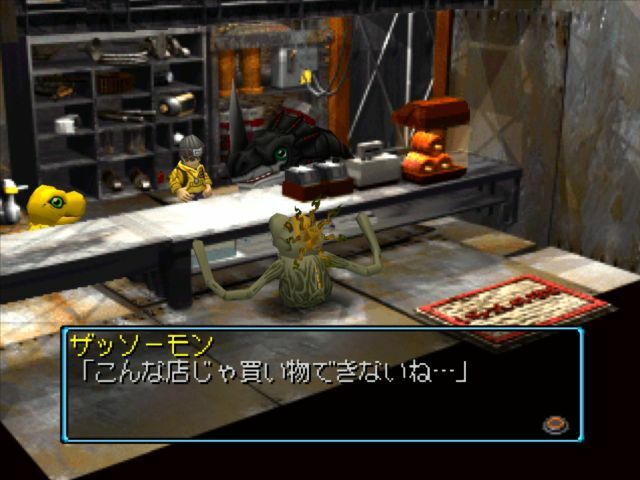 Jijimon: You're a specialist at raising Digimon, aren't you? Protagonist: Ehh? ...Ohhh. Yeah, a real specialist! Hehe. Jijimon: Didn't you notice? You're speaking with the words of Digimon. Protagonist: Eehh, I'm not speaking normal Japanese? This was changed to English for obvious reasons. 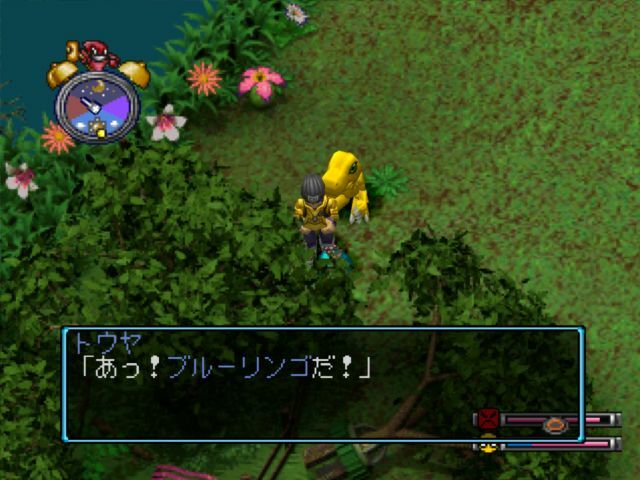 Jijimon: I am hearing the words of Digimon exactly as we say them. 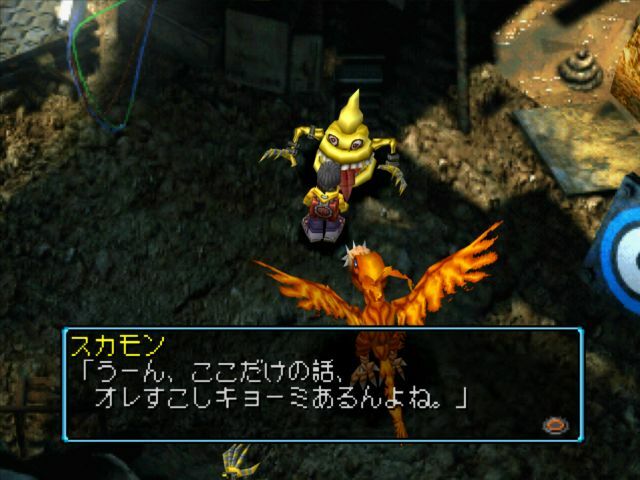 Jijimon: Which is to say, your love for Digimon in the real world appears to become power in this world. Protagonist: Eh, eeehhh. You're embarrassing me. Jijimon: This is the reason we chose you. You alone can bring the Digimon of File Island together here! Protagonist: Oh. Ohh. Ohhh! I-I see, I get it! I understand it all now! Ahaha! Just leave it to me! Tokomon: Yay, he'll do it, he'll do it! Jijimon: Yes, yes, thank you. It may be selfish of us all, but we're also depending on you. Protagonist: Hehehe. What should I do first? 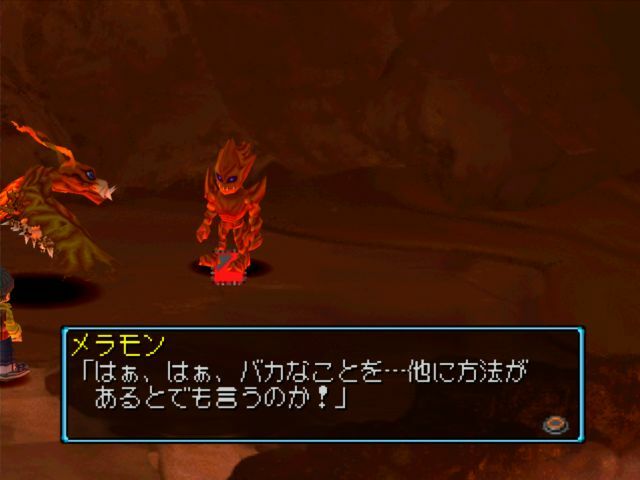 Jijimon: From hereon out you and Samus are partners, so you two should tour File Island. Then, I'd like you to find the cause for the unusual phenomenon, persuade the Digimon, and send them to this town. Protagonist: Okay, got it. Let's go, Samus! The term used for "mind" here is 心 kokoro, which can also refer to the heart, soul, or spirit of something. The official English script uses "heart." 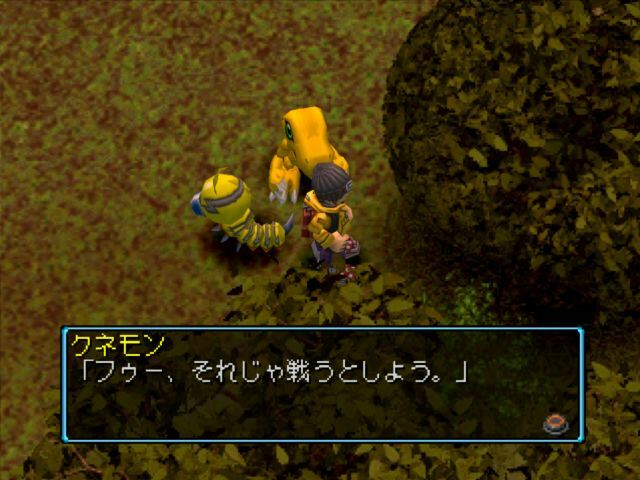 Jijimon says that the protagonist's love for Digimon becomes 実力 jitsuryoku "competency/ability" but can also be read to mean "true strength" and "force." So let's check out our partner a bit. 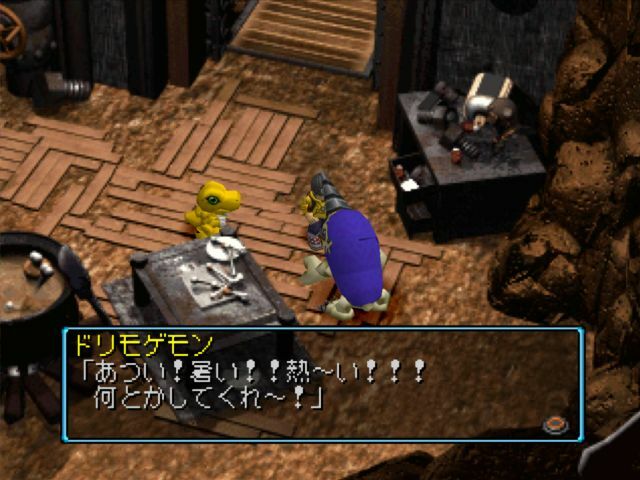 A Reptile Digimon which has grown up and become able to walk on two legs, it has an appearance like a tiny dinosaur. Because it is still on the way to adulthood, its power is low, but as its personality is quite ferocious, it doesn't understand fear. It has grown hard, sharp claws on both its hands and feet, and demonstrates its power in battle. It is also a being that foretells evolution to a great and powerful Digimon. Its Special Move is spitting flame breath from its mouth to attack the opponent, Baby Flame. 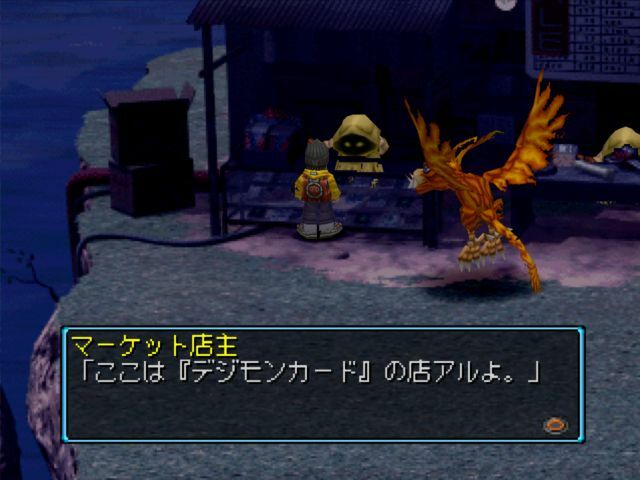 Each Digimon in World has one to three specialties, which dictate what techs they can learn and how much damage they receive. 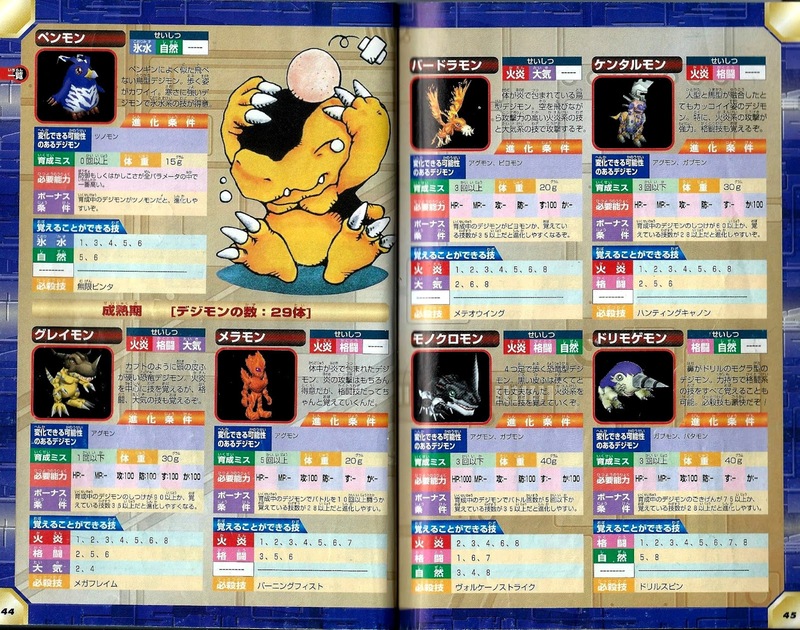 There are 9 techs for each specialty; Agumon learns Fire techs 1-6 and Battle techs 2 & 4. This gives her a leg up over Gabumon in the early game because she has more tech diversity, but starter choice will really become irrelevant after our first death. Jijimon: Ah, ahem. 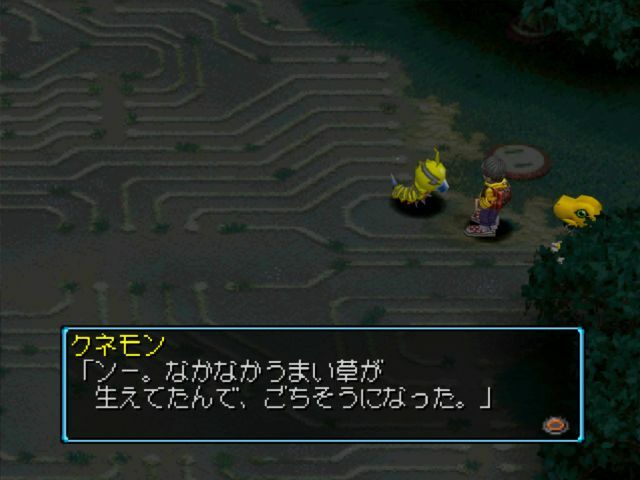 I intend to restore the "Village of Beginnings" with the cooperation of the Digimon that have returned to the town. I will build shops that you and Samus can use at your convenience. First of all, that's right, I wonder what will happen if you try exploring the "Unwavering Forest" immediately outside the village. 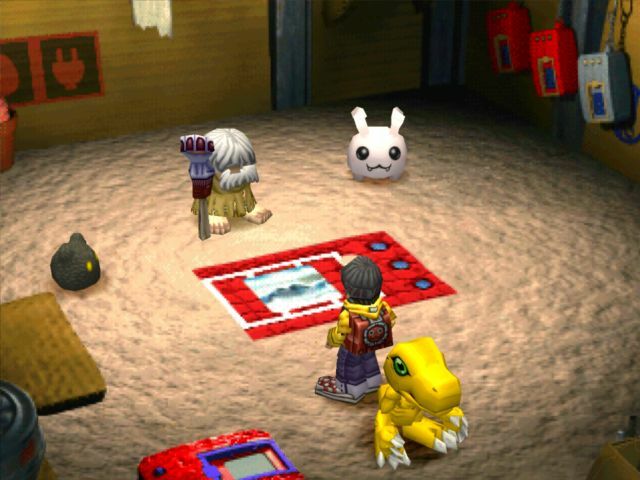 Jijimon's house has a number of tutorial Digimon in it. 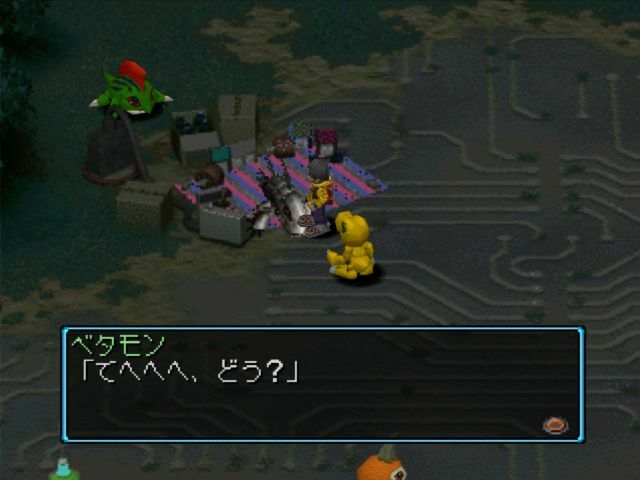 Botamon explains feeding and caring for our Digimon, Poyomon explains evolution, Tokomon gives us free items, and Punimon lets us use his chair to rest. There aren't actually any particular differences between the Japanese and English text though. 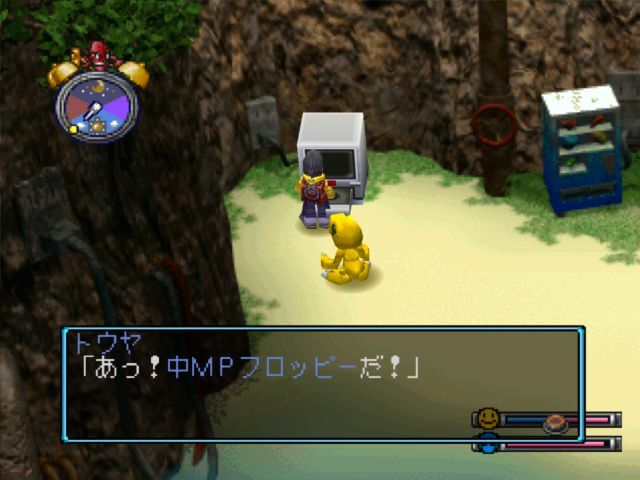 Tokkomon gives us 3 Recovery Floppies, (回復フロッピー Kaifuku Furoppii) 3 Meat, 3 MP Floppies, 1 Restore Floppy (再生フロッピー Saisei Furoppii), 2 Bandages (ばんそうこう Bansoukou, contextually Band-aid could be more appropriate), and 1 Medicine. The Restore Floppy is extremely important. 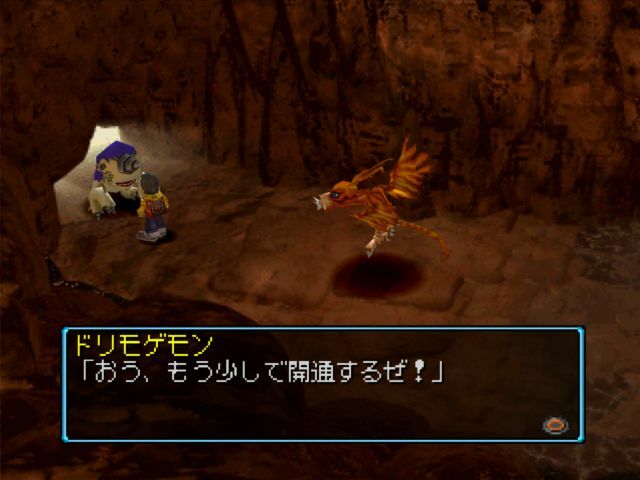 It revives a knocked-out Digimon and restores half their HP, but that's not why we care. Restore Floppies are critical to a glitch that lets you completely circumvent the convoluted process of moneymaking in this game. 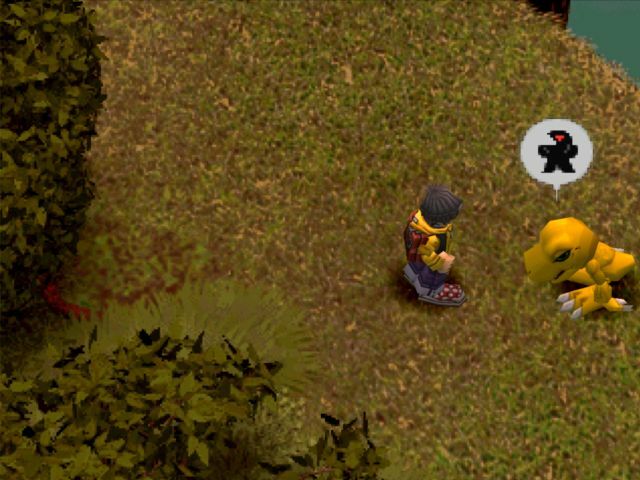 They are found nowhere in the overworld, are not dropped by any enemies nor found in treasure chests, and can only be bought after the shop is fully upgraded. If held onto, the Restore Floppy can grant an instant medal and +1 to Tamer Rank within just a few hours of gameplay. We are going to be shelving this Restore at our first opportunity, and it is not coming out until that time. Jijimon's house will eventually undergo renovations. One of the advantages of the prerendered backgrounds in this game over the 3D models of its sequels is that you get to see the town undergo serious changes as it grows. 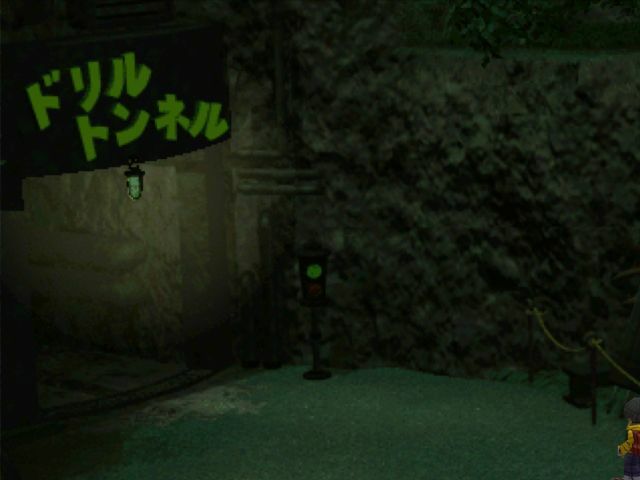 The town never really evolves in Re:Digitize as it does here, and in -next 0rder- the growth of the town is part of a fixed storyline event rather than being tied to gameplay. Tanemon: Ah, hello. Do you need meat? Ah, I should explain. Umm, this is a meat field, the meat farm. We grow meat for everyone to eat here. Touya: ! Hold up, you harvest meat from a field? Touya: No...Well, I guess not. So then? Tanemon: I consulted with Ji-chan, and I'm going to give you three pieces of meat once a day. So, here you go. Today's meat. 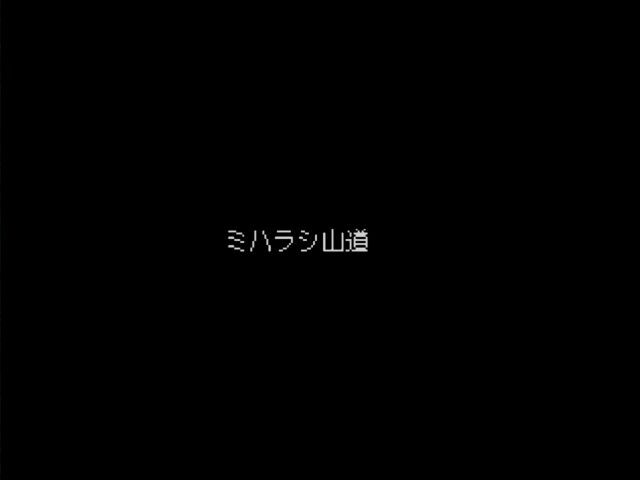 Thus, the basic gameplay of World begins. The first problem the player encounters is that their partner consumes more food than the meat farm allots them every day. Samus needs to be fed X Gigas of meat per day, and Tanemon only gives X-1. We can scavenge mushrooms from the forest that act as an exact meat substitute, but to gain independence from foraging and be able to explore further outside the bounds of the Unwavering Forest, we need to build a surplus of food somehow. The other main criteria are Weight and Care Mistakes, which count for one point each. Then there's bonus conditions, which make up tons of different assorted non-stacking criteria--you can't get more than one point from bonus conditions, so if you meet the criteria for both number of battles and number of techniques, that still only counts for one point, not two. 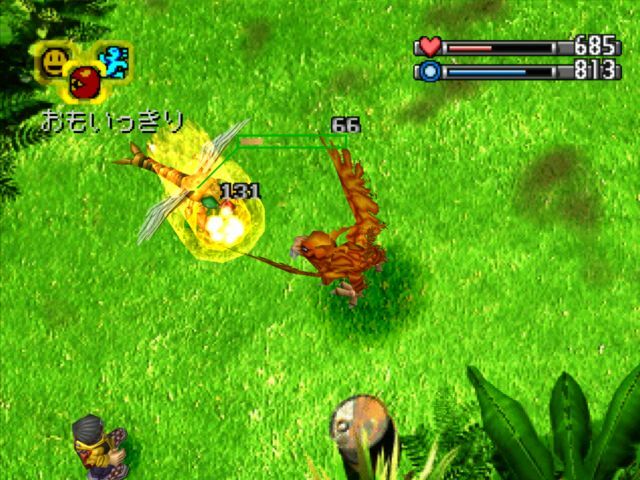 Greymon's bonus conditions are to have 90 Discipline or 35 techs. So if you have 90 Discipline, there's no need to try to get 35 techs. 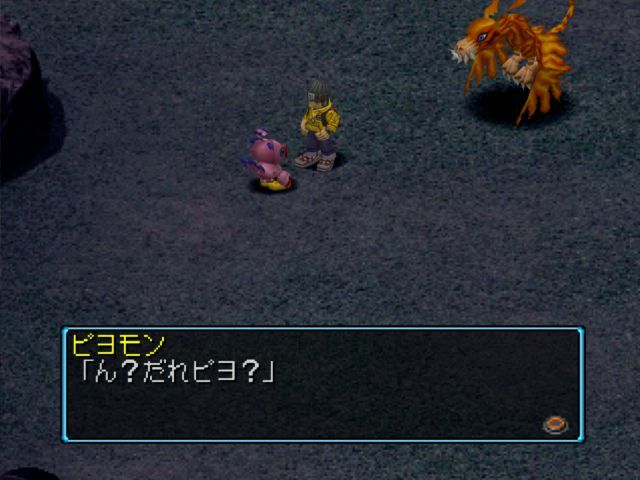 Back in 2011 OFS and MechaBread discovered that Digimon are actually always trying to evolve at every frame of the game. They can't succeed before the minimum day requirement, but it's ideal for us to meet the criteria for our target Digimon before the initial three days are up, as that means the moment those first three days end we'll evolve and have a full three more to meet Perfect requirements. The Digimon I'm aiming for is Birdramon. Her parameter requirement is 100 Speed, Weight req is 20 G, and her Care Mistakes req is 3 or greater. Birdramon's Type Bonus is Piyomon, so we're obviously not meeting that, and her other bonus conditions are 35 techs (impossible at this point) or a minimum of 2 battles. We'll meet that final requirement just by playing normally, and Speed can be met with a few gym sessions. That gives us the choice of meeting Weight or Care Mistakes; the Weight req is low enough that we could do it very easily, but there are advantages to going for 3 Care Mistakes. Agumon has six possible evolutions; Birdramon, Kentarumon, Greymon, Meramon, Monochromon, Tyrannomon. Going over into 4 Care Mistakes but keeping it below 5 is great because it doesn't overlap with 4 of others; Kentarumon (3 max), Greymon (1 max), Monochromon (3 max), and Meramon. 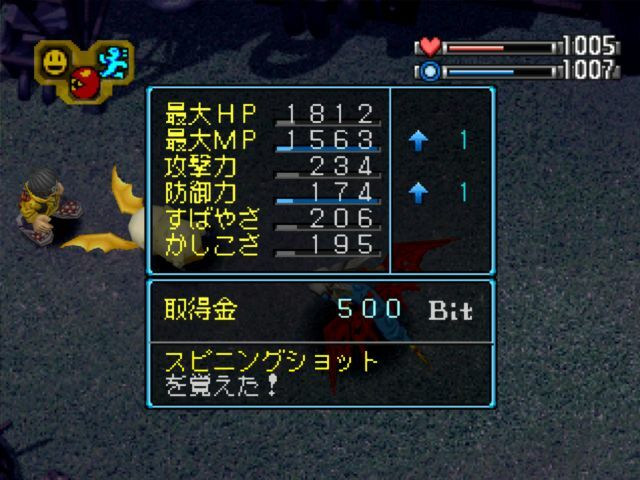 (5 min) If we don't increase any stats but Speed we won't meet the parameter requirements for the other Digimon, and Meramon is the only one who shares a Weight req with Birdramon. By hitting 4 C-Mistakes but staying below 5 we ensure that nothing we're doing overlaps with Meramon. So what counts as a Care Mistake? The last two are the most obviously beneficial, though they do carry a negative impact on Discipline and Happiness. 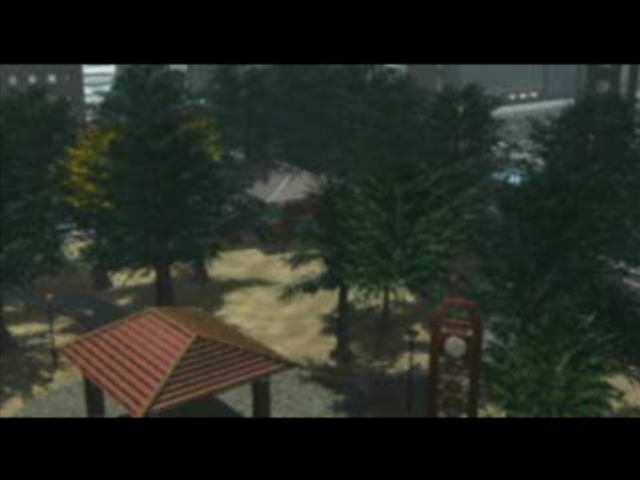 The Green Gym is where most training happens, and in a normal playthrough where a significant chunk of gameplay takes place. There are other (better) gyms accessible in the overworld, but they're a lot of trouble to get to and each one is specific to a few stats. Every training method at the Green Gym improves two stats, with running improving Speed and HP. Each session passes one in-game hour, and there are two types of training, normal and Bonus Try. 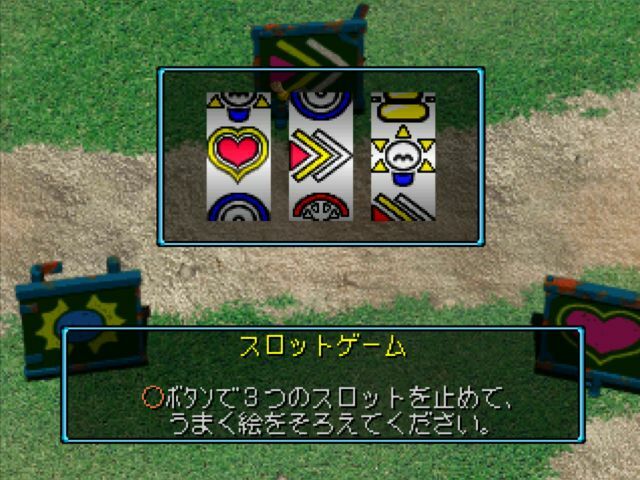 The latter is a type of slot machine game where you need to line up three symbols to improve your training. You get +10/+8 for normal training, variable results for a successful Bonus Try depending on what you lined up, and +5/+4 for a failed Bonus Try. 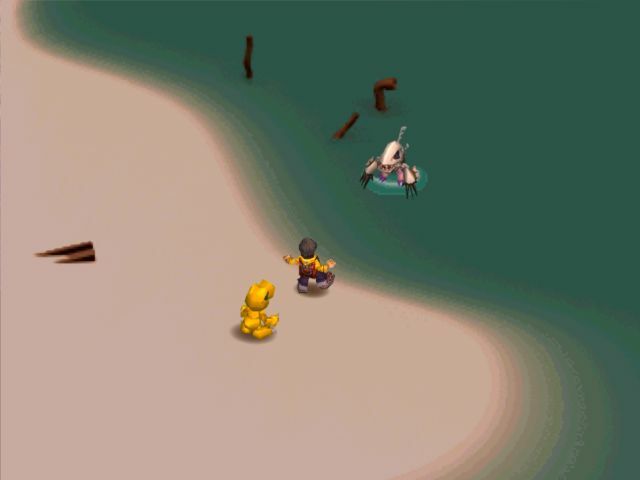 Bonus Try was proven rigged long ago, as even if you use save states and frame-by-frame tools the last reel will slide out of place to prevent you from succeeding on your first attempt, and subsequent attempts are only sometimes not rigged. You still have to carefully time your stops, but all that effort could be for nothing, so no one ever uses it. We get our first opportunity for a Care Mistake immediately after our first training session. It takes four sessions to bump her Speed from 70 to over 100, (+32) which elapses four hours, but it takes four and a half for the food bubble to completely disappear. 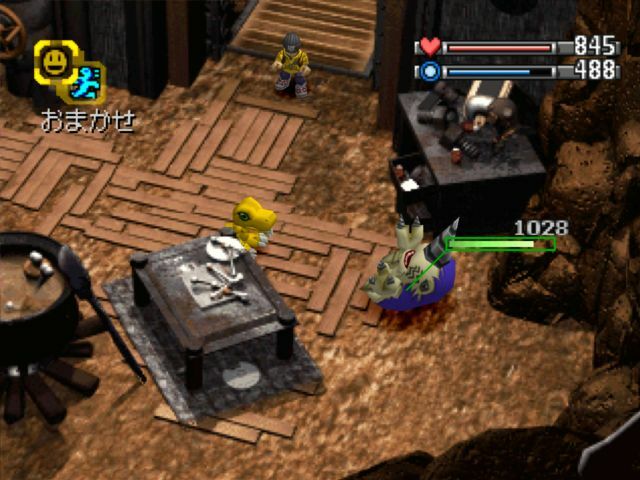 Part of what made Digimon World so ingenious is how the (relatively small) dev team came up with ways to translate the virtual pet gameplay to a console environment. 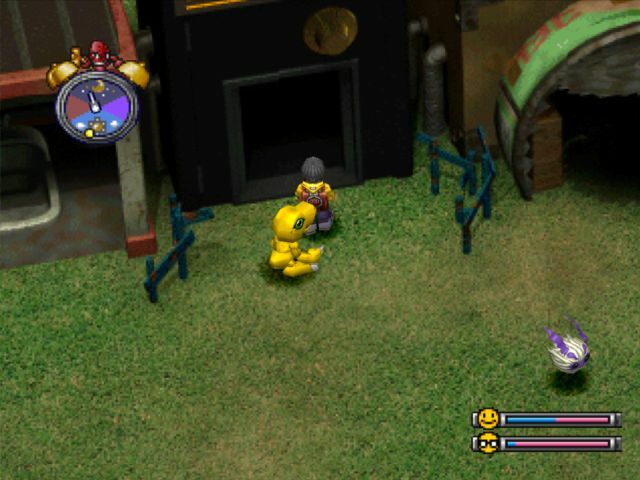 In the Digital Monster and Pendulum pets, your Digimon would periodically poop, and you had to flush the poop before it stacked up. 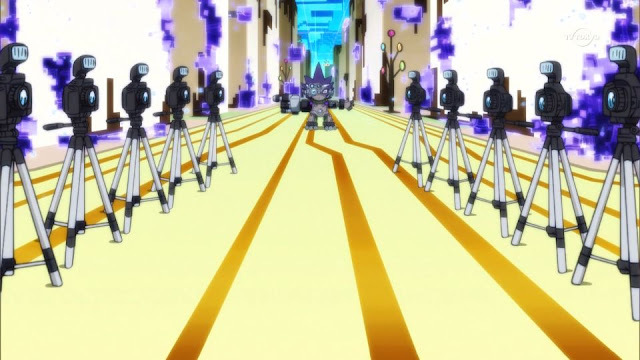 If you let it accumulate enough, with three to six on screen at once, the Digimon would get sick and eventually die if untreated. Not flushing fast enough counted as a Care Mistake, as did Digimon getting sick. 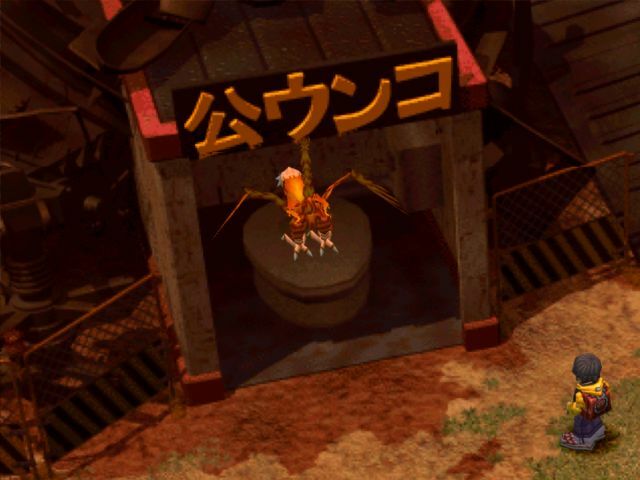 In World you're not confined to a single screen, so instead of having to flush poop within a certain time frame of your Digimon doing it, you instead need to get them to a toilet within a certain amount of time after they notify you. 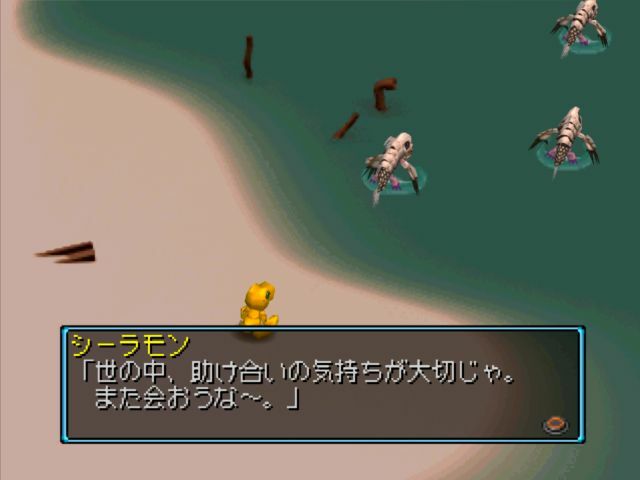 The "poop accumulating leads to sickness" was transformed into a Digimon's Virus gauge filling up over time, with sickness replaced by turning into a Scumon. Subsequent teams working on Re:Digitize and -next 0rder- didn't have to come up with these kinds of conceits.  This is normally translated as "Unwavering Forest" by fans, and was localized as Native Forest in the English game. 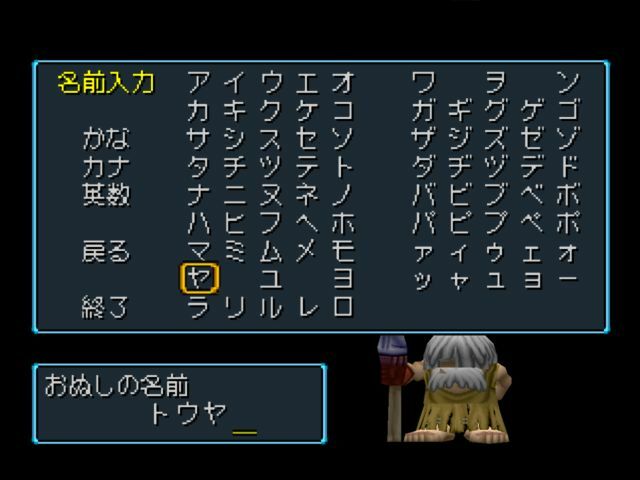 Read literally its Japanese name, 迷わずの森 Mayowazu no Mori, is "the forest of not hesitating," but this is actually a subtle jab at the Legend of Zelda series. 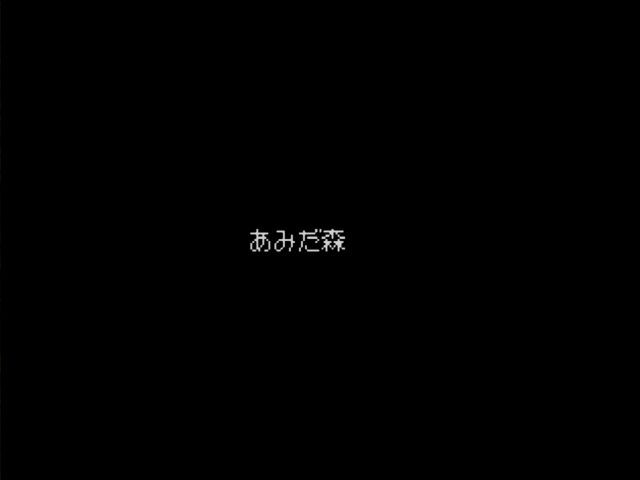 The infamous Lost Woods are called 迷いの森 Mayoi no Mori "the forest of hesitating" in Japanese. 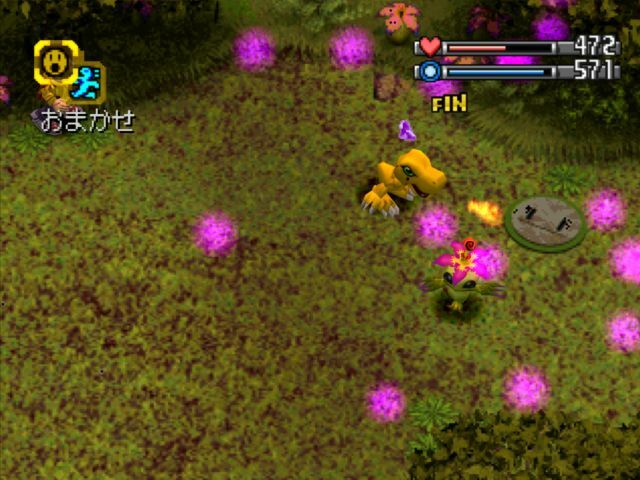 In a bit we'll actually see Digimon World's own take on the Lost Woods gameplay concept, where it follows a series of structured and intuitive rules that make sense to the intended players. That in mind, "Unlost Woods" (or even "Found Woods") is the more contextually sensitive translation. Touya: Geez, that's sudden! Okay, let's give it a try! World uses three core battle tracks. This one is reserved for recruitment boss fights. Battle rundown; we have almost no control over this fight. Our Digimon acts independently, and if her Brains stat was higher we could issue orders like all-out attack, going on defense, maintaining distance, or even issuing direction commands to use specific techs, but that's all a ways off. Normally we'd be able to run, but not during boss battles. 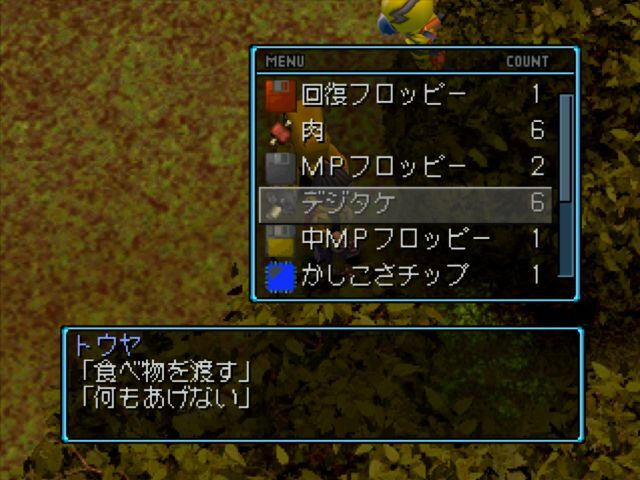 What we can do is open the menu to throw HP/MP and status restoration items, and once Agumon's Finish gauge is filled up we can initiate it and power it up by alternating shoulder button presses. Incidentally, after so many years I've become something of an emulation junkie. I usually use a DualShock 2 with a USB adapter to play--it's one of my favorite analog controllers--but after trying it I've become really taken with the Pokken gamepad as my digital controller of choice. World came out at a time when analog sticks were already standardized, but the game doesn't actually support analog movement, so the lack of sticks doesn't hurt it any. Moreover, the shoulder buttons on the Pokken pad are really great for executing finishers. 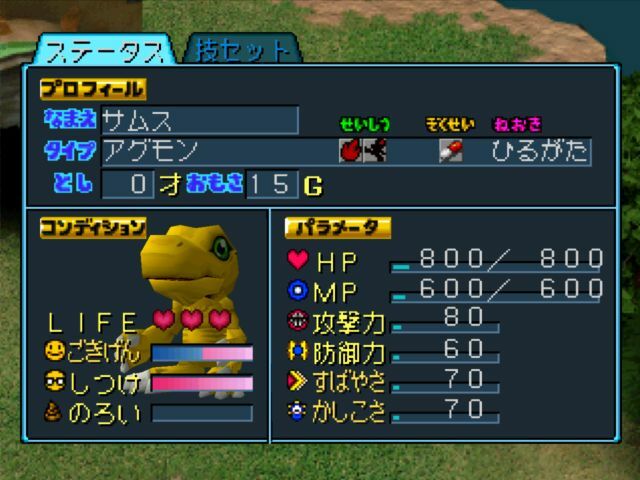 This Agumon has a slight advantage over ours; we only know Spitfire, but he also knows Mach Jab, which is Gabumon's starting tech. 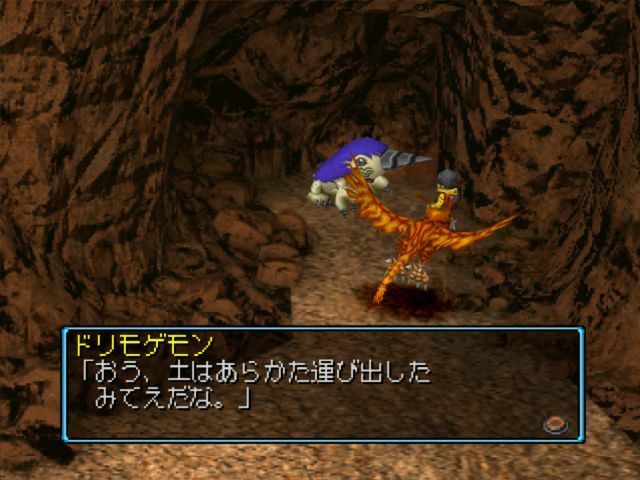 Since they're the same species, we can pretty well guess that our Agumon can learn Mach Jab as well. (And after this fight, he does!) 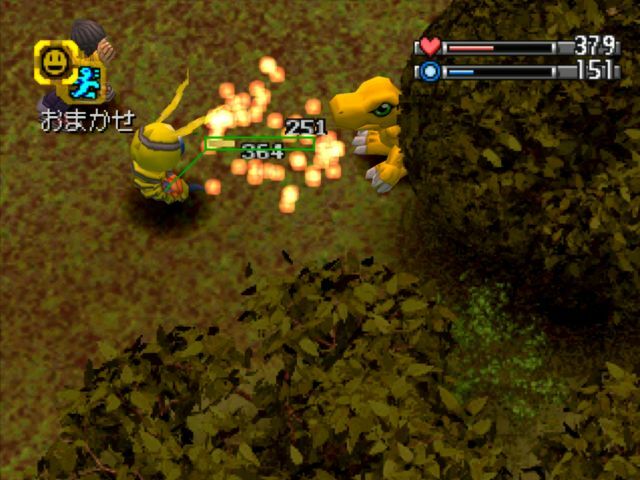 One of the disadvantages to starting with Gabumon is that while both him and Agumon learn Fire and Battle techs, Gabumon only learns Fire Tower and Heat Laser out of all the Fire techniques available, so he can't learn Spitfire in this fight while Agumon can get Mach Jab. Mach Jab is weaker that Spitfire so I'm not equipping it, but it does bring us one step closer to the Technique Master medal. Touya: (That's right, I should try returning him to the town...) ...Umm, hey. Would you like to...Come back...to the village? 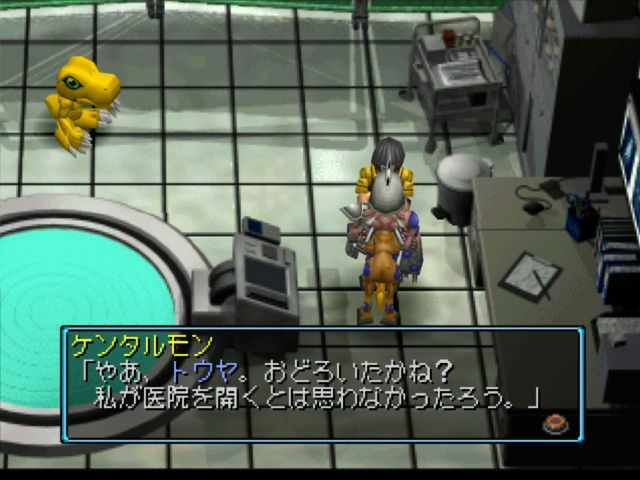 Agumon: Well, sure. 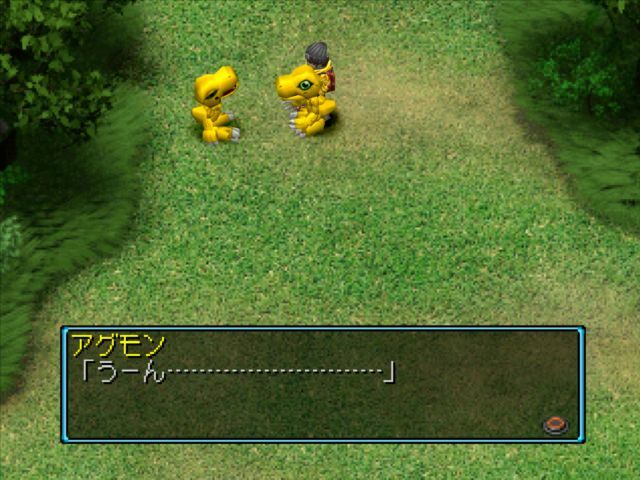 I'm Agumon. Nice to meetcha'. Touya: Hey, I guess it pays to ask. All right, let's keep it up! The real purpose of this boss fight is to demonstrate enemy encounters. 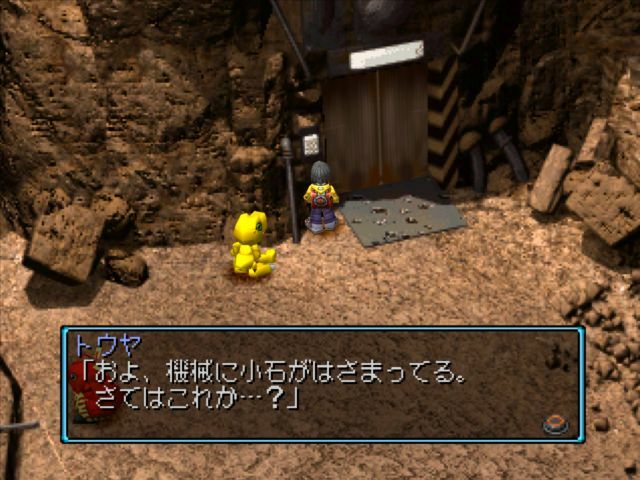 There are no random encounters in Digimon World. 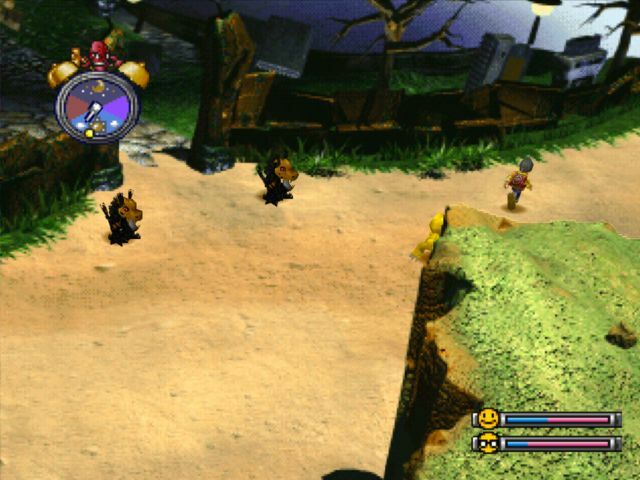 Every enemy appears on the overworld patrolling a specific set route, and has to touch you to initiate a battle. 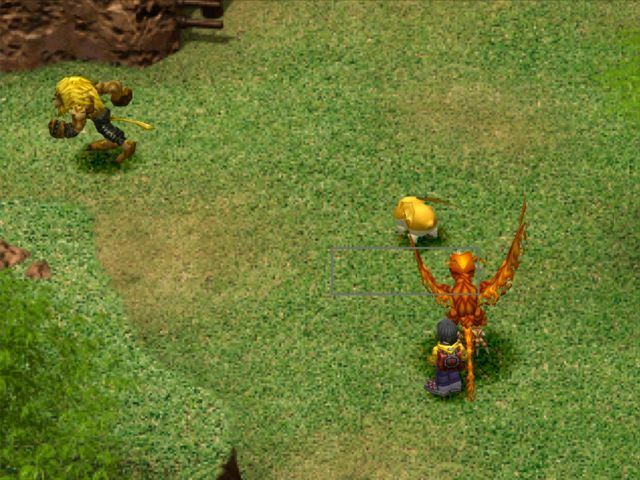 Nearby enemies will either join the battle once initiated or run away, and with certain items you can force them to join or leave. Unlike in Re:Digitize and -next 0rder-, on-field enemies do not chase you, though they may appear to when they are in fact following a preprogrammed route. 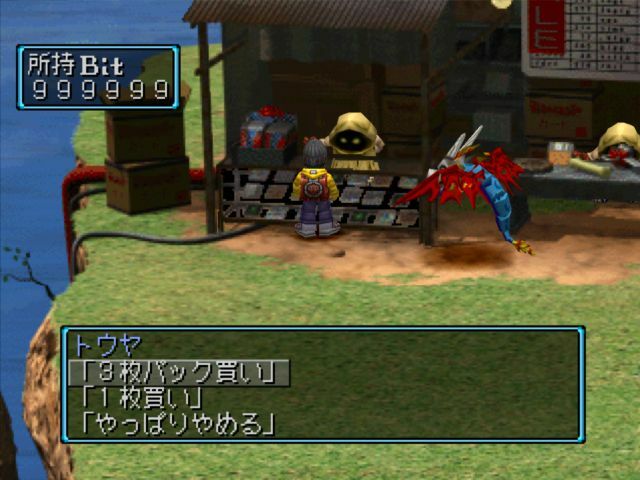 Every Digimon added to the village increases its Prosperity rating, which starts at 0 and caps out at 100. 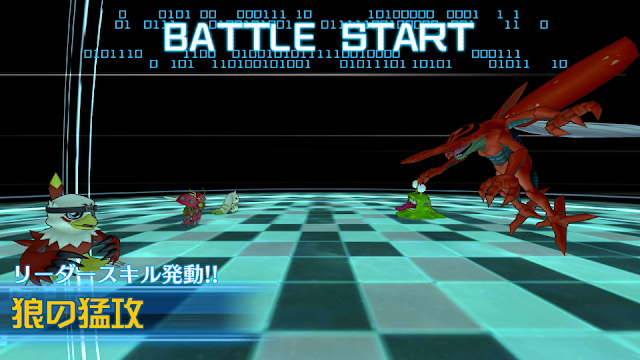 Child-level Digimon add 1 point, Adults 2 points, and Perfects 3 points. 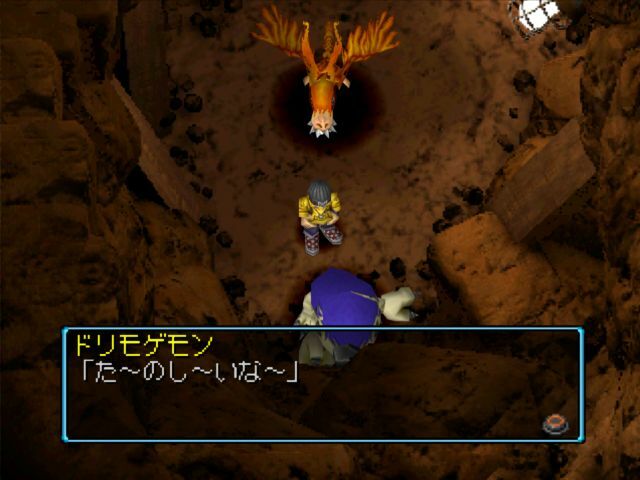 The final dungeon unlocks at 50 Prosperity, and many of the Digimon that join open up or enhance businesses. 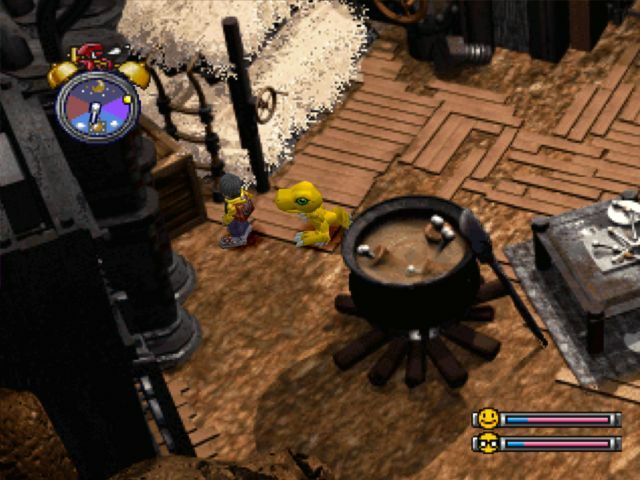 Agumon opens up this Item Bank, which is vital for storage throughout much of the game. 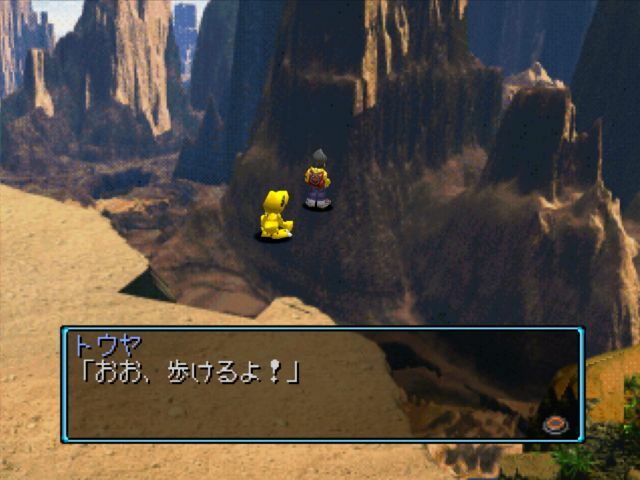 Agumon: Yeah, you came! I started up this "deposit shop" to store items in. You guys can just store your items here. It's a special service. I immediately bank the Restore Floppy, Bandages, and Medicine. We'll be close enough to home for a while that if we need them we can come back for them easily, and inventory space is gonna be at a premium until...probably the far eastern side of File Island. The southwestern side of Unlost Woods has our first treasure chest. 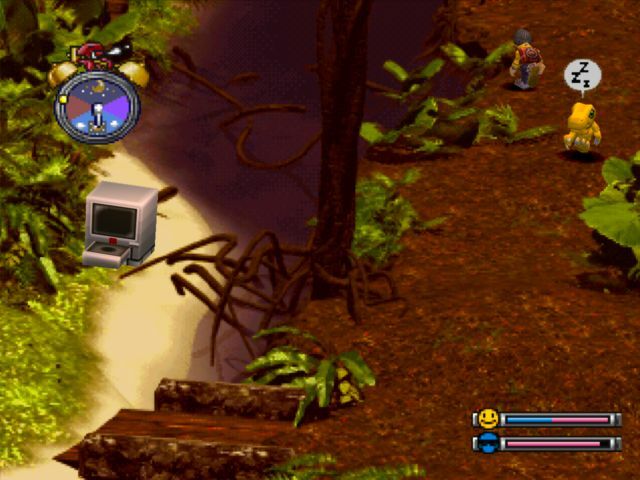 In this game they take the shape of personal computers, which is pretty fitting since most of them contain disks of some kind. This one has a Medium MP Floppy. This is surplus 101 as far as the early game is concerned, as this little corner of Unlost Woods has a chance to spawn three Digimushrooms in sequence, effectively doubling your daily meat at the expense of an additional inventory slot. The area immediately to the south has a 5% chance to spawn a Blue Apple every time you enter (completely fills Happiness or sell for a ton of cash) so you can alternate going up and down until you either get enough mushrooms to be satisfied or finally spawn an apple. ...I'm telling you, I'm a flower. Seriously, I'm a flower! You're too persistent! 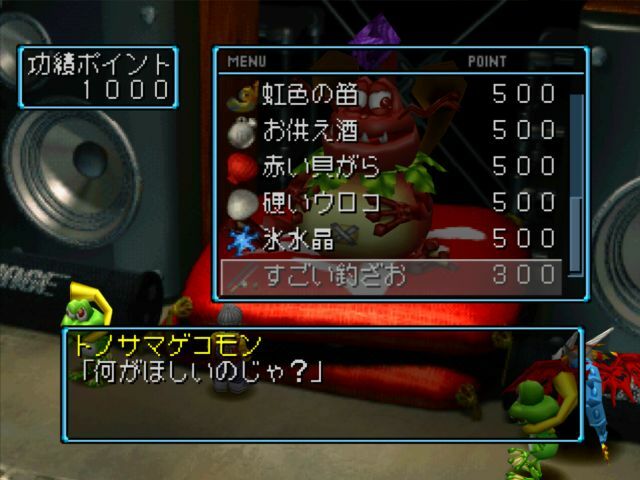 Palmon is extremely dangerous, having access to both Water Bullet (which Agumon has a double weakness to) and Poison Powder, which affects most of the field and inflicts the Poison status error on contact. Poison in this game is incredibly powerful, though not in the way you would think. The HP drain is insignificant--what matters is the fact that it halves your movement speed, causing you to get half as many per minute compared to the opponent. 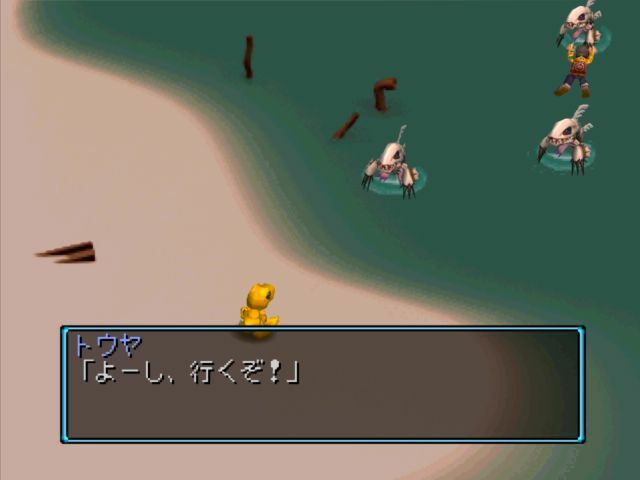 Water Bullet was mistranslated as Water Blit in the original game, which lead many to think that it was supposed to be Water "Blitz." Palmon: Stop it already! I hate fighting! Touya: So...Come to the village. It's peaceful in town! Palmon: Village? Sounds interesting. Sounds good, so yeah! 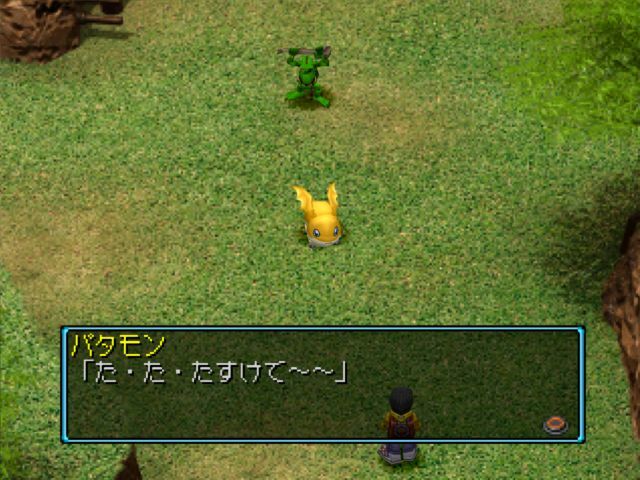 I'm Palmon. See you later! 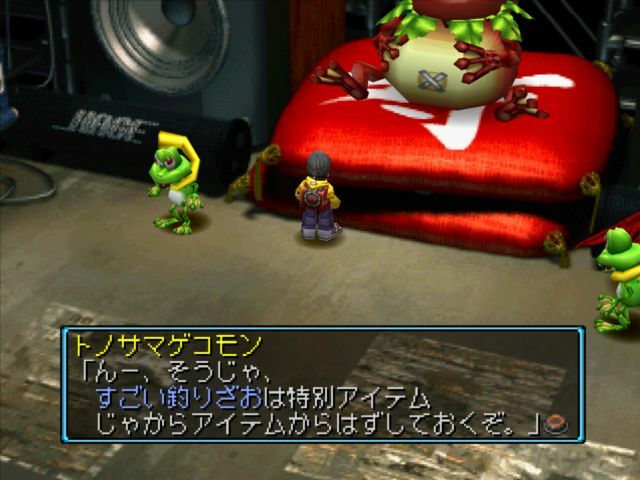 Palmon uses the masculine pronoun boku, so this one's actually male rather than the girl fans of Digimon Adventure might be accustomed to. Touya: Hm, there's something written here. Touya: Is someone living here? Despite how early you can discover this door, it doesn't actually open til you hit 50 Prosperity. This is a very unique area. 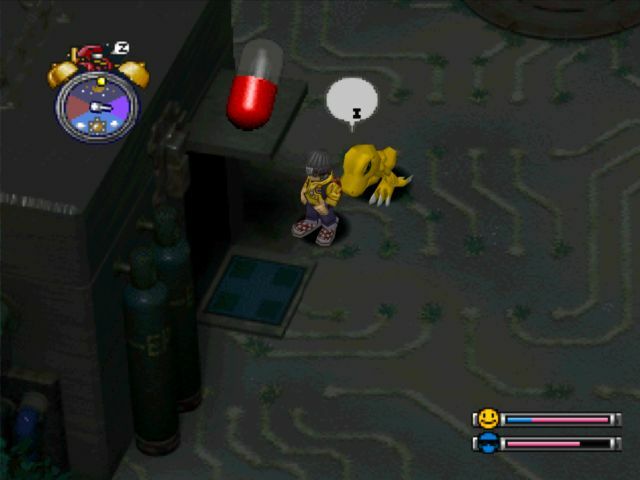 After we recruit Kunemon from it, putting any Baby II Digimon to sleep here will give it a 50% chance to evolve to Kunemon when it wakes up. 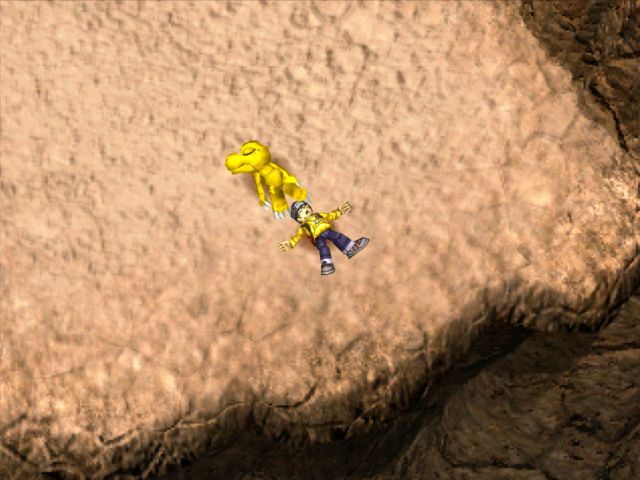 Whether or not you evolve is determined at the moment you go to sleep, so you can't savescum it normally, you have to use savestates or load from a normal save that was made before your Digimon went to sleep. Kunemon: I'm hungry. Don't you have any food? You can give Kunemon any edible item for this. I would give him Rotting Meat if I could find any. 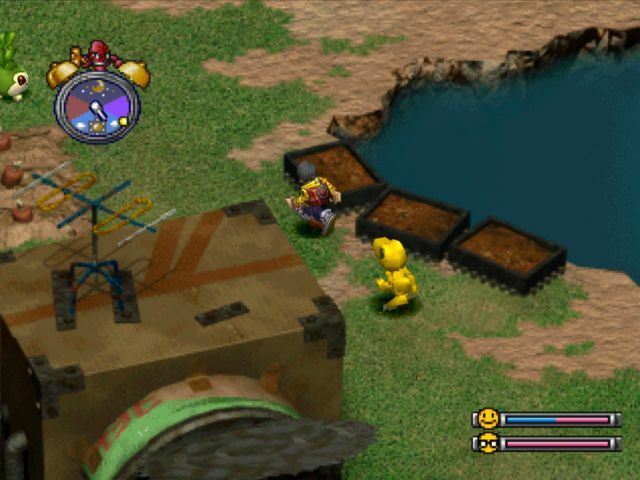 Kunemon: Munch, munch...Not bad...Hoh, so then, let's fight. A fair few of the recruitment dialogues sound like Shin Megami Tensei negotiations. The solution? A rare place we're I'm just going to abuse save states to brute force a win. 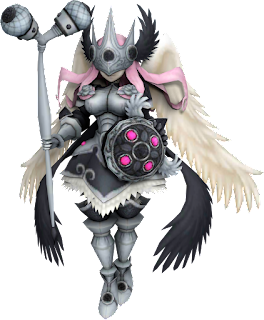 Since we're specifically going for Birdramon I would probably not attempt this until reaching the Adult level normally, but having infinite retries gives you a particular license to do as you please. 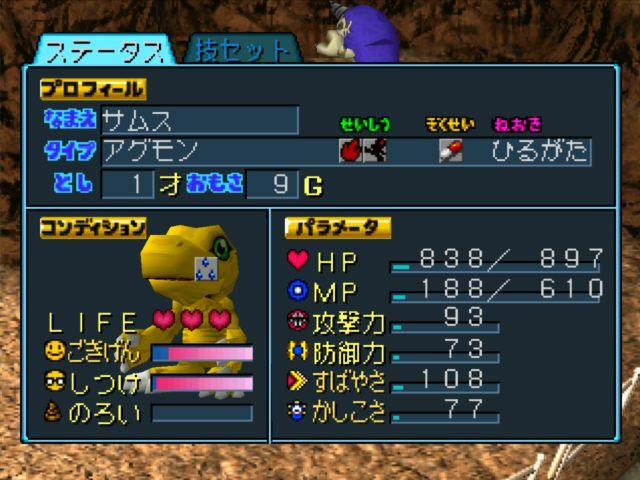 Agumon can win this fight by repeatedly stunlocking Kunemon with Spitfire and maxing out damage on Baby Flame, it just takes a couple tries to pull it off. Kunemon: I'm no match. What should I do? Touya: ...Come to the village, and work off what you ate! Kunemon: Hm, I'll do it. 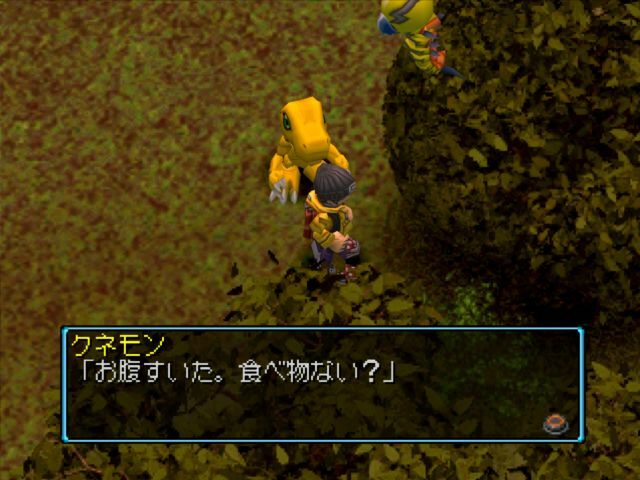 I'm an Insect Digimon, Kunemon. Nice to meet you. This is word for word what the official English translation uses, as it's already as accurate as you can get. Tabetta bun (食べった分) is an emphatic version of tabeta bun; ___beta bun is a piece of grammar that basically means "what one did," with whatever it was filling the blank, though bun can be used for either "you" or "I" depending on context because it's literally "oneself." I'm typing this out partially for my own benefit, because for the life of me I can't remember ever coming across this kind of statement before. I was so disappointed when I learned it was pronounced "Seela" and not "Ko-el-a." I only found out once I learned to read Japanese. Really, one of the issues with English as a language is the lack of an intuitive phonetic script. Coelamon: Mm? By any chance, are you human? It's rare for me to meet one. I am the fish Digimon, Coelamon. Perchance, did you go out of your way to meet me? Touya: We were searching for you! 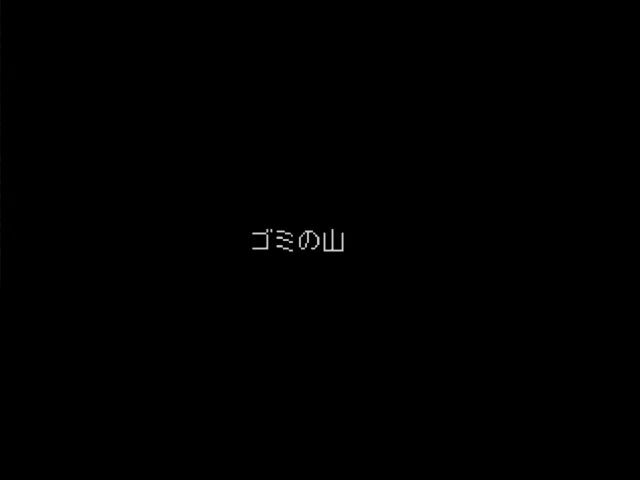 Coelamon does a weird thing, using the word "mezurashii" (めずらしい) in hiragana but replacing the shii (しい) with "Coela" shiira in katakana. 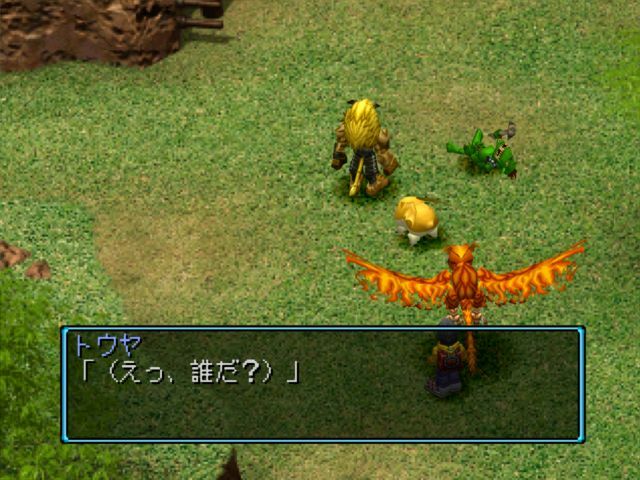 (シーラ) Digimon names are typically written in katakana (as are foreign words and anything exceptional in nature--aliens, car names, etc.) while normal words are written in hiragana. It's almost a verbal tic, but not really. Coelamon: Hohho, I see, I see! I understand your objective well. The bridge upstream is broken. But you wish to go on ahead...Is that it? Coelamon: Well then, that's fine. We'll make do somehow. Coelamon: Now, go over our heads. Don't be shy now. 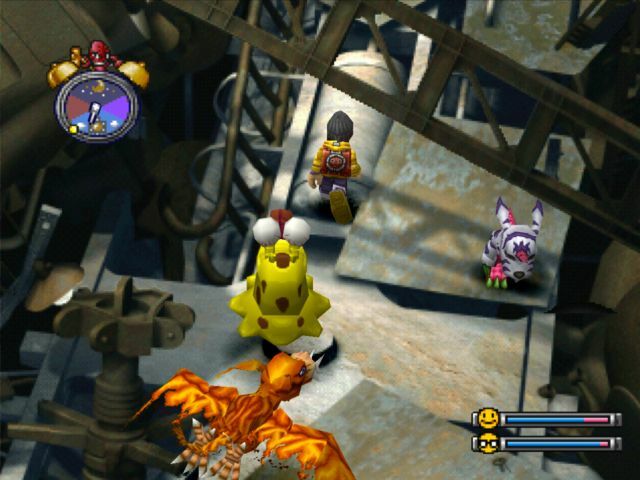 Coelamon is secretly one of the most powerful Digimon in the game. He's the only Digimon to learn both Ice Statue and Poison Claw, respectively the second best damage-dealing move and the best interrupt. 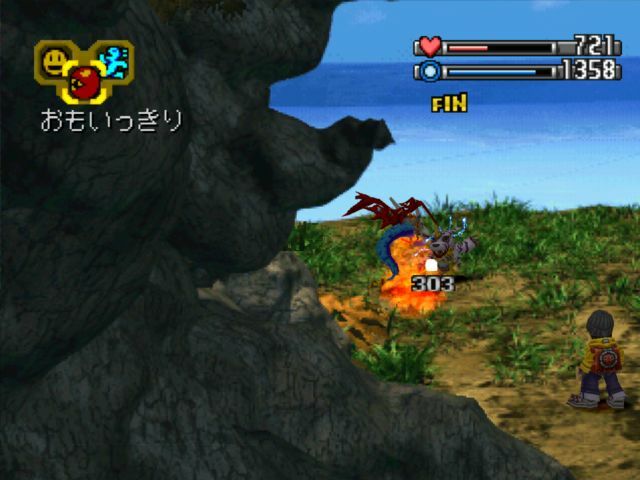 The damage formula is also set up so that Nature and Ice are the best defensive specialties on average--and this fish is the only monster in the game with both specialties. 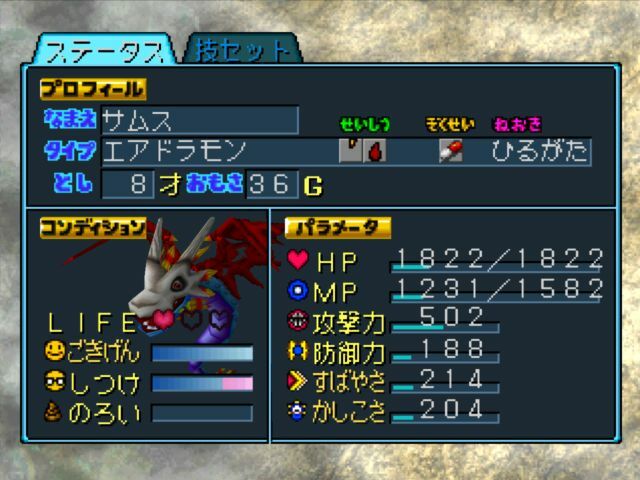 Because it's so easy to max stats in this game, even an Adult-level Digimon like Coelamon can take down Perfects like Heracle Kabuterimon. Touya: All right, let's go! At the northern exit of the eastern end of Tropical Jungle is the Mangrove Region. 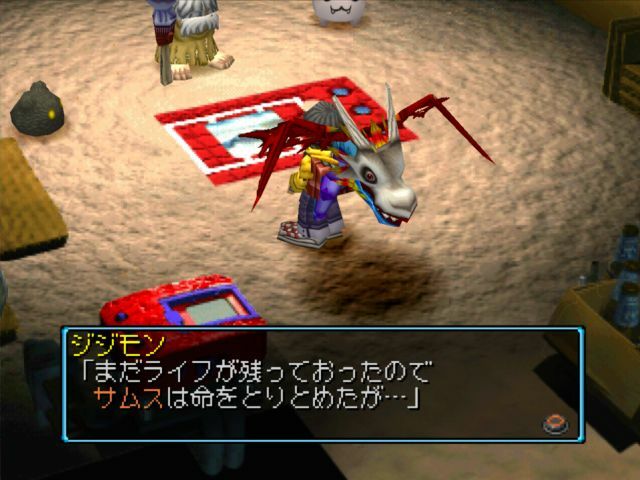 I completely missed this little guy my first time through the game because I was so accustomed to seeing Modoki Betamon that I didn't expect to see a regular Betamon. I ended up not finding him until I was in the late 90s Prosperity-wise. Betamon: Gurururu...Ru...Ru? S...Someth...Something is...I remembered something! Betamon: I used to live in the village. You smell like the village. Betamon: I was so scared, before I knew it I had left the village and become overcome with worry. But thanks to you, I remembered everything! I'm gonna return to the village. Is that OK? Touya: Of course. I think it's definitely more lively than before! Betamon: Really? Okay, I'll do my best too then! WARNING: The thoughtless should prepare themselves to be shot. Oh, boy. This is one of my favorite puzzles in the game. Almost no one in the English speaking world actually understands the mechanics of it. 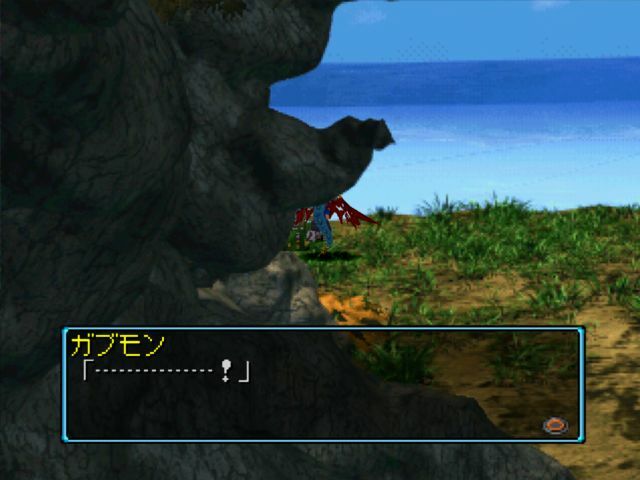 Amida Forest is one of the few areas whose BGM is not found on any of the official soundtracks. Hence the difference in instrumentation, and lower quality sound overall. Amida Forest actually obeys very simple rules. 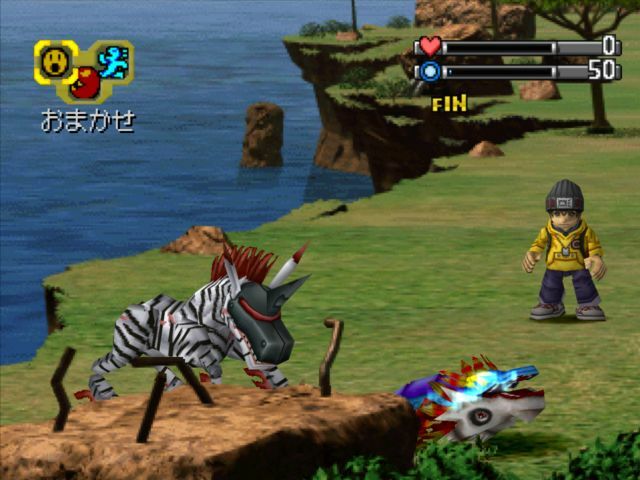 If you break them, Kentarumon shoots you back to the beginning of the forest. But to know those rules, you'd either have to either be a Japanese child or a massive weeb. Fortunately, I have a Bachelor's degree in Asian Studies. There's no actual navigation to speak of. The "correct" route changes every time you enter Amida Forest, and the game ends when you finally reach the exit it wants. 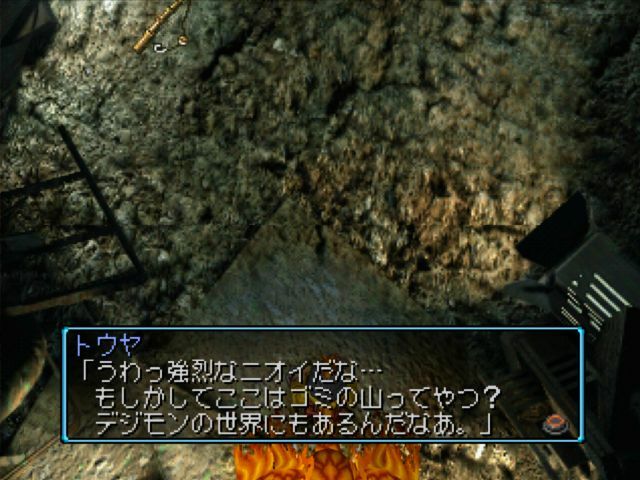 English-speaking players have spent more than a decade making up all these arcane ideas about Amida Forest, thinking it's a "pack tons of healing items and walk through Kentarumon's shots to the end" deal, or that there's some kind of time limit in place where he'll shoot you for dawdling too long, but it's literally a Japanese children's game played in elementary schools. VMoran: So what's the trick to getting past Centarumon? Well, one thing is, don't let him see you! Centarumon can't see you if you hide behind the northern part of the small rows, and thus you won't get shot as often. 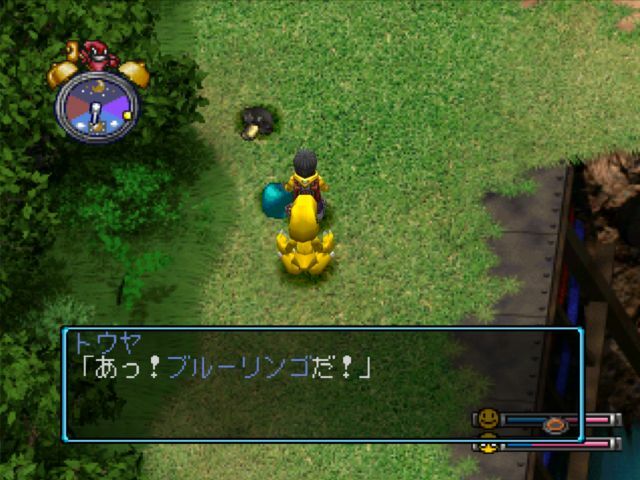 If you do get shot, feed your Digimon a recovery floppy, so that he doesn't get injured and thrown out of the forest. 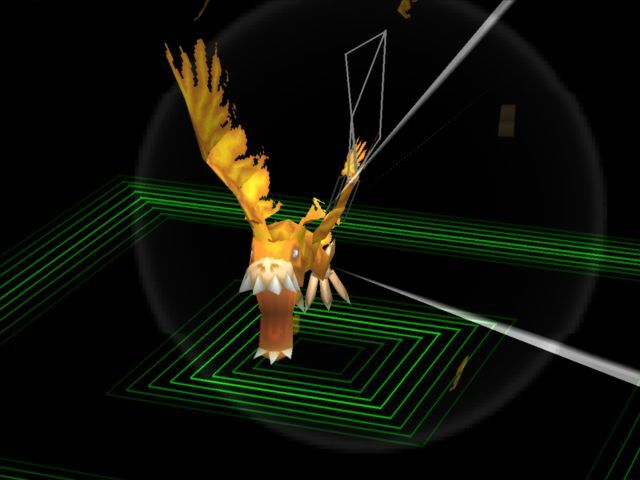 hWs Dark: Every time you walk for a while Centarumon will shoot you, knocking out some HP. If your HP reaches 0 you will have to start from the beginning, so every time you get shot recover to prevent starting over. 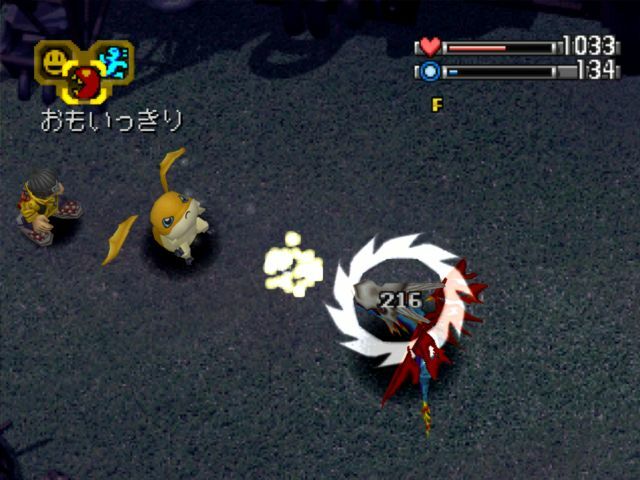 Neve: Every time you walk for a while, Centarumon will shoot you knocking out a lot of your Digimon's HP. 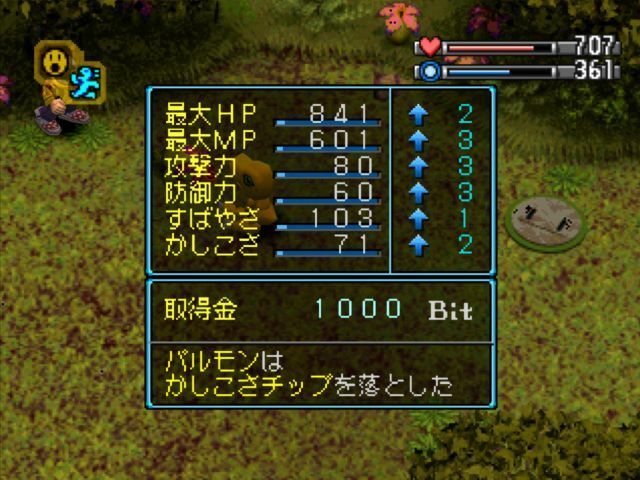 Unfortunately, if your Digimon hits zero HP, you will be taken back to the start of Amida Forest. Heal up after every shot to avoid restarting. I think it's amazing that it took so long for anybody outside Asia to figure out Amida Forest. Amidakuji/Ghost Leg isn't actually as culturally specific as it sounds--it's played in China and Korea as well, being fairly ubiquitous among the Sinosphere. You can take all the time you want with Digimon World's amidakuji, and as long as you don't deviate from its one rule you won't take any damage. And every path is littered with items, so it's actually advantageous to repeatedly fail and pick up the items over and over again. Possible prizes include Medium Recovery Floppies, Giant Meat, High Speed Plug-ins, Offense Plug-ins, Portable Potties, Autopilots, Meats, and Rotting Meats. 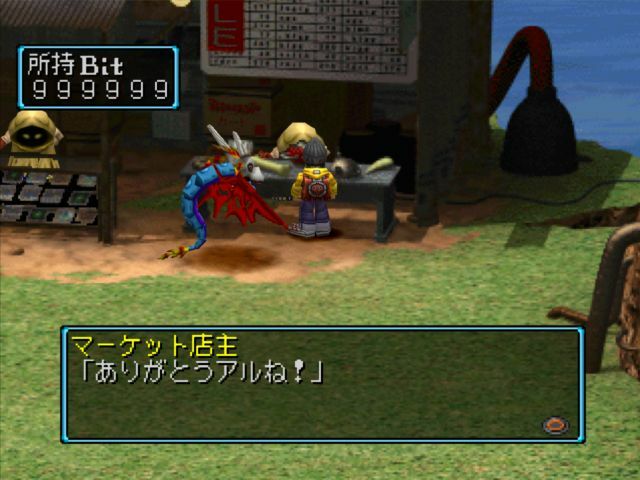 Digimon World is a weird game, but it has rewards for anybody that knows how to play and abides by the rules. 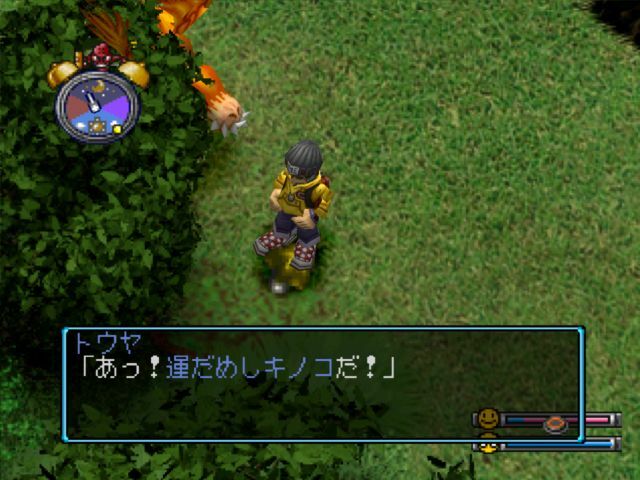 Kentarumon: You navigated this forest, as I expected. I am Kentarumon. I must apologize for my rudeness up to now. I'm sorry. I was not simply testing you on a whim. From now on, I'll cooperate with you guys. Now, go on. I will wait for you at the city. There's quite a bit of debate over whether this is supposed to be Kentarumon, Centalmon, Centarumon, or something else entirely. The Digimon Reference Book gives it as Centalmon, and for what it's worth he's stored on the disc as CENT.MMD. But the Japanese phonetics are given with a hard "c" sound and not a soft "c," which means its etymology is likely the Greek Kentauros rather than the anglicized Centaur. So even "Centalmon" would be pronounced "Kentalmon," not "Sentalmon." Touya: Samus, it looks like we've become pretty famous, hehe! Let's keep it up! With regard to the items we picked up, the Portable Potty and Autopilot are important staples we'll soon be able to buy at will. The Portable Potty lets you use it as a toilet from the menu--it's actually a child's training seat. Most Japanese training seats take a swan shape. (I had another encounter with them in Hamtaro: Ham-Ham Heartbreak, where they're a key plot item.) The translation is technically accurate but a little off because a portapotty is a specific item in the English language, whereas what the Japanese text says is closer to "mobile toilet." (Keitai Toire, using the same term keitai as in a mobile phone, keitai denwa.) My absolute favorite translation has to be "handheld toilet." Try telling somebody you brought a handheld toilet to a party, I'm sure it'll work out. Autopilot returns you to the town. The icon render seems to depict a statue, Re:Digitize retcons it to be a jet plane. North of the Mangrove Region lies Great Canyon. You can actually see the sides of it fencing in Amida Forest's map. This is one of several atmospheric BGMs in World. 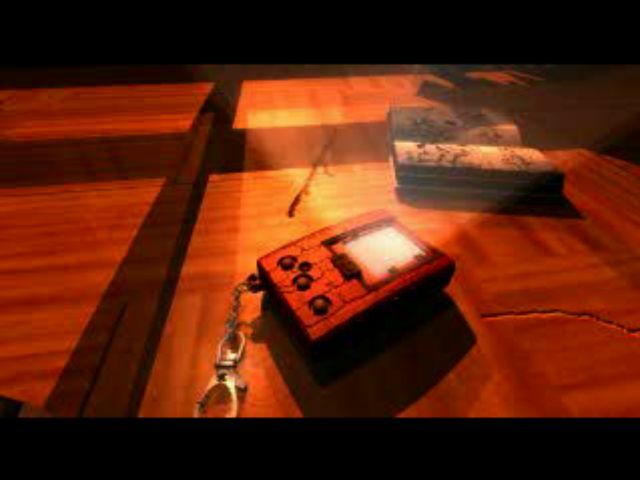 This is the only game in the series that uses them, and I think something is definitely lost in the transition to Re:Digitize/-next 0rder- where we're lacking these kinds of quiet breaks between normal tracks. 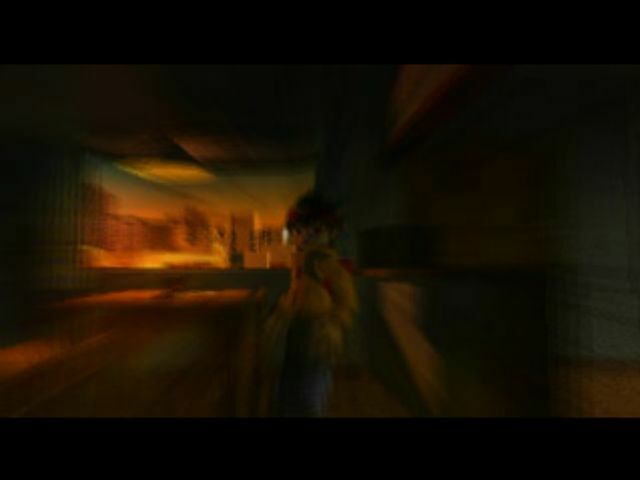 Later games don't have any transitions, you're simply haunted by constant music wherever you go, whereas in World the natural pauses contribute to the flow of the gameplay. 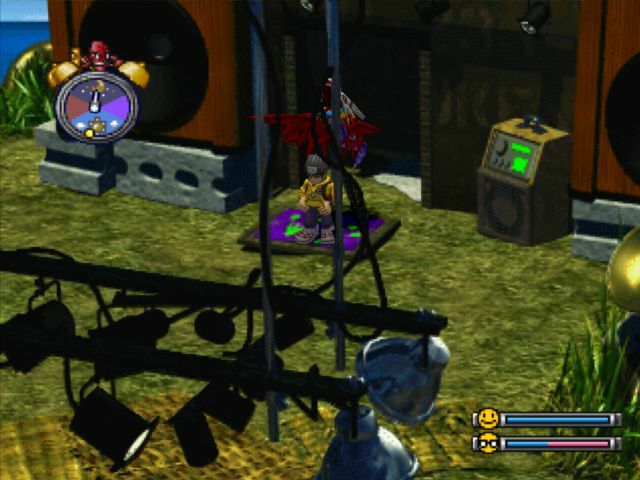 There's a similar element in Cyber Sleuth, where real-world sequences often don't have an accompanying soundtrack and instead only contain street noise. That mentally breaks up the flow of gameplay where the sounds you're hearing cue you for whether you can enter combat in a given area, and when you first start hearing Digital World music in the real world it reinforces the accompanying plot twists. Using birdcalls begs the question of where the birds are, though in this setting they could just as easily be sound data with no actual birds connected to them. The alternate version of this track swaps in a crow. We can't progress further than the entrance though. Attempting to cross the gap sets off the first flag for getting across. To go past here, we have to return to town via the Tropical Jungle entrance. 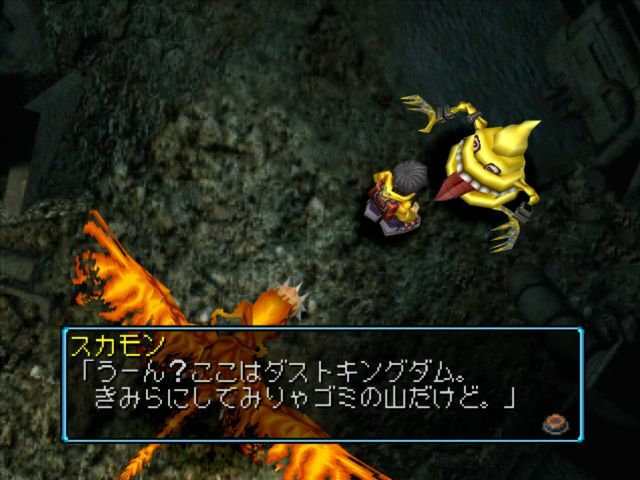 The dark Patamon there is Tsukaimon, a palette swap made to distinguish enemy Patamon from your own. The Digibridge is called the Digimon Bridge in the official localization. Coelamon: Mm? So it's Touya. The bridge has been rebuilt already. It seems that thanks to you, the village has gotten stronger. That's why I have one request of you. In exchange for me helping you, I want you to help us in turn. Coelamon: The creation of the town is for the sake of saving this island. Everyone is pitching in. So I will pitch in. You get me? Touya: You mean you'll come to the village? Coelamon: That's right. So then, I'm off to your village. Kunemon: Mm. Some tasty looking grass was growing, so I helped myself. But it seems the village got a bit too breezy. 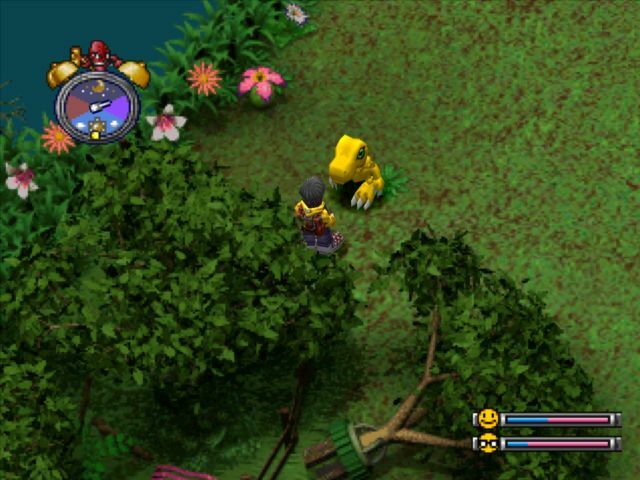 After you recruit Kunemon, he eats up the foliage between the Digibridge and the Village of Beginnings, allowing for easy access to Tropical Jungle and its associated areas. This kind of game design something that's missing from later games--the further you get, the more shortcuts you unlock, like in a Metroidvania. 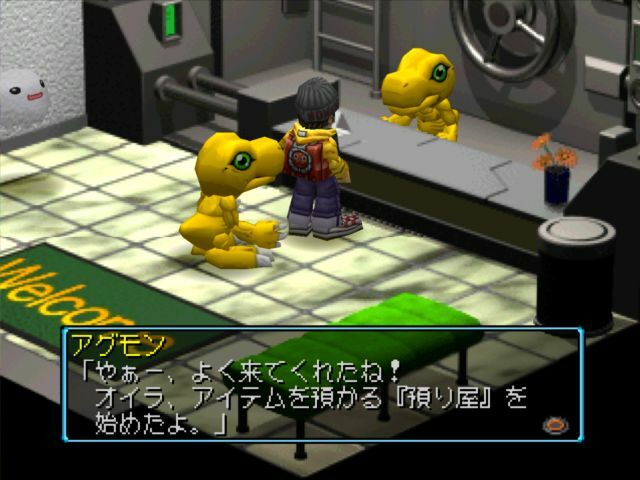 Kentarumon opens up a clinic, which itself is another recruitment flag for some of the shop Digimon. 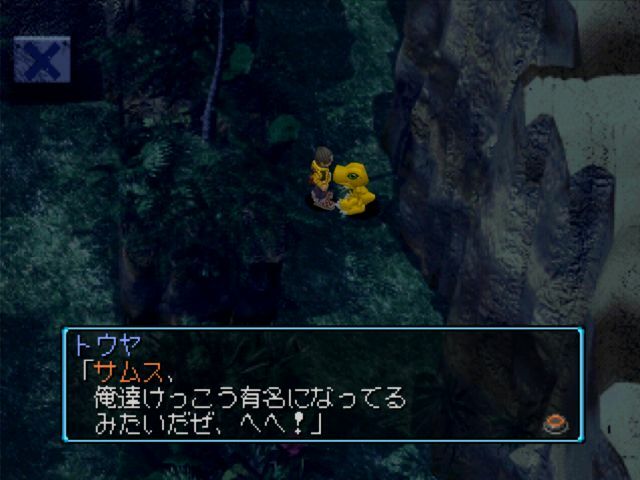 Tsunomon: Did you see the bridge to the east? It's been rebuilt! We're also doing our best. Betamon: Tehehehe, how 'bout it? Coelamon: We're cooperating to sell items. If you recruit Betamon first, he opens the item shop. If you recruit Coelamon first, he does it instead. You can only see both of their dialogues for it by not speaking to whichever one you recruited first until after recruiting the other. Right now the shop stocks Recovery Floppies, Medium Recovery Floppies, MP Floppies, Various Floppies, Autopilots, and Meat. As we recruit more villagers relevant to the shop, its stock will expand. 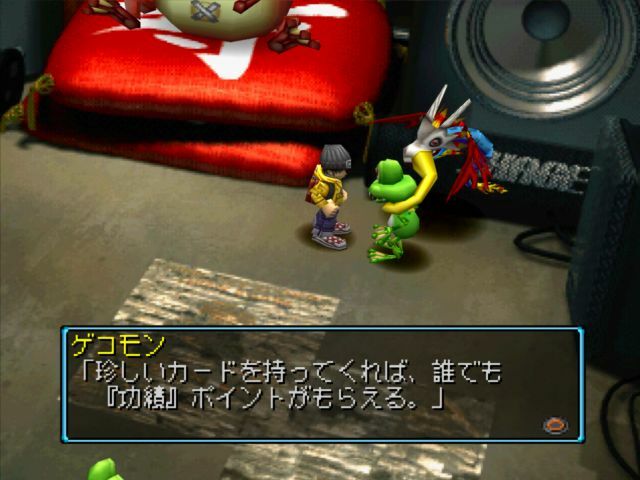 Palmon: Ah, Touya! I expanded the meat fields to double them. From now on I can give you three pieces of Giant Meat every day. And if you want extra, I can sell them at 500 bits apiece. From now on I'll tend the fields in Tanemon's place. It looks like Tanemon is resting somewhere. 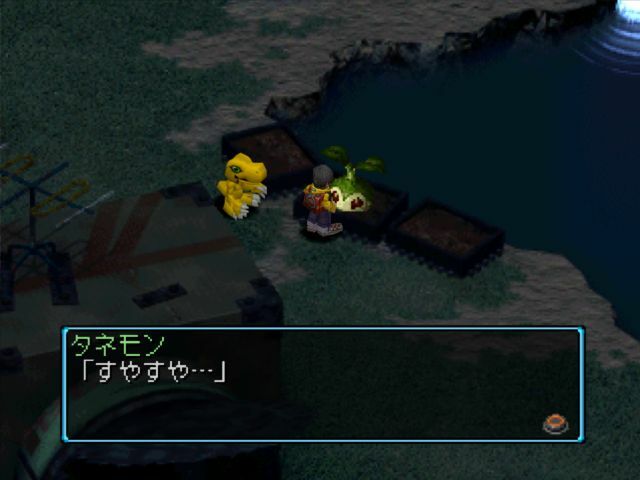 Palmon: Okay, here's your three pieces of Giant Meat for today. We've starved Samus enough to rack up all our needed Care Mistakes. From now on she's on a permanent diet of Giant Meat until she hits the magic 20 Weight necessary for Birdramon. Jijimon: Oh, Touya. You did it. 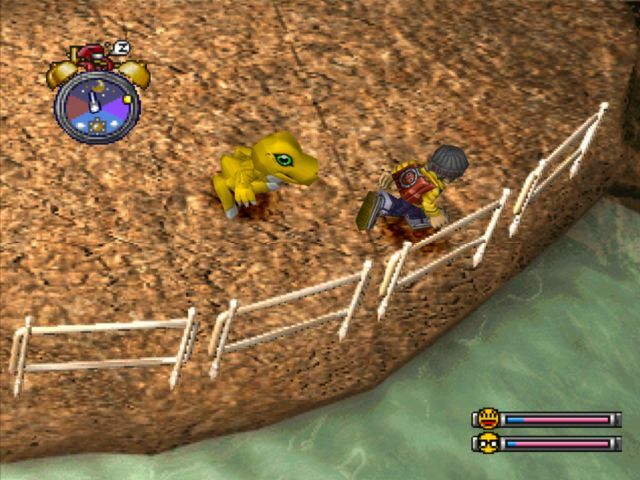 That Agumon from before came to the village. Look, they started a business right away. I want you to keep this pace and bring in Digimon! 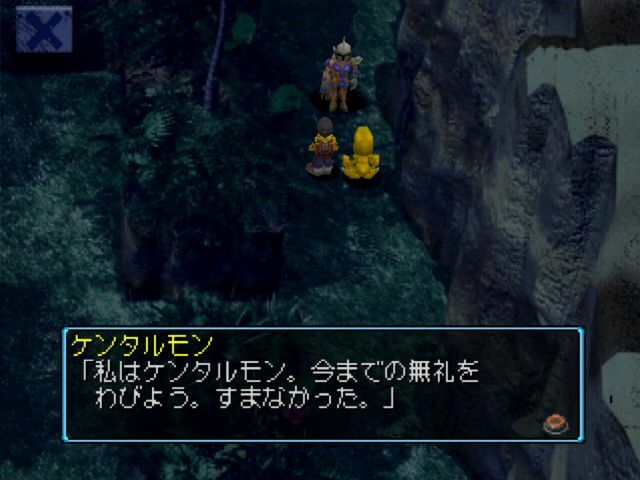 Jijimon: Palmon came here, saying something about expanding the meat farm. That's right, we'll get plenty of meat! 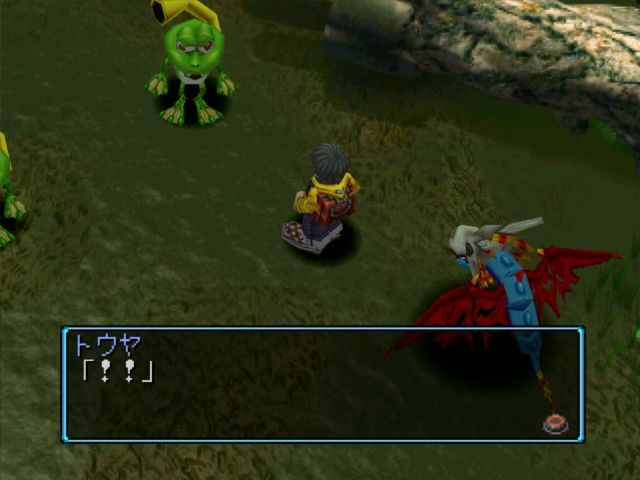 Jijimon: Kunemon came here, saying something about wanting to eat grass. I hope he eats all the weeds in our way! 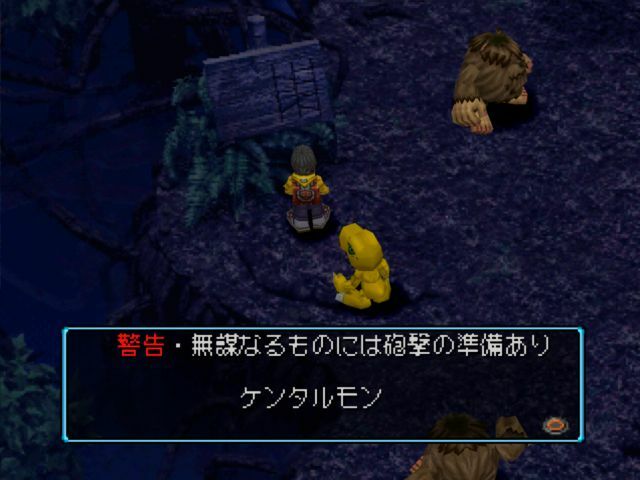 Jijimon: Kentarumon came here talking about opening a clinic. Hmhm, we can have peace of mind when it comes to sickness and injury! Jijimon: Coelamon came here saying something about trying to run a shop. Hmhm, the village will develop! 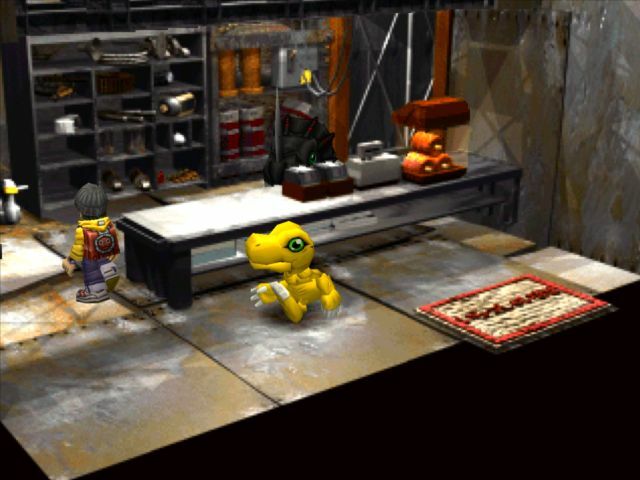 Jijimon: Betamon came here saying something about trying to run a shop. Hmhm, the village will develop! Jijimon: The village's current Prosperity is 8. It still has a ways to go before it's different from its old shape. This is the only big dump of these I'm going to do. It gets kinda silly when you haven't checked in with Jijimon in a while. The Drill Tunnel is full of stationary Goblimon. They won't pursue you, but you need to avoid touching them, as a three-on-one at this stage of the game is a death sentence. 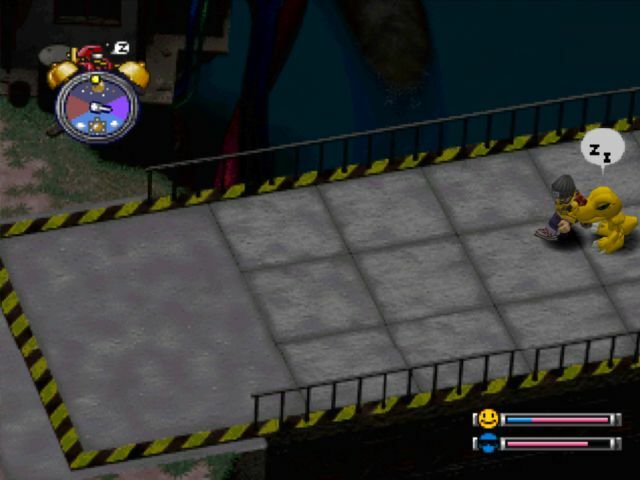 The second floor is where the area's plot kicks off, with this Drimogemon thrashing around. Drimogemon: Hot! Hooot!! The temperatuuure!!! DO SOMETHING! Drimogemon: I'm too hot! I can't take it anymore! 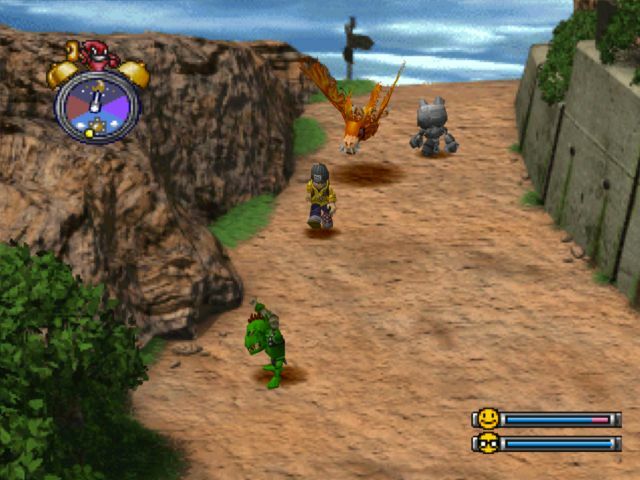 Drimogemon is much more difficult with Gabumon than Agumon. Spitfire trivializes some of the early game fights that should be hell just because it works so well as an interrupt when Agumon is actually fast enough to spam it. Otherwise, it's just another in a string of micro-boss fights the early game throws at you. 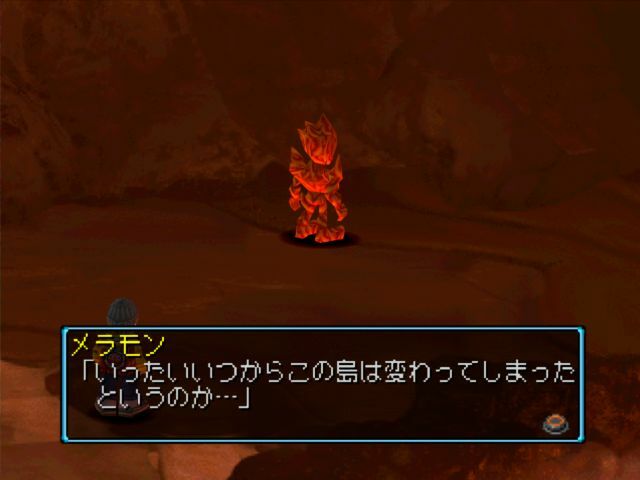 Drimogemon: S-sorry, I was acting strange because of the heat. Drimogemon: I'll try to put up with it and keep drilling. Well, I'll do my best. Touya: I see. We'l look into the cause, too. If this tunnel were to open up, it'd be really useful. Drimogemon: You, you're a real good guy. All right, we'll hurry and dig the tunnel! Incidentally, his name is supposed to be pronounced with a hard g, while the dubbed anime uses a soft g. His name comes from Mogera, a genus of moles, and/or moguri, Japanese for "mole." 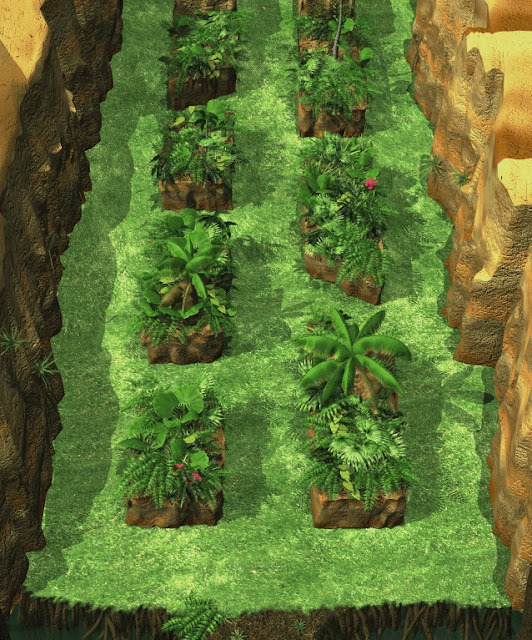 There's a really great attention to detail in the Drill Tunnel's renders. 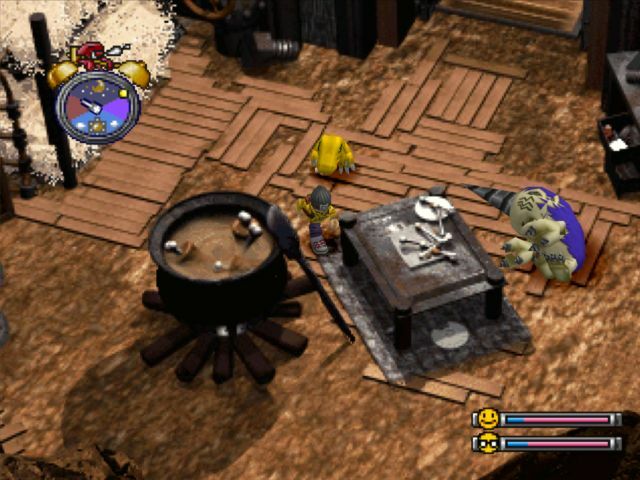 The residential area has a cooking pot of bone meat and a bunch of gnawed bones on the table, and barracks for the Drimogemon to sleep on. They also have a constant water supply running through the drilling area to cool it. This is the kind of effort that you don't actually need to put into the location (it's all data!) but the extra effort stands out. Drimogemon: You, who're you? This tunnel isn't open yet. Don't get in our way. 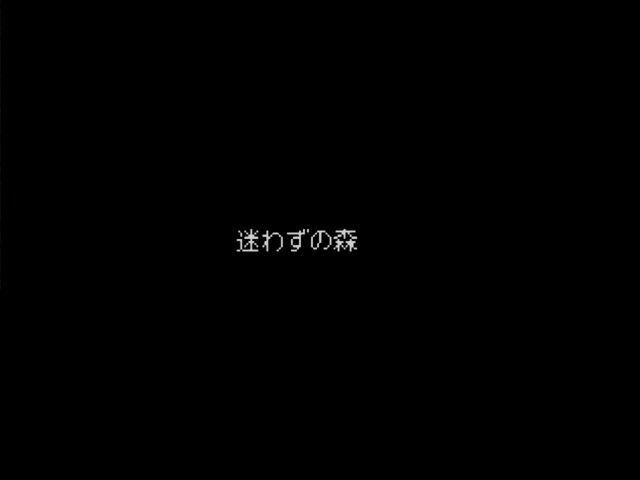 Touya: I'm sorry. When will it be open? Drimogemon: I don't know yet. It'll still be a while. Touya: Nn, that's troubling...isn't there anything we can do to help out? Drimogemon: Hey hey, are you spoiling our fun? No, wait...Carry that dirt out, if you're able. 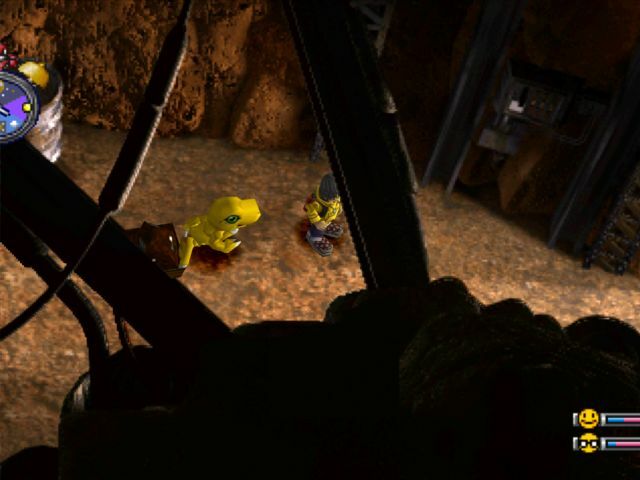 Drimogemon: That's the dirt we dug out. Carry it outside this tunnel and dump it. It's pretty heavy work, so do it part-time. I'll pay you 500 Bits for every round trip. This line is completely absent in the English dialogue. The Japanese word for part-time job is arubaito, from the German arbeit. Ever since hearing it, I've wished that English had a simple word for that. About a quarter of what you learn in Japanese is just filtering various German, English, French, and Spanish words into Japanese pronunciation. All of these words are really relics of the Meiji era, when Japan had a massive inferiority complex and tended to lift foreign words to replace Japanese ones. The opposite happened in the Taisho and Showa eras--y'know, World War II--where the government attempted to replace foreign words with Japanese ones, but for the most part the damage had been done. Just about the only significant language reform made was that everyone agreed to stop saying "Baseball" and started saying yakyuu instead. They never quite stamped out the foreign devils' jazz music though. Drimogemon: Oh, good work. Here's your pay. Got 500 bits in part-time pay! There's actually an alternative way to proceed through Drill Tunnel. If after talking to this Drimogemon, you leave the tunnel alone for 5 days, he'll finish it on his own. If you do choose to help out, it can be done in 24 hours. 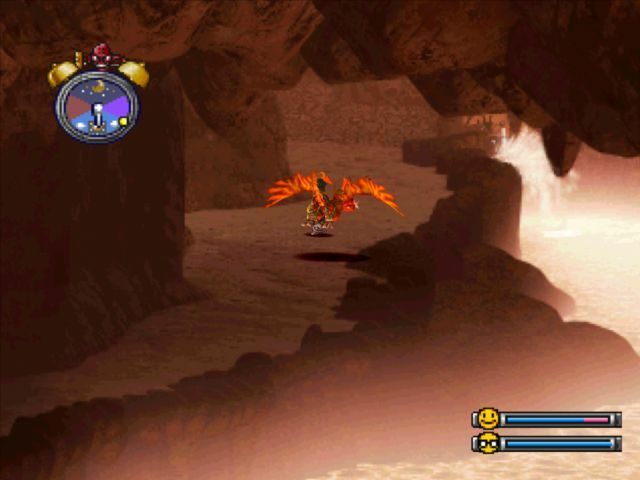 However, you need to make sure that you at least fight the boss Drimogemon to the west to trigger this. 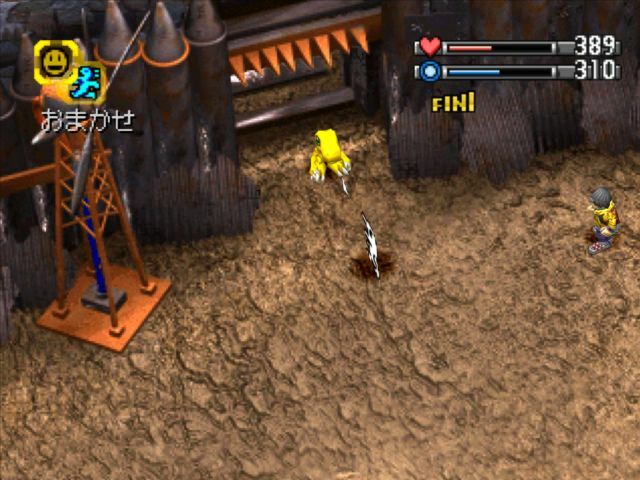 Past a certain point in the game another Digimon gets added to the Drill Tunnel, and if you haven't already beaten the boss Drimogemon, a glitch prevents you from ever finishing the tunnel. So there's a problem with this. Every time we do a dirt run, we gain +50 HP, +5 Offense, and +5 Defense. This job takes 10 runs to complete, so +1000 HP, +50 Offense, and +50 Defense in total. That would fulfill Meramon's parameter req, we've already met his Battles bonus condition, and we'll meet his Weight req as it's shared with Birdramon. I have absolutely no idea which one gets priority, and I don't want to find out like this. So we need to put Drill Tunnel on hold for at least a day or two while we wait for Samus to evolve. Drimogemon: They're really fatigued. First you should take a break. 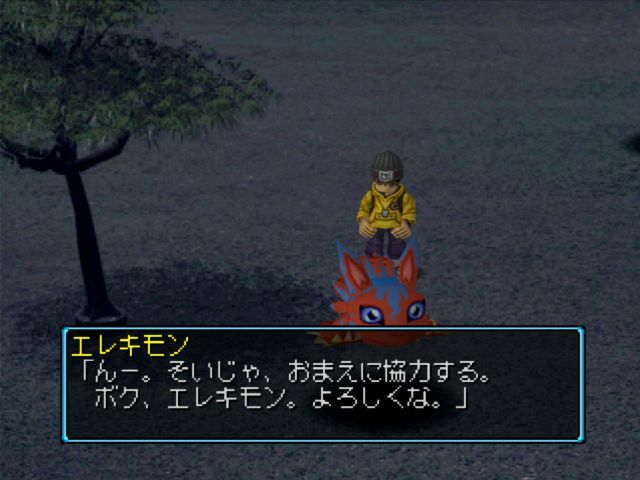 Something I never knew; if you talk to Drimogemon with high tiredness, he won't let you because you're stressed from training. 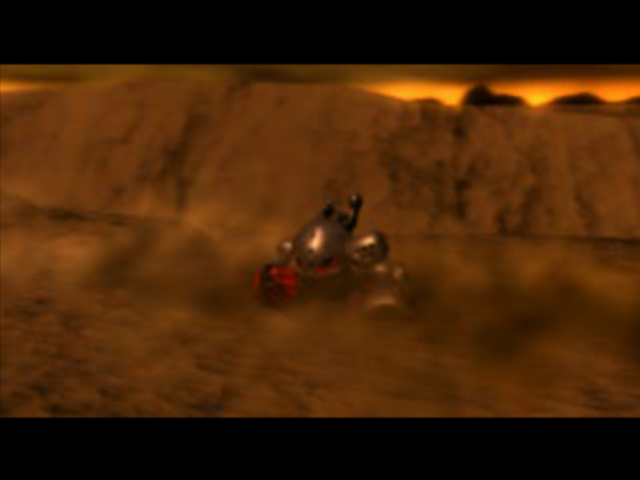 I'm not even sure if it can happen in the NTSC-U or PAL copies, because it seems that in the NTSC-J game the level of stress gained from carrying dirt is higher. Kentarumon: Hey, Touya. Are you surprised? I had an idea to open a clinic. Leave healing any sickness or injury to me. Though, I'm not saying it'll come cheap! 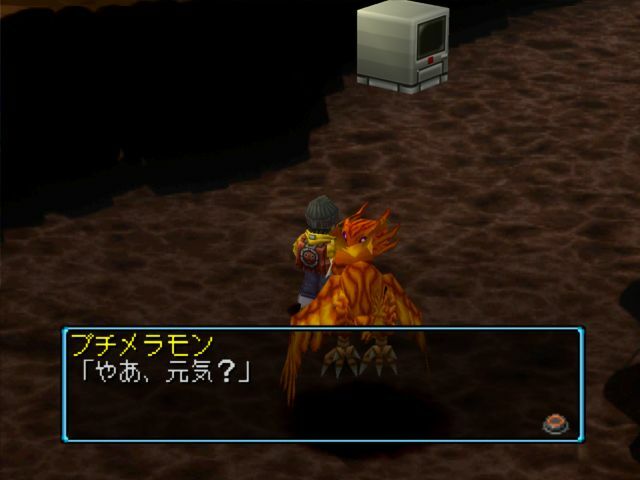 We can ask Kentarumon to, as the official localization put it, "take away his tiredness," or sell us medicine. In this game tiredness is an invisible stat, later games change this. It's measured on a scale of 0 to 100; the sweat bubble pops up at 80 stress. Carrying dirt is one of the most stress-intensive activities, giving +10 stress, the same amount you get from doing waterfall training. Kentarumon functionally replaces a different method of stress reduction--previously we could use Punimon's chair to rest and reduce stress by 10, whereas Kentarumon reduces it by 20. 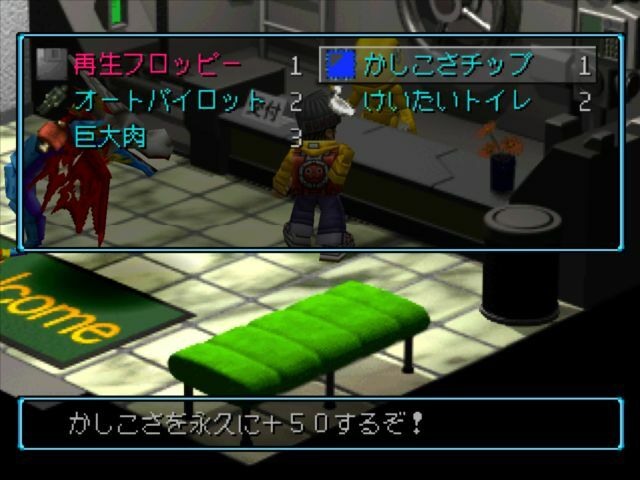 We can still use Punimon's chair if we want to manipulate the stress level down by 10, but there's not much reason to. You can read a bit more in-depth about stress here. Yuramon: Have you been to Great Canyon yet? It's rumored that there's a "Bridge you can't see" there. First, I take the time to spawn a Blue Apple. This is really just to take Samus' frown and turn it upside down, as it boosts Happiness by a whopping 30%, bringing her up to 70. I really should feel worse about grinding a 5% drop, but that's nothing compared to Shin Megami Tensei IV's 1/255 Fiends or Pokémon's 1/8196 Shinies. Touya: Is there really an invisible bridge in a place like this...? Touya: Ohh, I can walk here! The shop's name is originally Monochro Mise (モノクロ店 Monokuro Mise using the kanji 店 for "shop") but it was called the "Monochrome shop" in the English localization. I'm not a fan of this translation, as it doesn't convey that this is the name of Monochromon's store brand. "Monochromon" itself is a contested mistranslation. 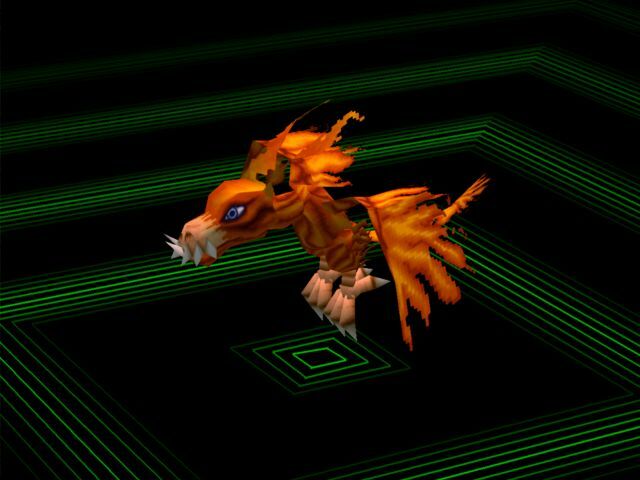 The Digimon's name is supposed to allude to Monoclonius, a dubious genus of dinosaurs that were probably just juvenile Centrosaurs mistaken for a new species. But given that Monochromon itself is primarily black and white, you could argue that the name is supposed to be a pun on Monoclonius (モノクロニアス Monokuroniasu) and Monochrome (モノクローム Monokuroomu) having the same initial phonetics in Japanese. (モノクロ Monokuro) Should it be Monoclomon, Monochromon, or Monochlomon? The simple answer: Bandai doesn't care, it's Picklemon time. Monochromon: Welco...Oh? Sir, this is the first time I've seen you, did you come from far away? Touya: We came from the village. Well, originally we came from another world. Monochromon: But you understand my words. Touya: Well, of...course...not, I guess? Don't you run the shop through words? Monochromon: I'd like you to help out a little. Monochromon: Won't you try working at my shop? Monochromon: Just half-day is fine. I'll increase your wage based on your earnings. You have particular understanding for words, and somehow I get the feeling you're talented. Monochromon: It's fine to worry. Regardless of how it turns out, I think it'll be helpful. It'll take about 8 hours, so wanna give it a try? >I don't have time now. There are a lot of neat details that I love about this shop. It has all kinds of merchandise sitting around. Stacks of meat being kept in a reheater like they're premade pretzels, rows of floppy disks by the register, a portable potty in the back. It's a really great render. OKAY SO, Monochromon's shop. This shop has been an endless source of frustration for gamers. And unlike with the Amida Forest, the rules are actually really obtuse. This minigame generates 20 customers in sequence, each of them requesting a particular item. We then haggle with them on the price until they either take it or leave it. Depending on how high we mark it up, our profit margin increases. Our goal is to hit 3072 bits in profit. 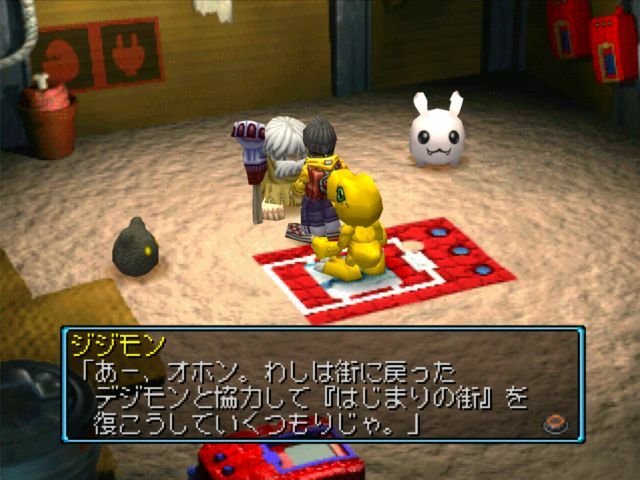 There are 4 kinds of customers, from worst to best: Zassoumon, Goblimon, Gotsumon, and Muchomon. Gotsumon: I want a Portable Potty. We then choose whether to go with that or reroll to offer a different price, canceling our own offers until the game has us pitching one we like. Gotsumon will accept base price 90% of the time, a 10% increase 70% of the time, a 20% increase 50% of the time, a 30% increase 30% of the time, a 40% increase 10% of the time, and a 50% increase 1% of the time. But even if a Digimon refuses our initial pitch, they won't walk out right away. Rather, each Digimon's probabiliy to leave rises the more they refuse. Gotsumon have a 10% chance to leave after the first failure, 30% on the second, and 70% chance from the third onward. This is thus a game of risk management. Portable Potties at their 300 Bit base price initially have a profit of 90 Bits. A 10% increase up to 330 is the safest gamble we can make, bumping the profit to 120. Meat has an abysmal base profit of 15 Bits. Zassoumon have a 22% chance of appearing. They have a 50% chance to ask for Meat, 35% for a Portable Potty, and 15% for Medicine. They will accept base price 80% of the time, a 10% increase 50% of the time, a 20% increase 20% of the time, and 30%, 40%, and 50% increases 1% of the time. They have a 20% chance to leave after the first failure, 60% after the second, and 90% after the third. Goblimon have a 35% chance to ask for Meat, 50% for Portable Potty, and 15% Medicine. They will accept base price 95% of the time, a 10% increase 85% of the time, a 20% increase 75% of the time, a 30% increase 65% of the time, a 40% increase 55% of the time, and a 50% increase 45% of the time. They have a 5% chance to leave after the first failure, a 20% chance after the second, and a 50% chance to leave from the third onward. I once had a Goblimon tell me the price was too high six consecutive times before calling it a good deal and forking over 1500 Bits for a Medicine. Muchomon have the lowest probability of appearing, 11%. They will ask for Meat 32% of the time, Portable Potties 35% of the time, and Medicine 33% of the time. They have the lowest chance to accept base price; they'll accept base 70% of the time, a 10% increase 65% of the time, a 20% increase 60% of the time, a 30% increase 55% of the time, a 40% increase 50% of the time, and a 50% increase 45% of the time. This means they have higher tolerance to higher prices than everyone except Goblimon, but they're tied with Goblimon for 50% hikes. The reason they're considered the best type of customer is because they have the highest chance to ask for Medicine. Medicine is how you win this minigame; it starts at 1000 Bits and has a base profit of 400 Bits. Technically the optimal move should be to try and sell the Muchomon 30% hikes, but because they appear so infrequently and can make or break your sales, many players prefer to just go all-in on selling them total highway robbery. 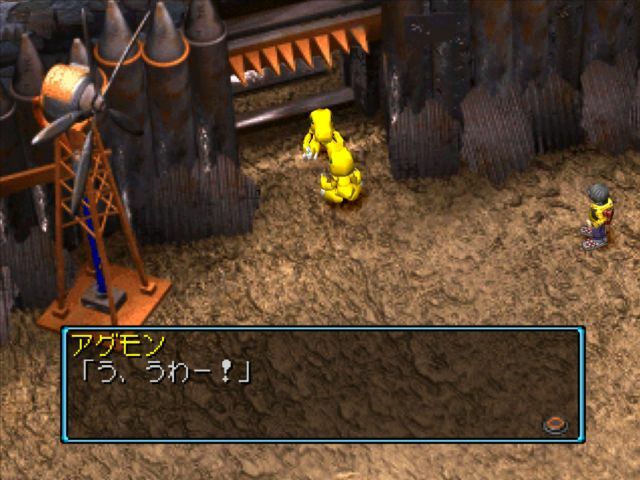 Those first waddling steps a Muchomon takes into the Monochro Mart are the single tensest moments in Digimon World. 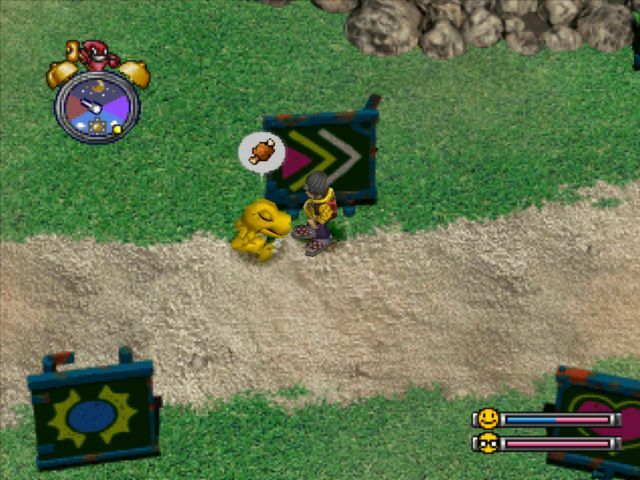 Every Digimon tamer that has ever touched this minigame has learned to pray to be visited by the Medicine Muchomon. I've always believed that they're just perpetual vacationers that have no idea you shouldn't pay $15 for a street hotdog. Charge Muchomon 65 Bits for Meat, 390 Bits for a Portable Potty, and 1300 Bits for Medicine, or if you're feeling like winning a coin flip charge them as if they're a Goblimon. The game essentially encourages you to be a big ol' racist that drives a hard bargain and yells at Zassoumon that their kind aren't welcome here. Monochromon: Hm, now it's about half done. Hah, these are pretty good sales. At this rate, we can turn a profit. Let me just highlight here that I did not win until customer #18 rolled in asking for a Medicine. 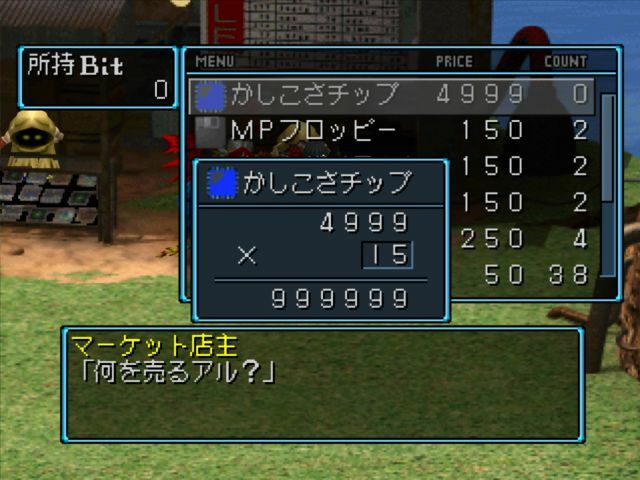 My information on this minigame originates from this Japanese Digimon World game wikis, which collected some very impressive data on how it works. I first put the data to test back in December, which is when I formulated an optimal strategy. Monochromon: Now, it's time. No less than I said I expected. Your wisdom, motivation, and natural virtue are enough to save this island. Monochromon: Sorry. I was testing you, to see whether or not you possess the qualities needed to save this island. Surely, strength in battle is important. But in addition to power, if you have no wisdom or courage I think it will be difficult to save this island. I'm sorry to have troubled you. Touya: So, did we pass? Monochromon: Beyond everything I could have imagined. From now on, I will assist you with all my power, for your sake. Touya: So you'll come to the village. Um? But what about this shop? Monochromon: Well, I can always build a new one. This shop has already played its part. Our pay is based on how much we made. If we make 1536 Bit or less, we get 500 Bits. If we make 1536~3071 Bits, we get 1500 Bits. For anything that passes Monochromon's test or above, we get 2000 Bits. In the NTSC-U game, the money message is notable for being one of the only places where the game says "two thous bits," whereas everywhere else it says "two thou bits." 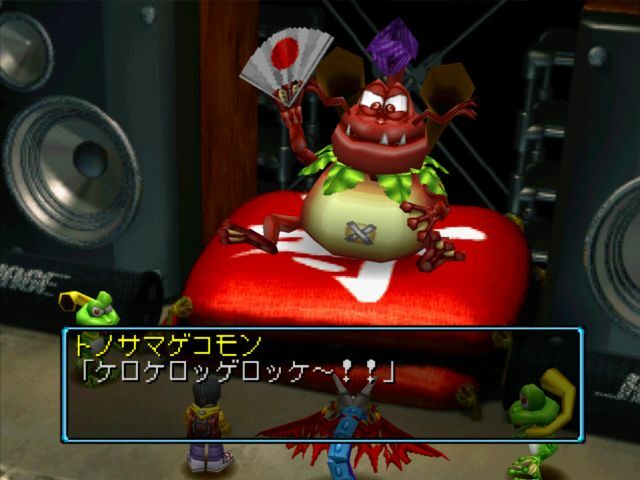 Jijimon's dialogue for Monochromon's recruitment is cut off, saying "Monochromon came in here talking about working as an He's a professional." So that's sequence break #1. Monochromon will fully expand village shop to well beyond what we're supposed to have access to right now. Touya: Eh? Just now, did you feel the ground move? ...Must be my imagination, huh? In this sequence, you have to walk around for a while after feeling the first quake. 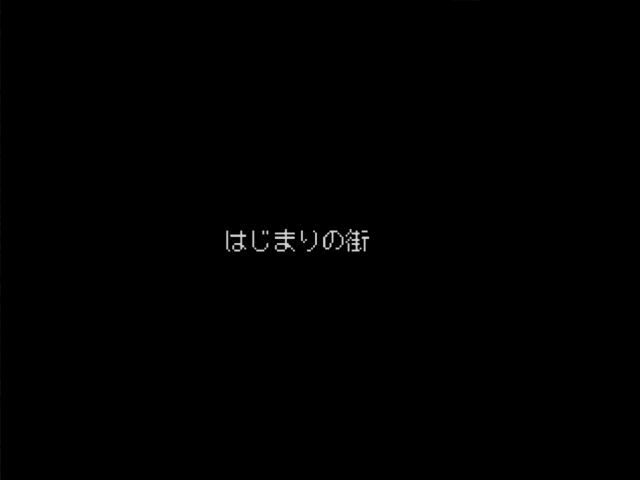 Touya: ...Even though I fell from so high up...I'm fine. Hey Samus, are you all right?! Looks like you got hurt a bit. I'm sorry. Now, let's go. 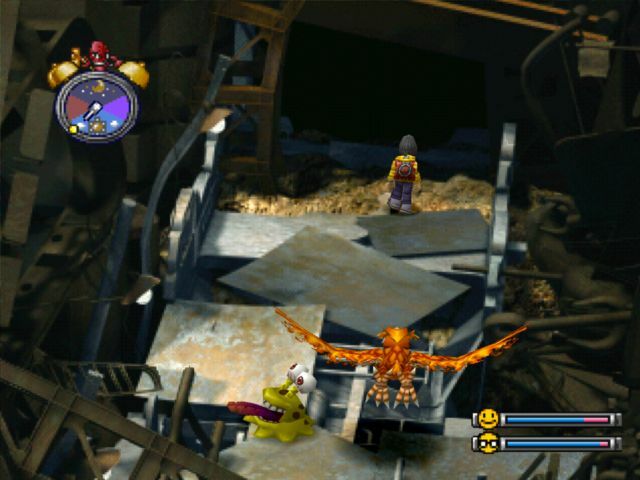 If you fall down here while having a Digimon that posseses wings, the player character will accuse them of "cheating" by flying down. The first time I ever fell down here, the canyon spawned a Deluxe Mushroom. It's another 5% item, this one gives +5 to every stat. I don't think it was ever seriously intended as anything more than an area-specific easter egg. Even without the ridiculous stat-inflating methods I'll cover in this chapter, pretty much every other in-game method of buffing stats is faster (both real-world and in-game) than farming Deluxe Mushrooms. Touya: Hmmm, there's no reaction. Oh, there's a pebble in the machinery. Now this here is...? Touya: It should be fine now. The real purpose of falling down here is to enable the elevator up top, which wouldn't move before. Not only can it return us to the level we were on before, it can also go one floor higher, which isn't otherwise accessible. But before that, we head south a bit to get to the Fortress Entrance, which has an actual missable scene. 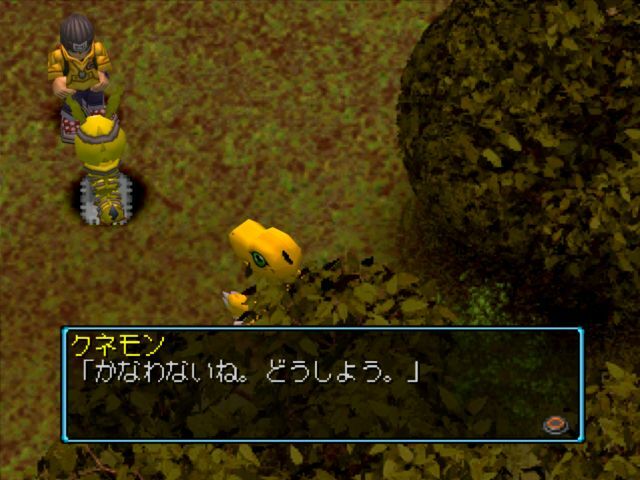 Agumon: Hm? Who the hell are you? Get outta here! Touya: What, is this place yours? 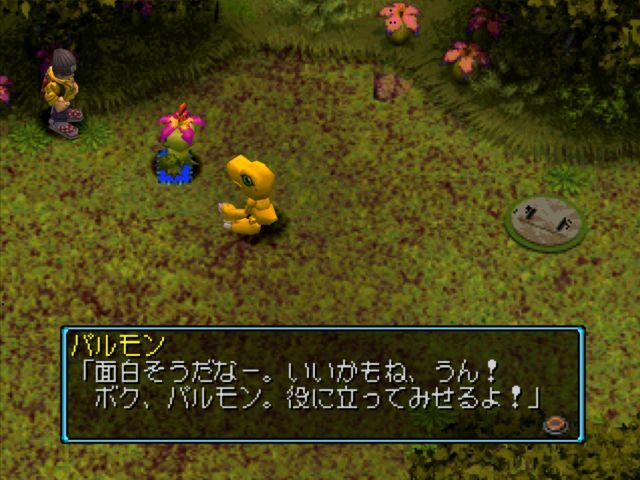 Agumon: I don't have to tell you a thing! Touya: ...Are you a lookout or something? 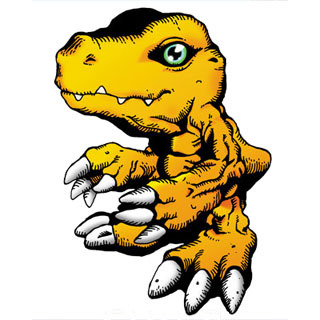 Agumon: You're real persistent! I'll mess you up! >There's no need to provoke him. Doppelganger Battle is used instead of Refusal Fight whenever the boss isn't a recruitable villager. 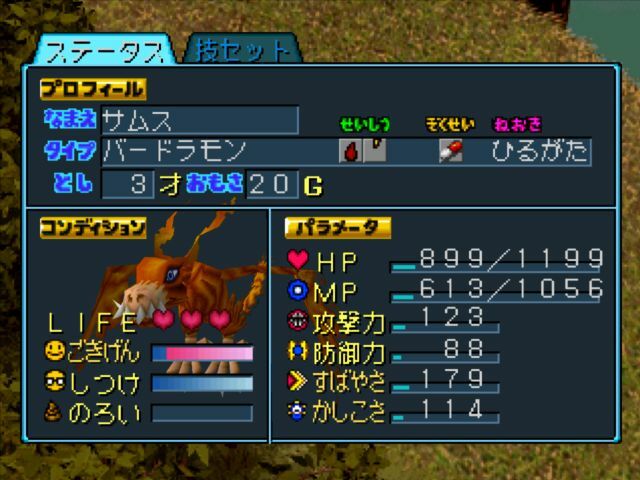 This Agumon has higher Offense than ours, but we have greater Speed which lets us get the drop on him in terms of stunlocking. He can inflict Dot/Flat with Heat Laser, but once we get a lead we don't let it go. We learn Fire Tower after this battle. ??? : We do tons of bad things. Don't go intruding without our permission! Hehe. Touya: Ugh...We'll have to come back later. We can't actually do the Ogre Fortress until we trigger a set of flags at the village, and at the Gear Savanna-Great Canyon entrance. 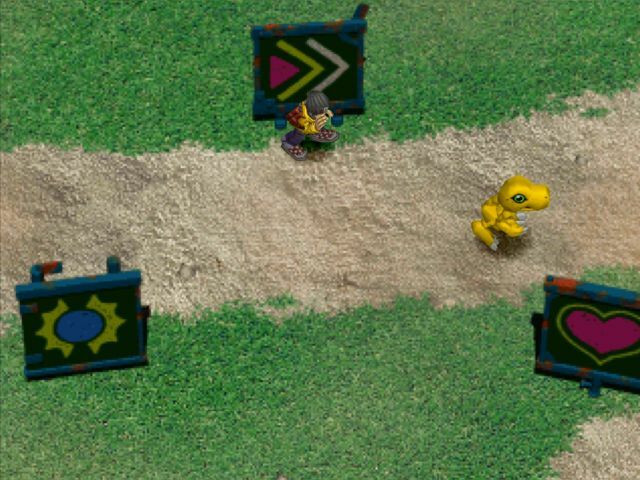 This Agumon fight is totally missable because if you set off those flags first, you'll never need to fight him. Jijimon: Monochromon came here, talking about joining the item shop. Hmhm, as expected of a professional! This line is cut off in the official localization. The village's Prosperity is currently at 10. I can push it up to 11 by doing something I shouldn't know about, but I'm deliberately waiting to show it off as it was intended to be seen. Monochromon: Touya-san, Samus-san, I was able to open an item shop. I've got this feeling it'll be a great success! 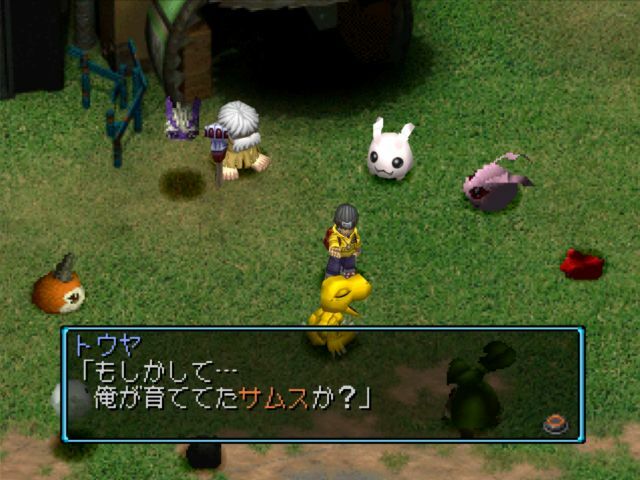 If more Digimon come the village , I can stock more kinds of products. Please put up with our stock for now. Monochromon takes over for Betamon and Coelamon, selling Recovery Floppies, Medium Recovery Floppies, MP Floppies, Various Floppies (recovers status errors), that one floppy that prevents status changes, Offense Plug-ins, Defense Plug-ins, High-speed Plug-ins, Autopilots, Portable Potties, and Meat. Personally, I like to always have at least two Portable Potties and two Autopilots on hand. In the official localization, these are called Happy Mushrooms. The original word is undameshi, meaning to test one's luck. I contemplated going with the better-sounding Moonshot Mushroom ("to shoot the moon") or Coinflip Shroom, but shooting the moon involves an impossible gamble and coinflips are 50-50. Those names both imply a certain (inaccurate) description of how the undameshi kinoko works. Spoiler alert: Dinosaurs evolved into birds! 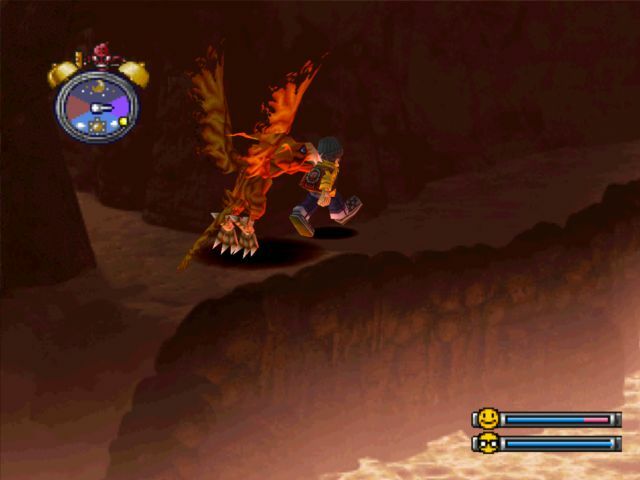 A Giant Bird Digimon which has an appearance shrouded in blazing flames. 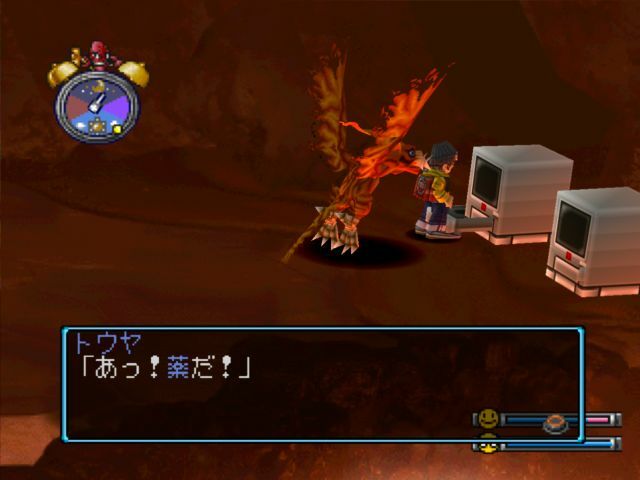 Just like Meramon, it is a Digimon that was generated from the Internet's defensive "Firewall". It flaps its gigantic wings, and flies about the sky. Although its personality is in no way combative, it unleashes counterattacks against attacking enemies to a furious degree. 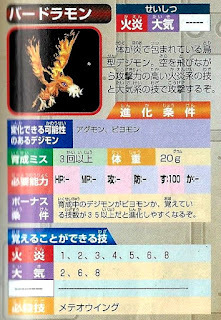 Its Special Move is flapping its wings and hurling its feathers like meteors, Meteor Wing. Birdramon loses access to Battle techs in favor of Air, a trade that I'm totally fine with. So the real reason to raise a Birdramon will have to wait until I can get her Happiness up to 100--something that I intended to do already, but sacrifices had to be made to raise Discipline and RNG wasn't throwing up Blue Apples my way--but that's fine seeing as Stress resets with every evolution and I need that to reach 100 as well. We have 6 days to meet the requirements for Perfect, which gives us a lot more leeway than before. 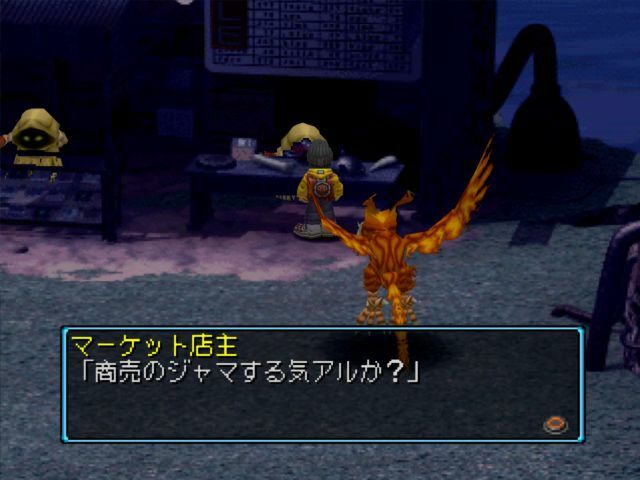 Now Birdramon only evolves to Hououmon normally, and having 100 Discipline already we could very well meet those requirements in a day or so by making 3 Care Mistakes, (they reset on evolution) but that's not what I have in mind for Samus. The further we progress in the part-time job, the deeper the tunnel gets. This is after 6 runs. And we stumble on a Betting Mushoom! This one goes in my pocket for later. The mechanics to learning techs are pretty interesting. 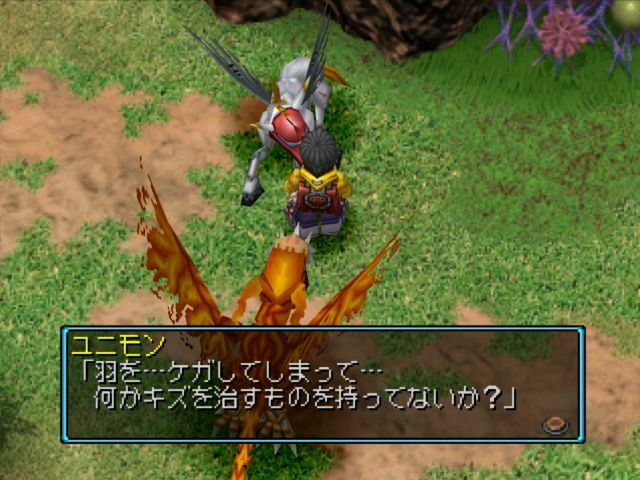 Every Digimon has at least one specialty, which dictates what techniques they can and cannot learn, as well as their probability to learn them from a defeated Digimon. The game doesn't roll to see if you've learned them until the battle actually ends. We learn Wind Cutter from this Yanmamon. Battles raise both Hapiness and Stress. 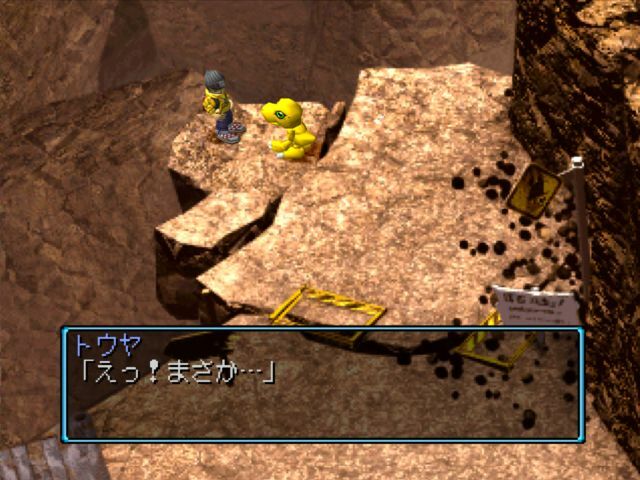 Drimogemon: Oh, it looks like you carried out all the dirt. We made a lot of progress thanks to you. Just wait a little bit more. The next time we enter this screen, the hole's gone through. 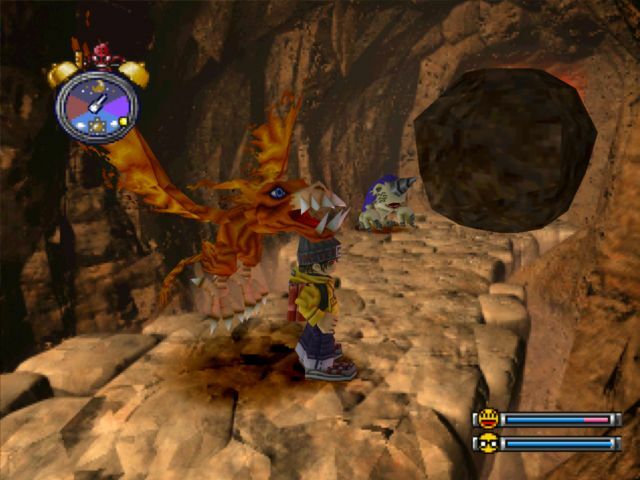 Drimogemon: No good, we hit this huge, hard rock! It's impossible for us to dig through this one. Touya: Ehh, impossible...That can't be! Drimogemon: We can't push it out of the way...Can you? Touya: US?! Samus, I'm counting on you! 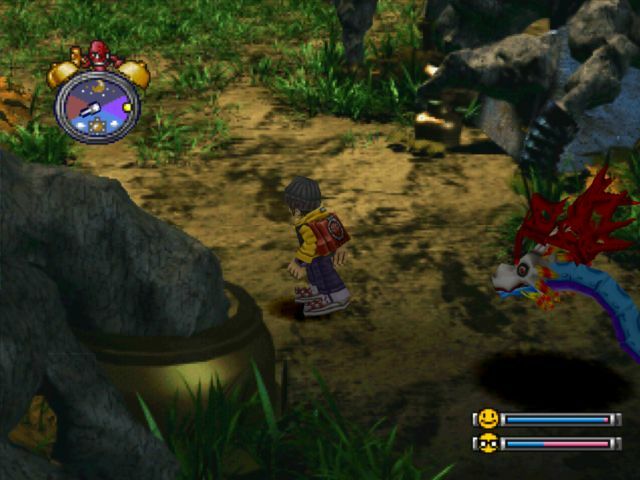 Whether your Digimon will be able to move the boulder or not is dependent on their Offense. 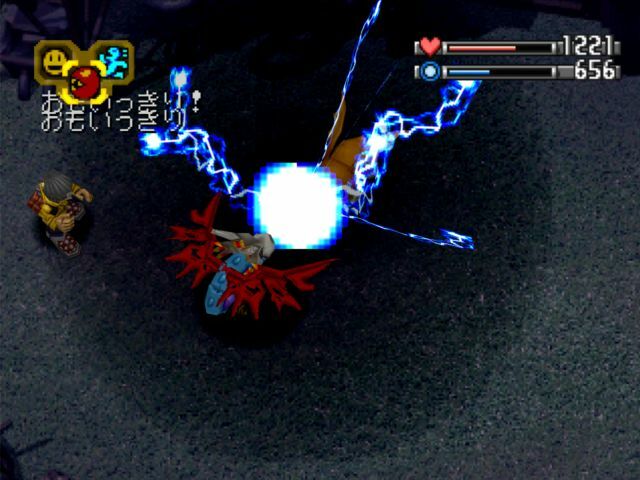 Drimogemon: Whoa, that's some unbelievable power! You moved that huge rock. 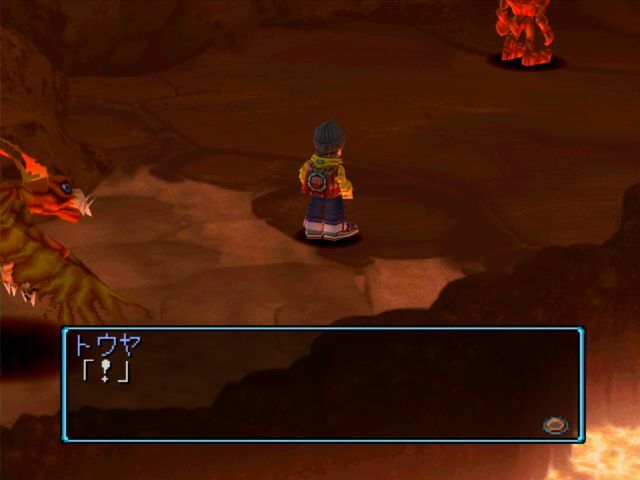 Touya: The back of it seems empty...Whoa, it's a lava stream! Get back, get back! There's a path leading to the back next to the river...Let's go! 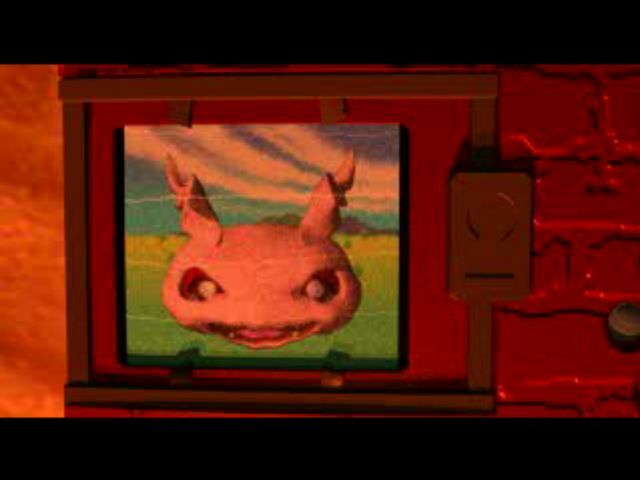 Drimogemon: Oy, you're heading in? Be careful! I absolutely adore the character models in this game. 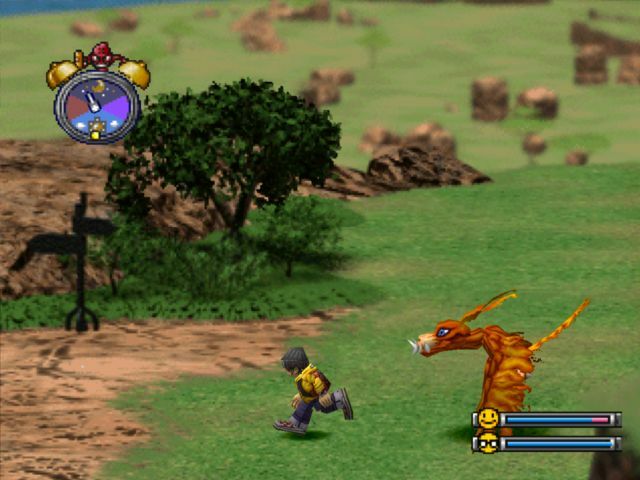 Modern Digimon games have a sameness to them brought on by the newer models, which generally try to adhere as closely as possible to Watanabe Kenjii's character designs and Toei's key art. While I appreciate accuracy to Watanabe's designs, World makes its own little tweaks to the models in terms of proportions and aesthetics that make them feel very animated and alive. 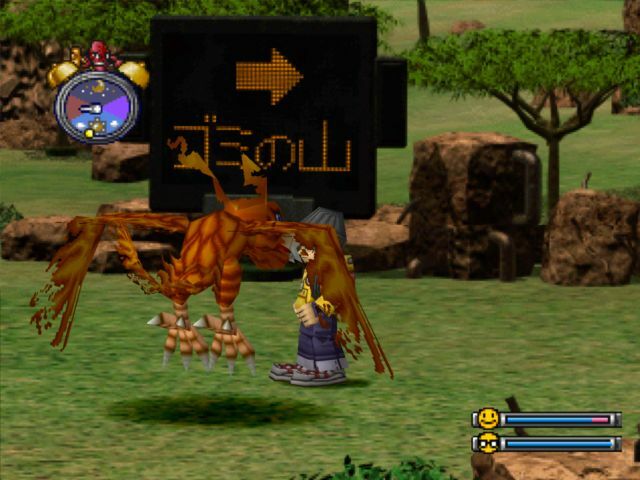 The hyper-realistic Birdramon model in -next 0rder- doesn't move very well and isn't particularly flexible, while the super deformed model in World has a ton of animation and constant motion to it. You can see an example of this in the victory animations. When Birdramon wins a battle in -next 0rder- she caws and flaps her wings a few times; when Birdramon wins a battle in World, she circles the battlefield bobbing up and down on top of that. Meramon: Just when did this island change...With each passing day the tribes fall apart...They lose their memories, only to become feral...How long til I too lose my senses...? Touya: Stop it! Don't you care if you ruin the island?! Meramon: Who are you!? Stand aside! There's no longer any other path but this! Meramon can inflict Flat with Heat Wave to temporarily check our Spinning Shot, but his real bread and butter is Magma Bomb. 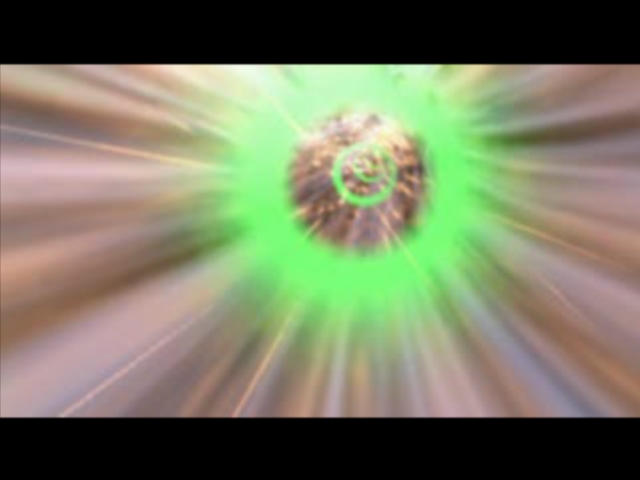 Magma Bomb has good range, a wide area of effect, and can interrupt us pretty well. 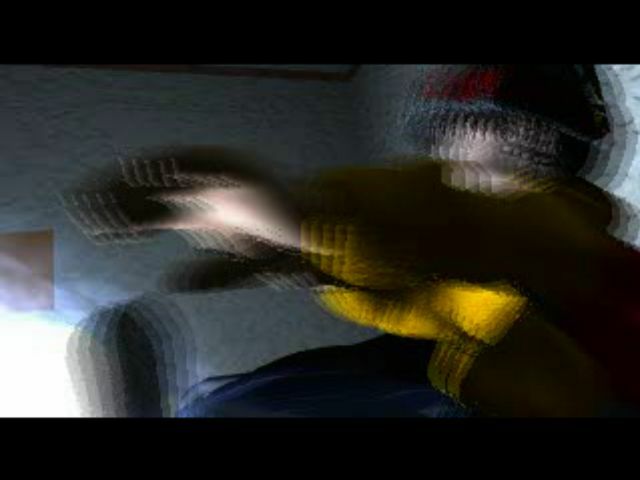 We're still at the stage where brute force is paramount, but as demonstrated in the video timing plays a role as well. Executing our finisher at the right moment was what allowed us to pin Meramon despite not having many items on hand. Meramon: Haa, haa, what a stupid thing to...What other path do you speak of?! Touya: If the island is destroyed, we'll lose everything anyway! It's going to be fine, so just listen. Touya: We're creating a village for the sake of the island. All of the island's Digimon are gatehring there. 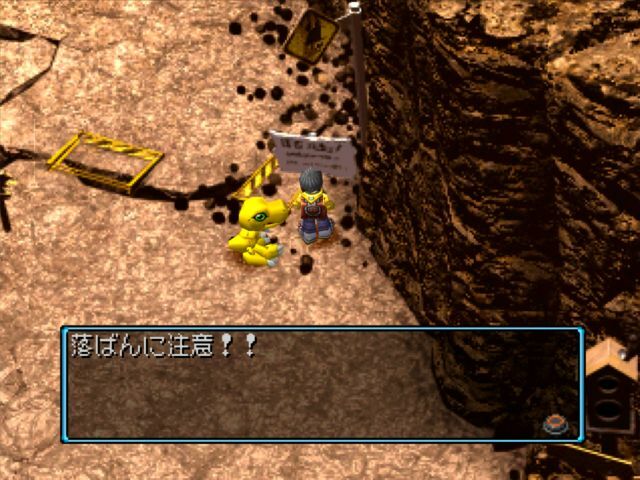 Because if we unite the Digimon, it's said that we can do anything, even deal with the island's disaster. Touya: We're doing that right now. There's nothing we can't do! Touya: If you believe us, then I want you to come to the village. Meramon: ...I understand. I'll go to the village. That will be my new path! Meramon drops an Offense Chip. The chests nearby contain another Offense Chip and a Medicine. 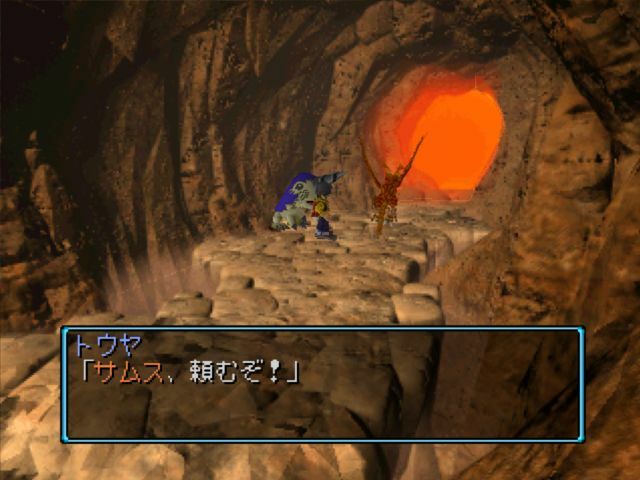 The lava drains away and cools down the moment Meramon's been defeated. 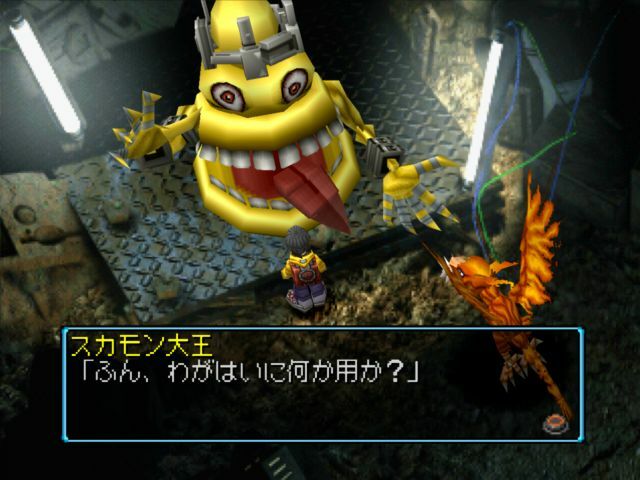 I think Drimogemon telegraphed it enough earlier, but Meramon is one of the first major "storyline bosses" we'll face. 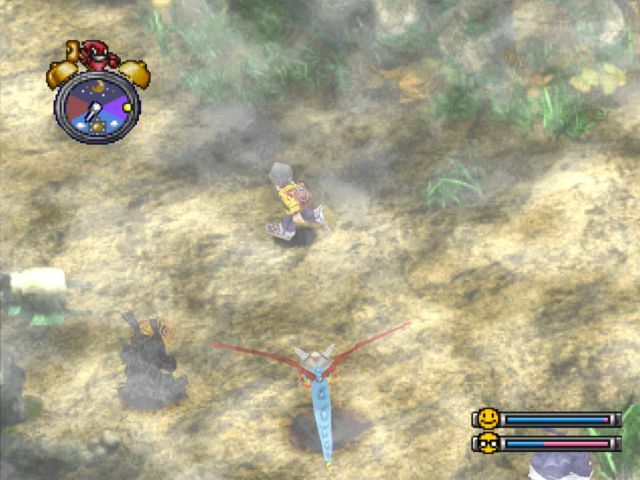 His defeat is tied to two critical paths into other areas. 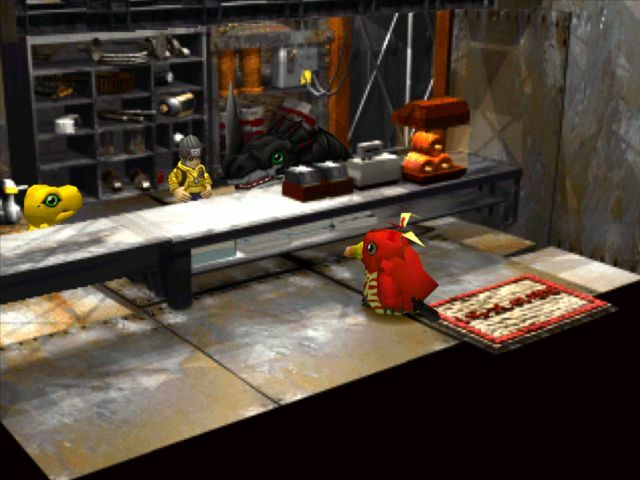 Drimogemon: Ohh, it'll be open in a bit! Petit Meramon: Yaa, how you feelin'? 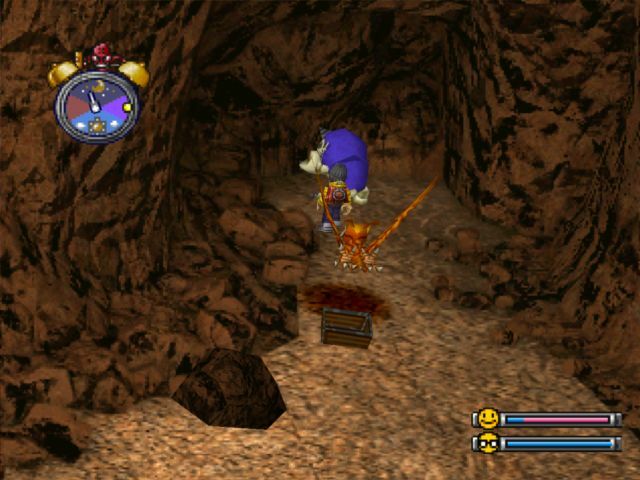 The Petit Meramon are just non-player characters that appear after Meramon's been defeated. They can't be fought or raised (they're Baby II-level) but they do make a nice addition to the game world. Petit Meramon: Nice to meet you. You know bout Digimon cards? I'm collecting Meramon cards. If you have any, I'll buy them for 1500 Bits. This sounds like a nice chunk of change, but the moment we have access to Digimon cards we'll also be able to access an infinite source of cash. I still like to get him a Meramon card at least once per playthrough. 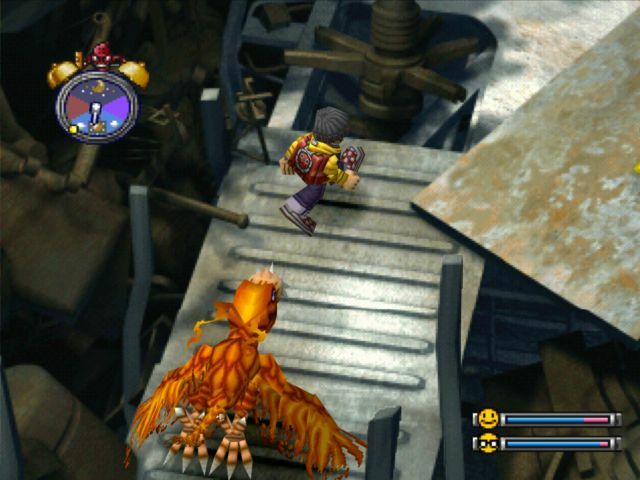 The chests in this area have an Anti-change Floppy and an Attack Plug-in S. Anti-change Floppies prevent status errors from being inflicted on our Digimon during the battle that they're used, while Plug-ins raise the relevant stat temporarily. ...Nn? What? This'll still take a while. Go somewhere else. "That last earthquake cleared the earth and sand!" Miharashi-yama edges a little closer to "Lookout Mountain," but the official translation is perfectly servicable here. Unimon: I hurt...my wing...Do you have anything to heal cuts? A lot of people are confused about how to trigger Unimon. 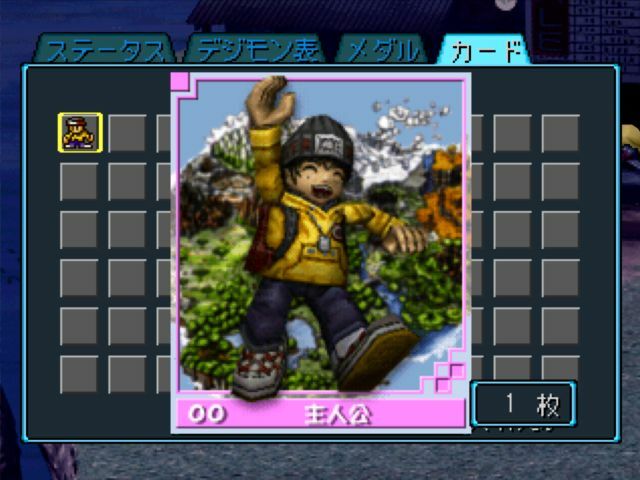 He only appears on this screen of Mount Panorama between 12:00 PM and 6:00 PM, and you have to have recruited Kentarumon beforehand. 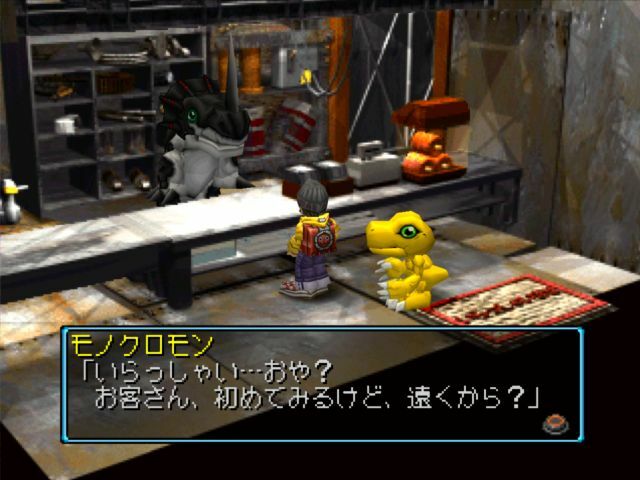 Where they get lost is that you also need to talk to Kentarumon first, and only then will Unimon appear. We can give him any kind of HP recovery floppy, or a Medicine to heal him. Unimon: Huu...It's gotten rather well. Thank you. Touya: Can you fly already? Touya: I see...That's right, there's a clinic in the village. You should check that out. It's pretty close from here. Touya: Hehe. Go and rest well there. Unimon: I'm sorry...I'll definitely return this favor. Befitting its name, Mount Panorama has some incredible sights. Much of Gear Savannah is visible from its peak. Unlike most of the Digital World, there's nothing particularly digital about this scene--it's a wholly natural landscape. The sign alternates between reading "Trash Mountain (Right)," "Mount Panorama (Down)" and "Factorial Town (Up)." I always check this screen of Gear Savannah when I pass through, because it has a 1% chance to spawn a lifespan-extending Chain Melon. This was only discovered in 2012. Touya: Huh? What's going on? Touya: This is bad, we gotta help! ??? : Pick on someone your own size! 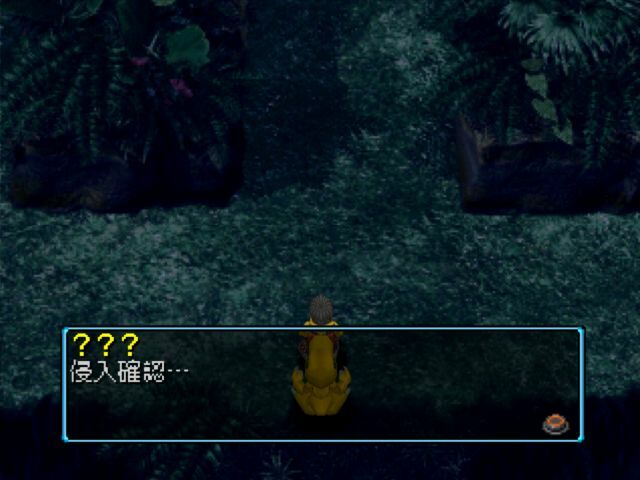 Leomon: Are you all right? Leomon: No need to thank me. You can always call on me when you're in trouble. 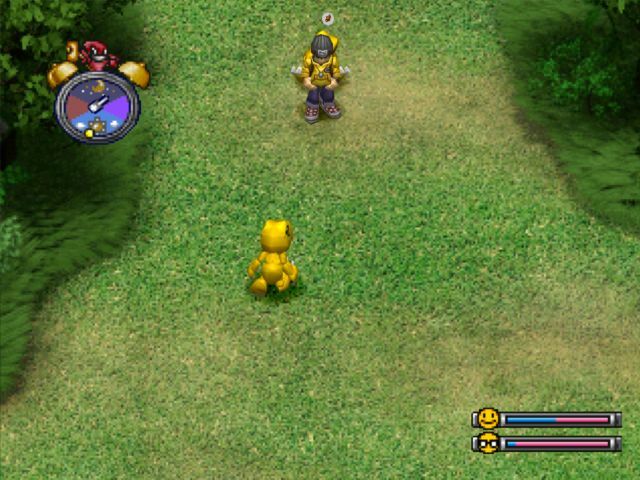 I, Leomon, will immediately come to your aid. So then, let us meet again! Touya: ...Amazing...Like a hero! What's with him, getting all that juicy credit? Leomon: I've heard the rumors about you two. You've been a great success. Touya: If you've heard about us and the village, why don't you come join it? Leomon: ...Let me think about it. Like you, I've been thinking on this island's fate. And...I have something I've been searching a long time for. Touya: What are you searching for? 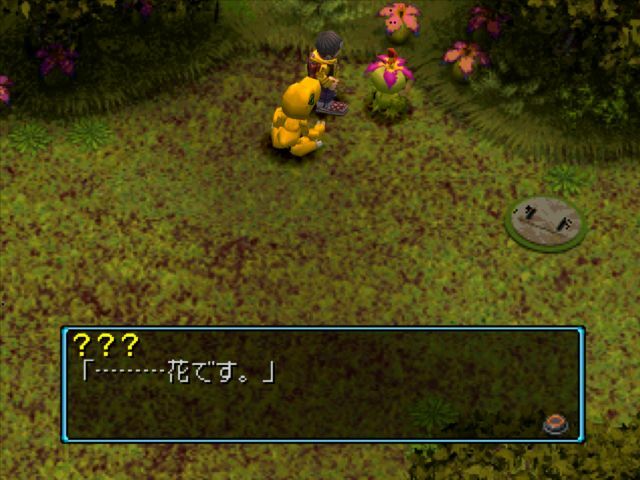 Touya: I see...If I find something, I'll tell you. 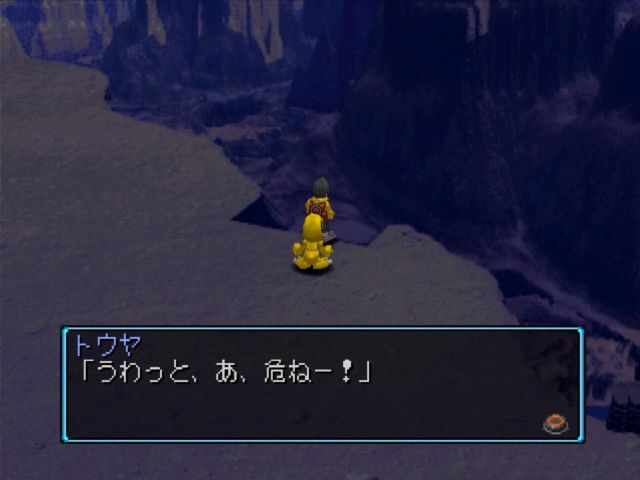 Leomon: Haha...I've searched for many years. I don't think it'll be such an easy thing for you to find. But I promise you this. If perchance you find it, I will go to your village. One thing that doesn't come across so well in translation is that every time someone says "your" in this game, it's in the plural. ("you all") The protagonist is always referred to alongside his partner, not separately. 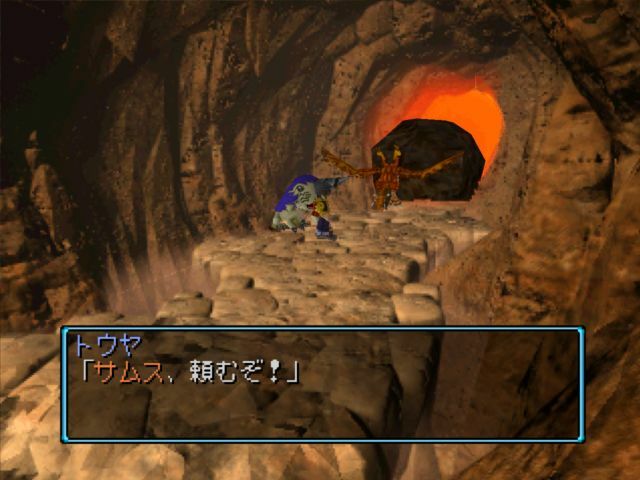 Trash Mountain is inconsistently referred to as Trash Pile in the English localization, but the area name is still given as Trash Mountain in the transition screens. Scumon: Ooh? This is rare! Touya: Ghh, moving and talking POOP! Scumon: Ooh? You talking about me? I'm the Mutant Digimon, Scumon. Scumon: You've got the right idea. We're made from the feces of digital data. Scumon: You planning to live here? Touya: Eh? I wasn't thinking anything like that at all. Scumon: Good. This paradise is exclusively for the Scumon family. It would be bad if those of other tribes were to live here. Touya: So you mean you can't live anywhere else? Scumon: Huh? You can't live here, but we can give a tour to our customers. Touya: Ah, umm, I only came to look. Scumon: Ohh, I see. Don't go making the Great King angry. The Great King can turn you into something unsightly with his ability. There are at least three different versions of this conversation. The first one is the infamous "Oh my goodness the poop are moving and talking!" dialogue everyone remembers from the official translation. The second is for if you somehow "learned about" Scumon beforehand, which I'm not quite sure what the trigger is but I've definitely done it, and the third is for if you enter while already having a Scumon as a partner. The Great King they're referring to is Daiou-sama originally, and I'm uncertain how to approach it. 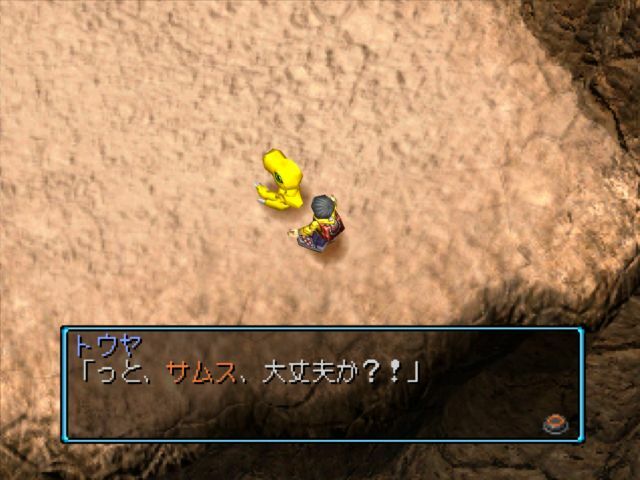 Daiou-sama is ridiculously polite, but the convention with Digimon names is to leave them as-is. (i.e. 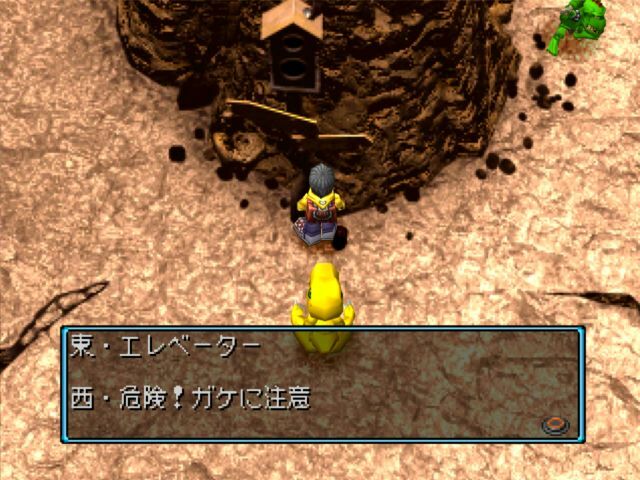 Karatsuki Numemon, Yuki Agumon, Yukimi Botamon, Tonosama Gekomon...) The advantage of an LP format versus a patch is I don't have to actually commit to a specific translation for an honorific. Scumon: Hmm? This is the Dust Kingdom. But to you guys it's just Trash Mountain. Even so, useful items sometimes fall here. That's right, I saw some long rod over there. Touya: Oh, an old fishing rod! This is necessary to complete a ton of sidequests. It's called the "oldfish" in the NTSC-U version. Scumon: Hmmm, I'm collecting Digimon cards, but I want a Scumon Daiou-sama card. Would you trade one for an Etemon card? Touya: Sorry, but I don't have one. Both of these are S-rarity, so it would be an even trade. There's no particular reason why you would have an Etemon card in your possession, it's just a neat worldbuilding moment that can make card completion slightly easier. Scumon: Nnnn, just a minute you two. Did you come from the village? Nnn, just between you and me, I'm a liiitle interested. I'll pay you a visit. Scumon: Nnn, just a minute you two. Do you know the Scumon family's special property? We take poop just lying round into our bodies, and convert it into energy! All of the Scumon here have a habit of beginning their sentences with uun "no," but they're not really saying "no." It's more of a verbal tic. This is Trash Mountain's unique training station, submersion in garbage. It massively raises MP and makes the player giggle uncontrollably while their partner sits in a pile of feces. Scumon Daiou: Poo, do you need something of Us? Scumon Daiou: Poo, if you have a request I won't listen. Because We are a king for the Scumon alone! Scumon Daiou/Great King Scumon is a special NPC that can transform our partner back to their original state if their Virus gauge gets too high and they turn into a Scumon. Most every area of the Digital World has its own unique toilet. Re:Digitize follows suit with the custom toilets, but -next 0rder- has every one of them being interchangable futuristic portapotties. Piyomon: Hn? Who is it-piyo? N-no way...H-hyeeeeepiyo! 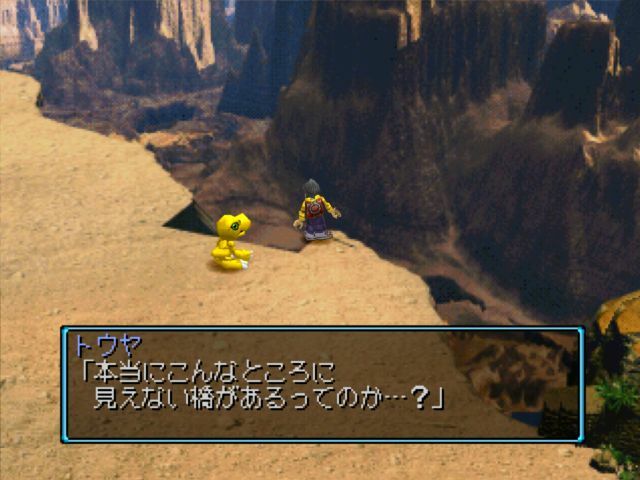 Piyomon: Wa, here he comes again piyo! Touya: Ugh, again! Wait up! Touya: Mmm...At this rate, we'll only repeat this. Piyomon's minigame is pretty simple. You send your partner after him, and they bring him back over. You can pick one of several spots to stand in, you just need to make sure that you're standing at the spot where he'll run once they're chasing him. Piyomon travels only in fixed directions, so it shouldn't take too long to get him once you've figured out where he's starting from. Piyomon: H, hiee. Please just ignore me-piyo. Touya: Now hold on a sec. We're not bad guys. 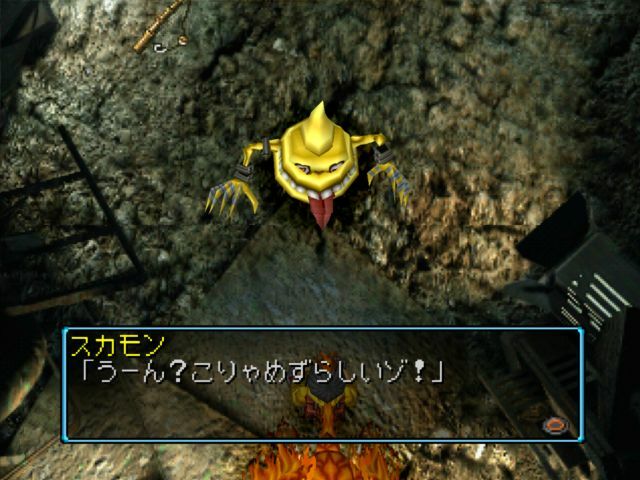 He actually says warumon here, which is a normal word, but Piyomon could probably interpret it to mean "evilmon." Piyomon: Eh? You're not the rumored Digimon-napper? 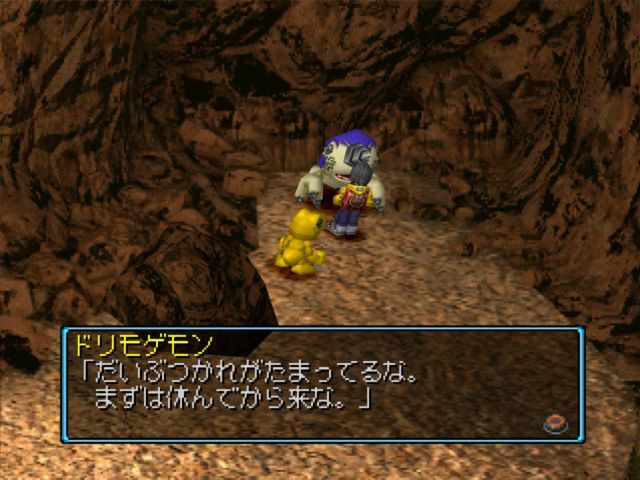 Piyomon: I see-piyo...We had a misunderstanding, pi'know. I gotcha-piyo. I'll go to the village-piyo! 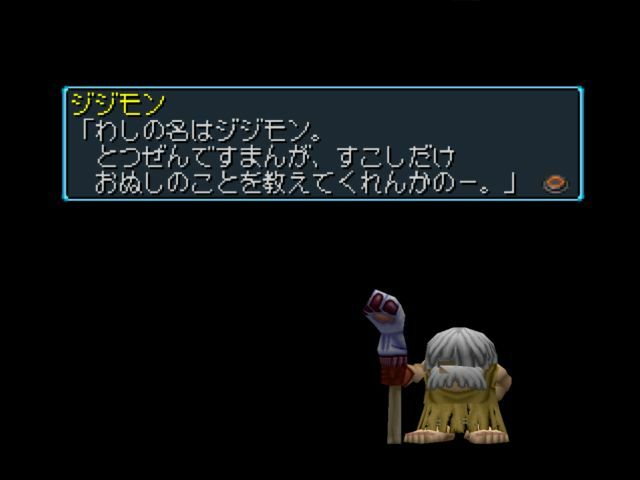 Is this "Digimon-napper" a misinterpretation of everyone going back to the village, or a cryptic reference to the antagonist? 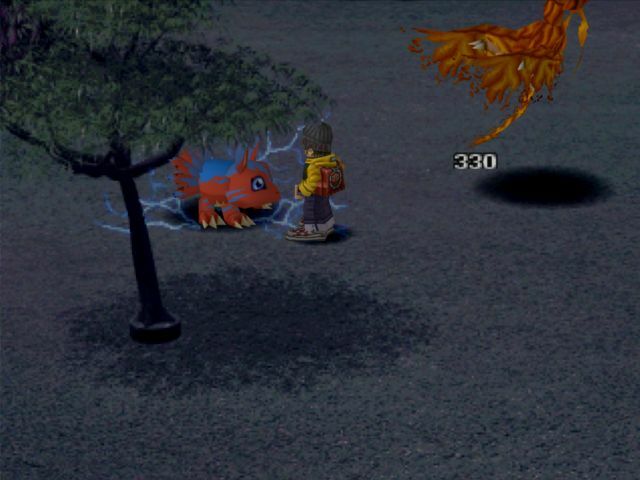 Elecmon: Ahaha, touch me and you'll get a zap. To recruit Elecmon, you have to repeatedly let him shock you. Elecmon: Hey, hey, you...Doesn't that hurt? Elecmon: Whoa, amazin', you got guts kid. You, you're a sight to see! All right, I'll do whatever to help. 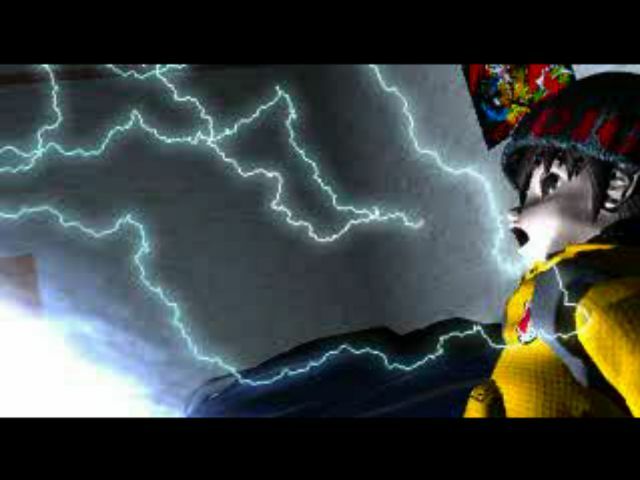 Touya: ...That electric power, would you try using it to help the village? Elecmon: ...Village? Heck is that...Sounds familiar. What is it? Mm. In that case, I'll cooperate with you. I'm Elecmon. Nice to meetcha. Market Manager: This is a Digimon Card shop. 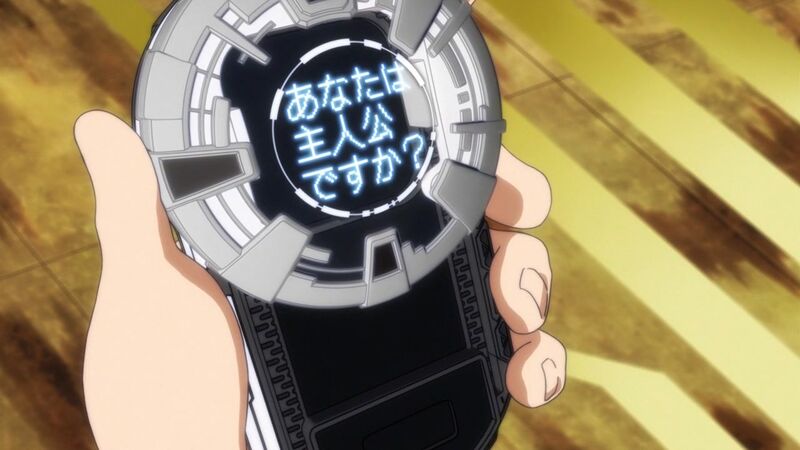 Touya: "Digimon Card?" What's that? Market Manager: Collecting them's become a big boom right now. And collecting them's not all you can do. Market Manger: Anyway, I'll put this one on your tab. Don't be a stranger. Touya: Whoa! This is my card! This is one of two cards that can't be bought or sold, and has no rarity. A promo card, essentially. Market Manager: This is a "Recycled Goods" shop. "Recycled" is a polite way of saying "We don't know where it comes from and we don't care." 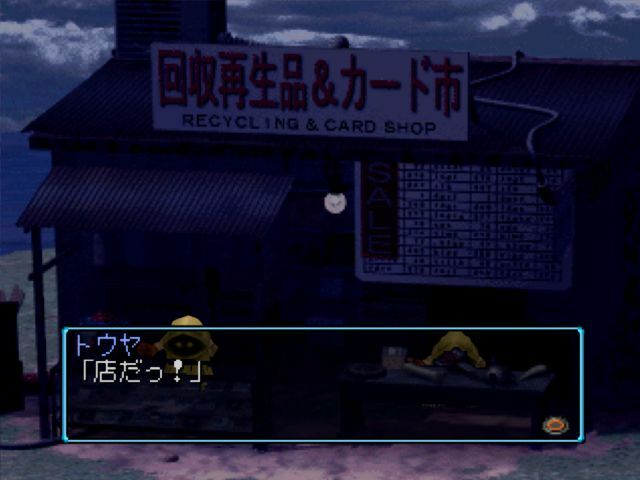 They also deal in regular goods, but the Recycled Goods shop allows you to buy back items that were stolen after you lost a battle. Both the card shop and the Recycled Goods shop are only open during the first fifteen days of every Digital World year. They'll be instrumental to executing the infinite money glitch in a bit, but we have some business to attend to first. Elecmon: Whaddya think? It's a bit brighter with the lights on, yeah? Let's make a brighter village for everyone! 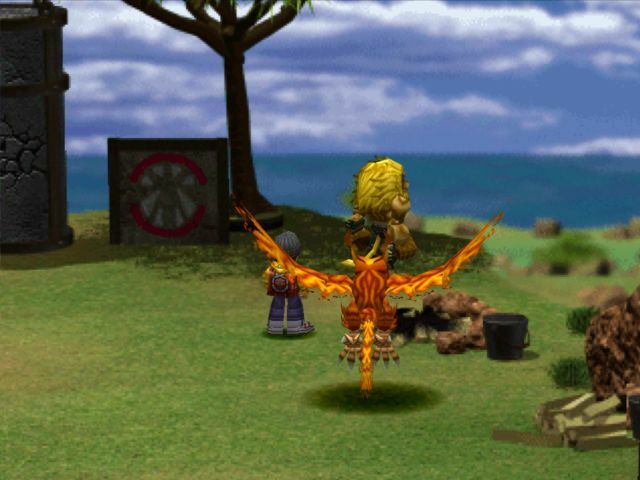 Every Digimon you recruit appears somewhere in the village, no matter how small a role they play. 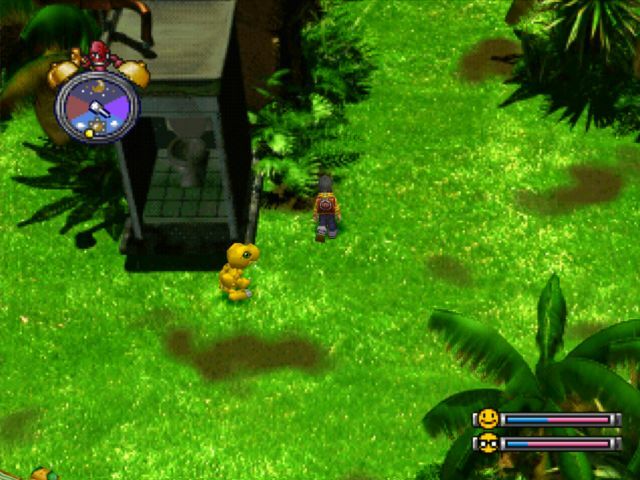 Elecmon's additions are naturally best viewed at night, but they're bright enough to show up in the daytime too. The restaurant can eventually have up to five chefs, who each work at different times of day. Their foods do different things depending on who's serving it, with each offering three meal options. Their meals also raise Happiness and Discipline, but like any other food, can only be eaten when hungry. Fun fact: running from battles decreases both Happiness and Discipline, while going to the toilet raises Discipline. It took a while, but with Happiness and Discipline finally capped out, we can at last use Birdramon for her intended purpose. This little secret is so poorly known that Japanese Digimon tamers have documented the opposite conditions necessary to trigger it. I was really curious about how the heck you were supposed to get a Birdramon or Seadramon with 100% Happiness, 100% Discipline, and 100% Stress. Raising the former two involves decreasing the latter, and vice-versa. When Birdramon or Seadramon goes to sleep with 100% Happiness, 100% Discipline, and 0% Stress, they have a 30% chance to slide-evolve to Airdramon upon waking up. A Mythical Beast Digimon that grew gigantic wings. It's an extraordinarily precious monster said to have an existence close to that of God. 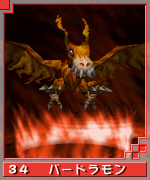 It specializes in mid-air attacks, its roar calls forth storms, and it causes giant tornadoes by flapping its wings. Its personality is considerably brutal, but it has great intelligence. However, it doesn't seem possible to be used by an ordinary Tamer. 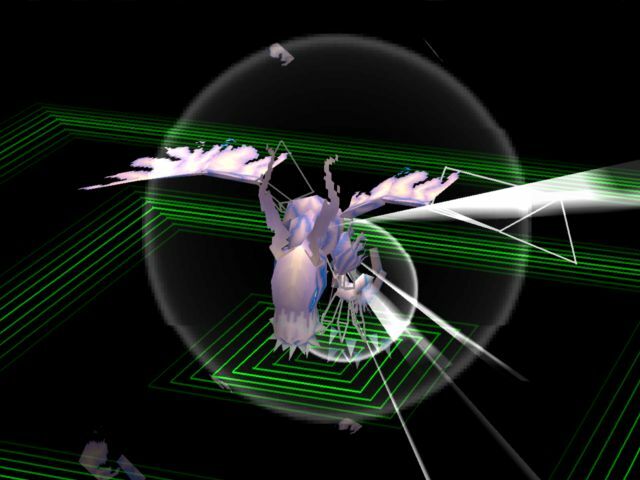 Its Special Move is flapping its enormous wings to send out a sharp vacuum blade, Spinning Needle. 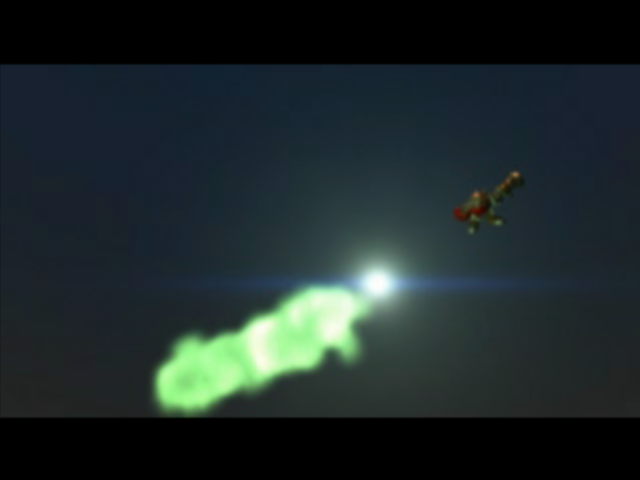 Airdramon has access to a greater number of Air techs at the expense of Fire. Even though we already knew Wind Cutter, just by evolving to her we learn the Static Elect tech, as it's her default technique. She's lost access to Fire Tower, but can still use Heat Wave, and can now learn Megalo Spark from the Shima Unimon patrolling Gear Savana. 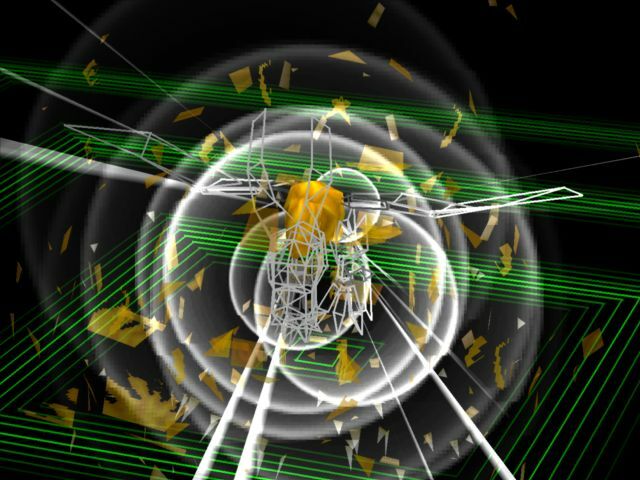 Static Elect has a chance to inflict paralysis, but is fairly low on the power scale and will be quickly outclassed. Slide evolutions work just like regular evolutions, resetting Care Mistakes, Battles, and moving Weight up or down to whatever the base Weight of the new evolution is, except that they do not reset how many days you have until your Digimon dies. 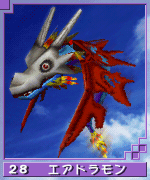 That's okay though, because we don't need that long to meet the requirements for Airdramon's Perfect. Care Mistakes and Battles both reset on evolution, so we're already set for Care Mistakes, but have to work for the Battles condition. 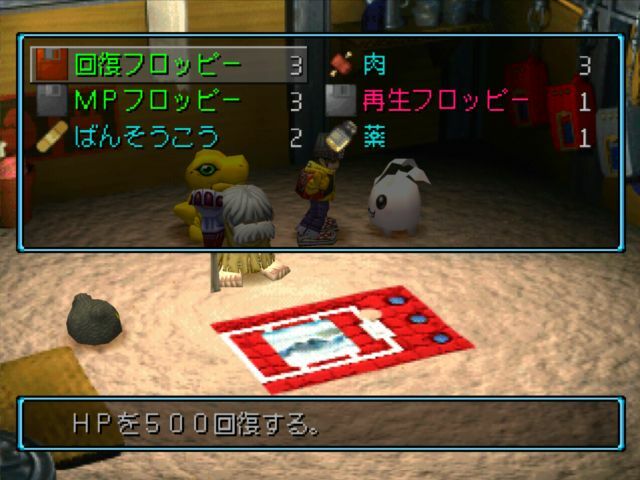 Weight will probably require spending a lot at Palmon's garden, but now that we have access to Gear Savana (and now that the tunnel's gone through) I think it's high time we exploit the Restore glitch. Evolution-wise it's a straight shot from here. 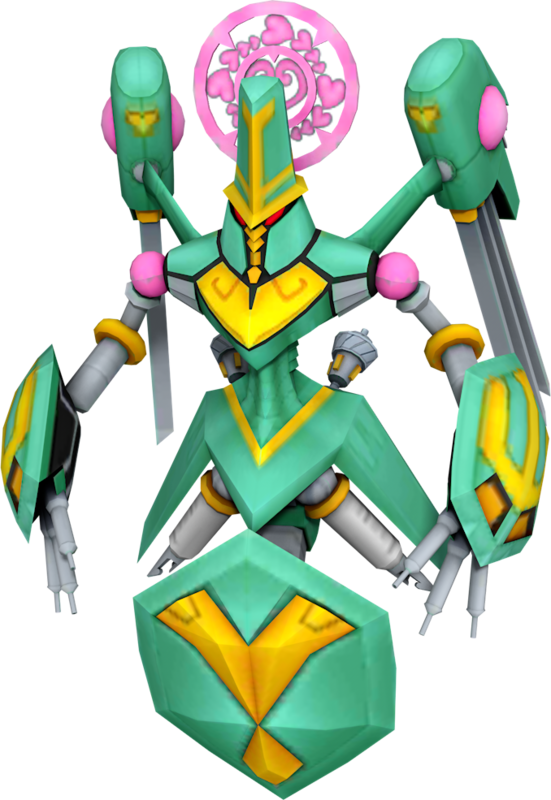 Airdramon only has three possible evolutions, Vademon is disabled by default until 360 hours pass, and the only requirement for Hououmon that we'll meet naturally is Care Mistakes. This glitch requires a minimum of four items to be in our inventory, as it involves manipulating the Recycled Goods shop. 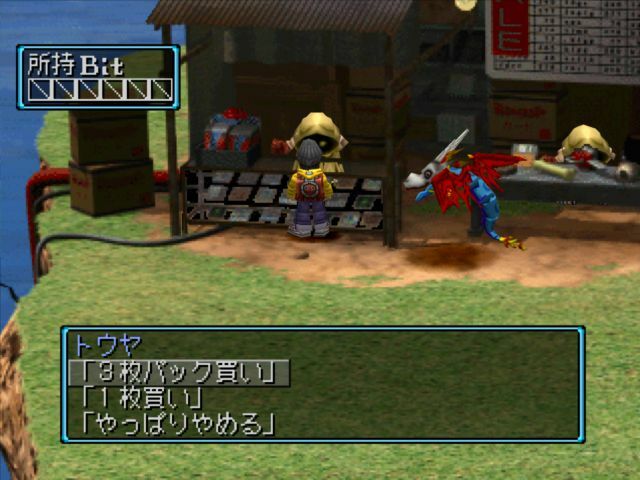 For an item to appear in the Recycled Goods shop, it has to be stolen from the player first, which only happens after a battle is lost in which the player has at least four items. We want to lose both the Restore Floppy and the Brain Chip, so we're taking five items total. If both of them get stolen in one go, then good on us, but normally what happens is you lose one in the first battle and the other in the second. Shima Unimon happily tramples Samus for us. Jijimon: Ohhhh, how unspeakable. You lost a battle and returned. Samus resurrected with what life they had remaining but...Some of your things may have been taken. In this world, those who lose battles may have their possessions stolen. It's said that you can buy back your stolen items somewhere. Don't give up. It took five attempts to get my Restore Floppy stolen. Four of the five times the item in my fifth inventory slot was taken, with the third only disappearing once. The success came from swapping the Restore Floppy into that space. Then it took three attempts after that to get the Brain Chip stolen, with the first item slot being taken each time. At this point both the Restore Floppy and the Brains Chip are in the Recycled Goods shop. First, we buy the Chip. Which is 0, because the quantity calculator sees that the shop has 0 quantity of it. Then we hit down on the D-pad to reduce the quantity below zero, and roll into numbers so big there's no means of representing them properly. This is not "15." 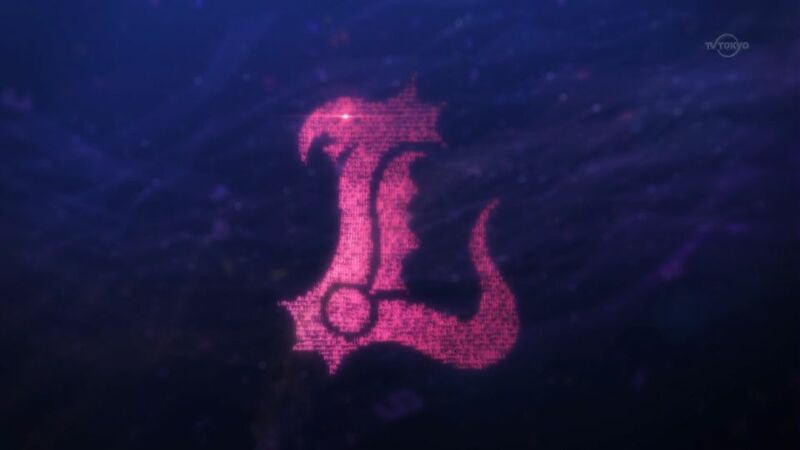 This is L5, the largest number the game is prepared to store. 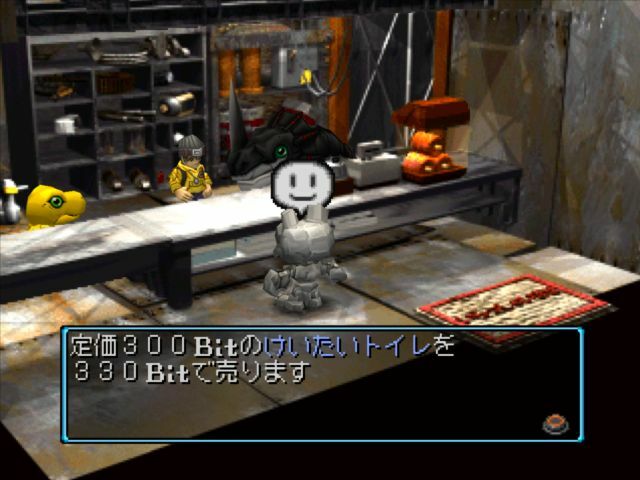 Digimon World stores numbers greater than 99, but it doesn't have the symbols necessary to render them, so it substitutes in alphanumerics, logographs, anything it can find in the system memory. If we were to rollover from l5 to 1 by pressing up twice, the game would no longer let us go down to l5 (since it's programmed to stop us from going below 1 but not below 0) and we wouldn't be able to buy anything at all. We buy l5 Brain Chips, which immediately glitches our Bits. There are so many steps of this glitch that should not work the way they do, and it only functions at all because of multiple aspects of the game not being bugchecked. Now, we have l5 Brain Chips in our inventory, but the game sets it to 0, the nearest quantity our inventory can handle. That's fine, because using square and down we can sell l5 Brain Chips for 999,999 Bits, immediately capping our Bits. The English localization has a very weird money bug. 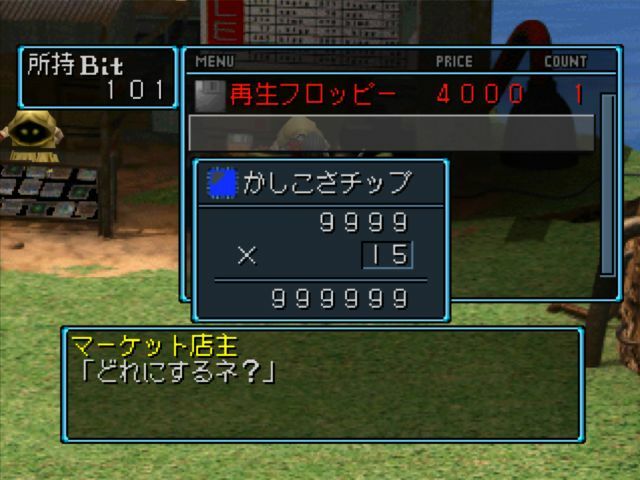 It can only display five digits instead of the six that the Japanese game can. Your maximum storage remains the same, so instead the game puts it into a "Bits 1, Bits 2, Bits 3..." display up to Bits 9, so that if you had maximum Bits like I do now, it would display as "Bits 9: 99,999 Bits." However, this actually shortchanges international Digimon tamers, as that means their maximum is 99,999x9 = 899,991 rather than 999,999. You can't hold as much money in the international game as you can in the Japanese game. The moment we close the shop menu, we get our first medal! Congratulations! To commemorate your great achievement, we sent a medal! It feels good having an infinite source of cashflow only eight hours into the game. 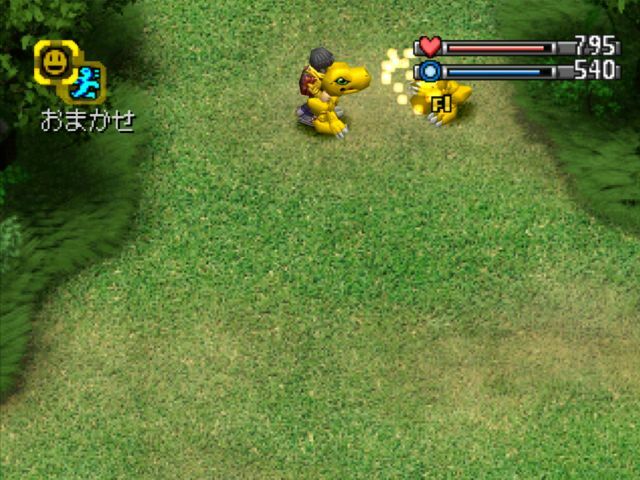 Medals are the ultimate driving force in Digimon World, awarded for clearing specific goals like raising every Digimon or clearing the game. 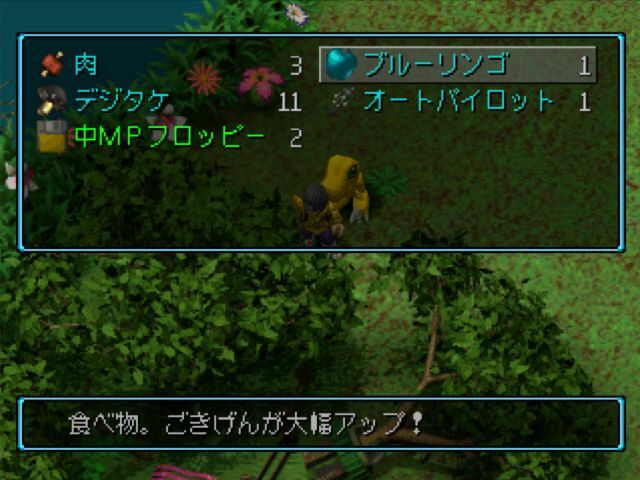 Unlike achievement lists, medals have an in-game function; every time you get one, you have a chance to increase your Tamer Level, a stat which modifies what percentage of stats are inherited between Digimon generations. 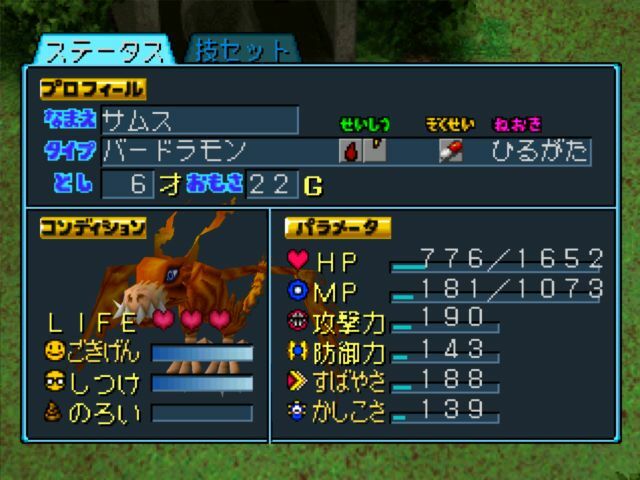 When they're reborn, Digimon inherit 1% of their previous life's stats for each Tamer Level you have. At Tamer Level 10 (Legend) your Digimon will inherit the maximum, 10%. Buying l5 of an item resets its quantity to 1, which lets us repeat the glitch all over again should we ever need more than one million Bits. Suffice to say, the resource problems we started with only a few hours ago are now completely out the window. We are somewhere between one-fourth and one-third through the main game, and we already have infinite Floppy Disks, infinite Autopilots, infinite Portable Potties, and infinite Giant Meat. If it can be bought with money, we have it to infinity and beyond. Now I'm going to put my infinite Bits to use, all but completing the card library. When completing it the first time I did some experimentation to determine rarity distribution, as this isn't actually the only source of Digimon cards in the game. Later on you can get a card vending machine added to the shop, in the style of Bandai's TCG vending machines. Some fans have insisted that the machine gives better cards than the actual card shop packs, though it's hard to estimate accurately because the machine gives them one at a time whereas packs give them to you in batches of three. My analysis of the first hundred cards out of each demonstrated that you were 20% more likely to get a Common or lower out of the machine, but there's also a cost issue at play, as each pack of three is 500 Bits while each vending card costs 100 Bits. Getting to 100 cards costs 17,000 Bits from the shop, and 10,000 Bits from the machine. The vending machine is certainly cheaper, but the trade off is inferior pulls and not being next to an infinite money engine. There are five rarities of cards, which are unnamed in-game but later games have retroactively identified them as SS, S, A, B, and C. 2 cards can't be found in packs. Of the remaining 63, there are 4 C, 9 B, 25 A, 20 S, and 5 SS-rarity cards. In each pack you have a 1% chance of pulling a SS-rare, 5% chance of pulling a S-rare, a 13% chance of pulling an A-rare, a 33% chance of pulling a B-rare, and a 48% chance of pulling a C-rare. Unlike most actual trading card sets and games, you are not guaranteed a rare/uncommon or higher card in every pack; it's perfectly possible to pull three Cs. I reach 54/65 after spending my first hundred thousand Bits. Finally, after burning three hundred thousand Bits on opening six hundred packs, I have a functionally complete set. The final card requires us to hit the 40 Prosperity benchmark, which we're about one third of the way to. Revenge on Shima Unimon teaches us Megalo Spark! It has a base power of 382 for 174 MP, and can inflict Stun. 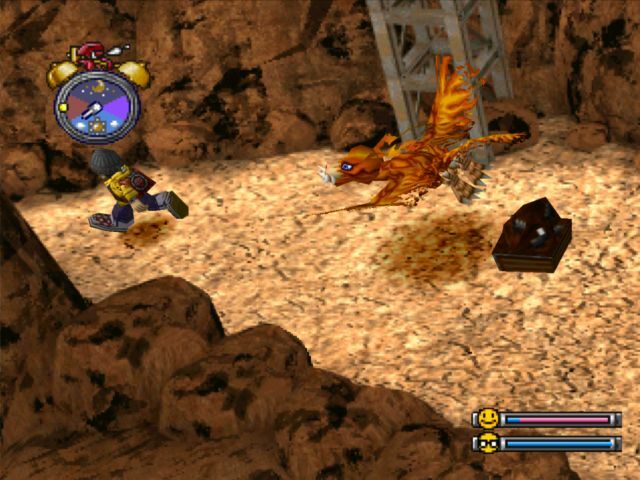 A Digimon with Spark can plow through significant sections of the game without much else going for it, though it does have some windup. 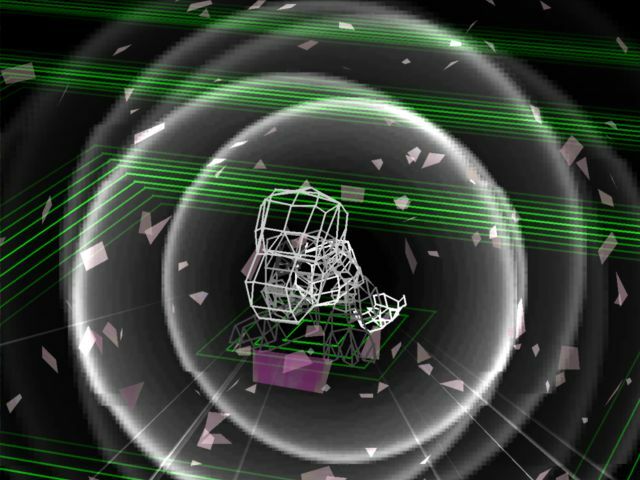 Dynamite Kick can inflict Stun, while the only reason for Patamon to throw a Wind Cutter over Spinning Shot is the lower MP cost and less startup frames. This fight can actually be pretty dangerous if Stun procs enough, as you're functionally helpless and he can keep wailing on you with the Cutters. It's not now that we have infinite money, as that means our HP is also infinite. Patamon: Craaap! One more time! ...is that it's not one fight. Patamon: A little more after that! Hey, one more time! I can say with absolute certainty that I will never run out of Recovery Floppies in the course of this LP. We pick up Spinning Shot from this sequence of Pata-battles. It has a base power of 389 for 150 MP versus Wind Cutter's 178 for 93 MP. By swapping to Spinning Shot we take a 61% increase in MP cost in exchange for an 84% increase in damage dealt, coming out positive in the exchange. The only hangup is that Spinning Shot's startup animation can be obnoxiously slow. 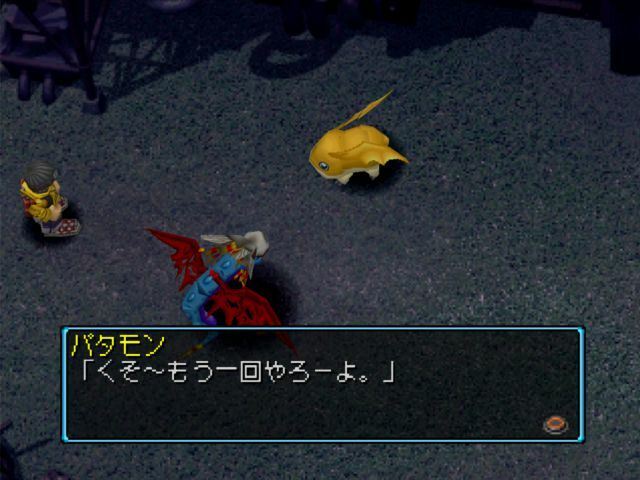 Patamon: I can't win! Aaaarrrghhh! Touya: And what would you do if you did win? Patamon: Eh? Uh, I dunno. What should I do? Touya: What should you do? ...Nothing comes to mind? Patamon: Nothing at all. I'm free. Touya: Haa...If you're so free, then go to the village. A lot of different Digimon are there. 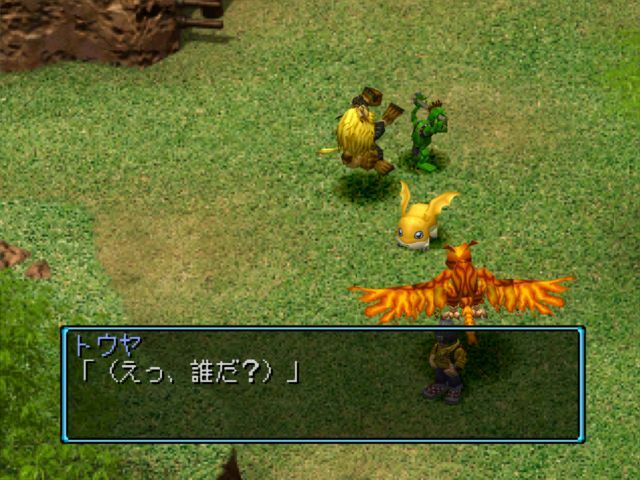 Patamon: Eheh, sounds good. I'll go. I'm Patamon. See you later. With Elecmon recruited, we now have every available Gear Savannah villager aside from Leomon. Misty Trees is one of my favorite areas. It's another take on the Lost Woods concept, but where Amida Forest followed a set of rules, Misty Trees scrambles the areas you end up in if you try to go too deep. We'll get the ability to turn off that property in a minute. 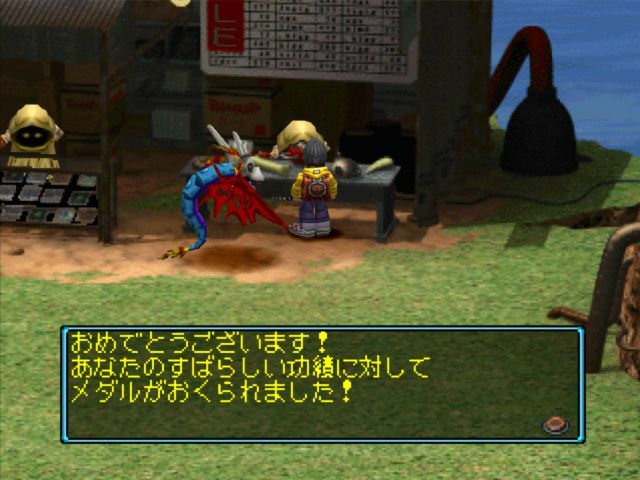 Gabumon has access to the Stun status from both Dynamite Kick and Megaton Punch, and can in fact stunlock you into oblivion if it procs frequently enough. Him kicking of a Stun gives him a spare moment to use War Cry, one of the game's rare Buff Moves. It has a base power of 0, but for 42 MP raises Offense and Speed by 10%, and Defense by 5%. 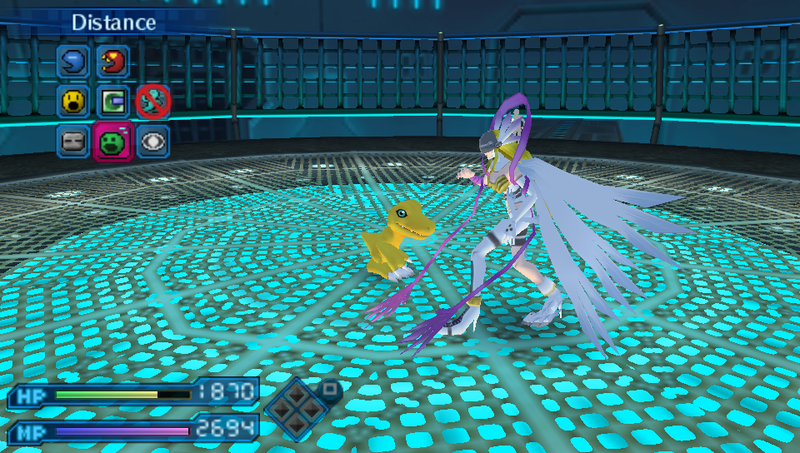 Buff moves are terribly underpowered in Digimon World. They have no impact if your stats are already maxed, so as far as the endgame and multiplayer are concerned there's no reason to invest in them. So they really only shine during small portions of the maingame. Gabumon: Uwaaaan! I hate it! I hate fighting! Touya: ...If you hate fighting, you should run away. 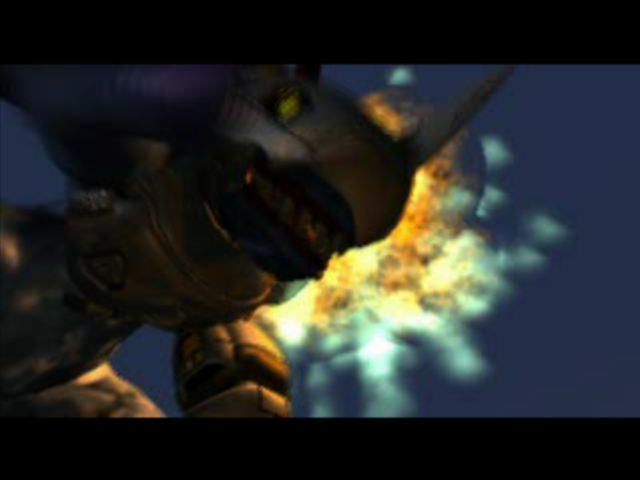 Gabumon: Doing that is too frustrating. Touya: I don't get you at all. Well anyway, will you join our village? You won't have to hide there. Touya: It makes no difference if you don't want to. 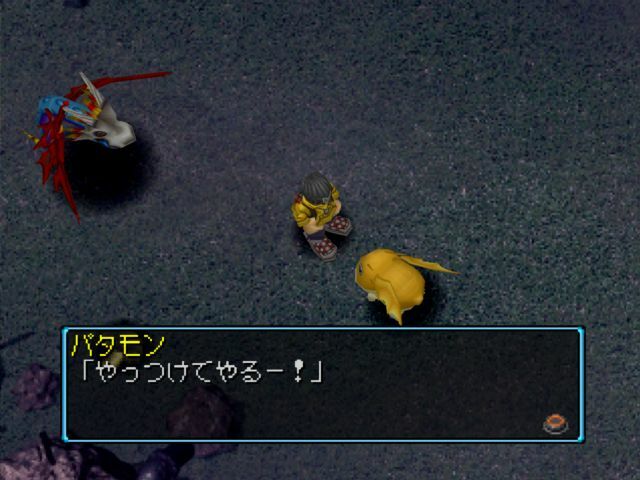 Gabumon: When you say that, I really want to go. I'm going! I'm going with you! The night track for Gekko Swamp is lower pitched and swaps in bullfrog croaks instead of the normal ones. Otamamon: Hey you, hey you! Chicken-wuss! Coward! Hack! Blockhead! Idiot! >>I've had it up to hear with you! >An opponent who is a child, is not an opponent at all. 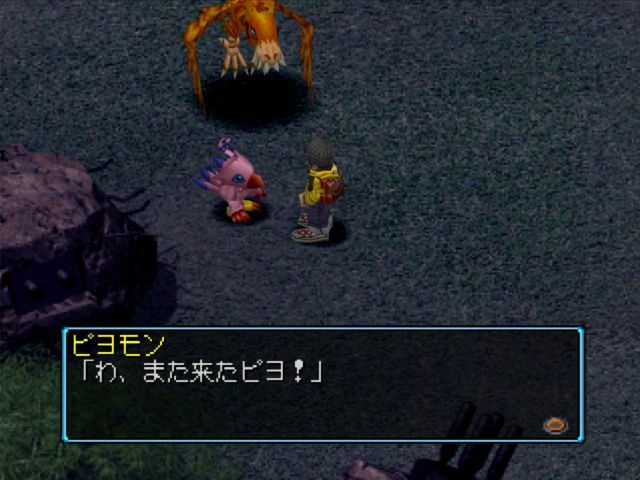 I learned all my Japanese dirty words from Digimon World. Except for kusogaki, I learned that from Vanguard. Calling a kid a feces-eating Buddhist ghost is a liberating experience. This is one of the first fights where specialties really matter. 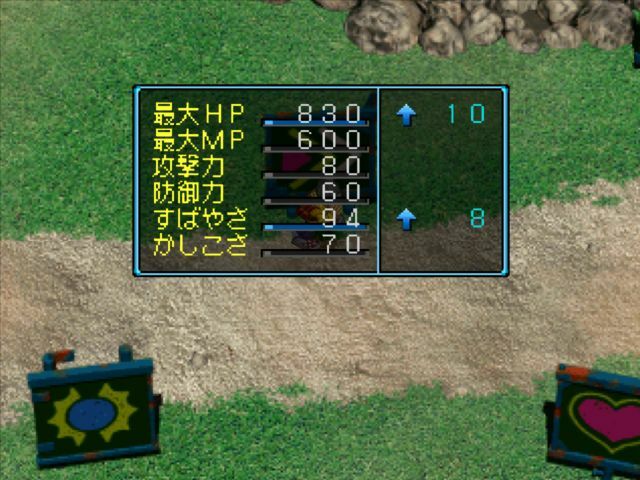 The damage formula in Digimon World is Damage = Power Modifier * Type Bonus/30 where the Modifier is equal to (Your Offense - Opponent Defense)/500 * Base Power + Base Power. What you should take away from this is the Type Bonus/30 portion. The final damage of an attack after applying its base power and offensive/defensive stats is multiplied by elemental weakness. This is a table of how the specialties break down; Type Bonus ranges from 5 to 20, with 10 being neutral damage. 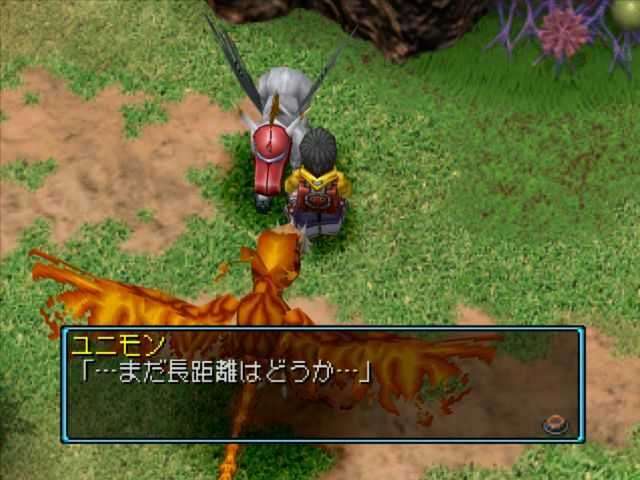 This fight can really screw over a tamer on their first run, as even at the Adult level you're liable to have a partial Fire-attribute Digimon. So Water Bullet ends up at almost a 70% damage increase over its base. On top of that, Tear Drop can inflict Dot, disabling all of our techniques while the status is active. Airdramon being Fire/Air still has to deal with the damage buff, though it's reduced because she's dual type and Air is resistant to Ice. The damage formula information was first published in 2012, by ForteGSOmega. 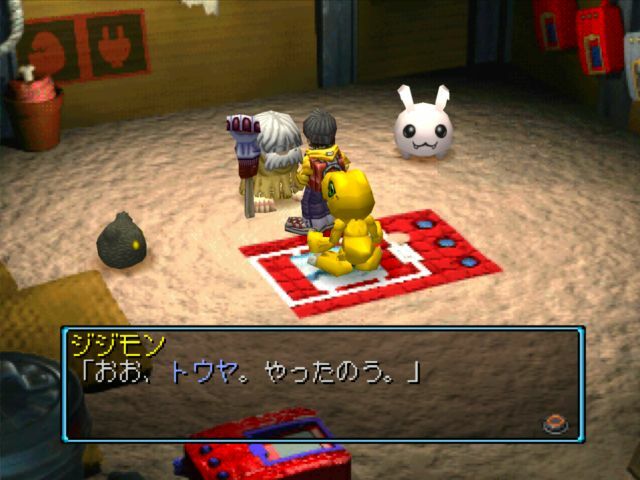 Otamamon: Uwaan, he's bullying me! Gekomon: Our lord calls-kero. Come with us-kero. Kero is an onomatopoeia for frogs' croaking. Like "ribbit," it works because of the two syllable approximation. The usage here is a little weird though, because in other media Gekomon say gekogeko instead of kerokero. Tonosama Gekomon: You two are Touya and Samus, yes? Welcome to Gekomon country. Touya: ...Sorry for bullying Otamamon. Tonosama Gekomon: Oh, that sort of thing is fine. This area is called Volume Villa in the English localization, and in Japanese Daion Township everywhere but this line of dialogue. 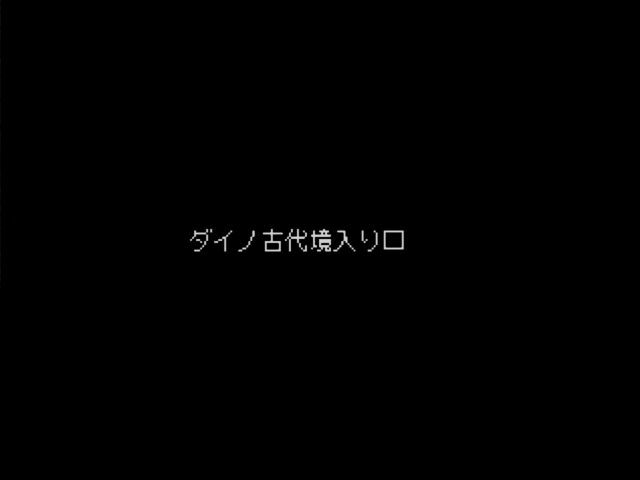 The Japanese name is a play on 大音響 daionkyou "loud sound reverberation" but written ダイオン郷 daion-kyou "loud sound township." Volume Villa is a pretty good localization choice, except that it doesn't convey the quasi-feudal feeling of 郷 kyou. Everything related to the Gekomon is feudal. Tonosama Gekomon: I appreciate it. I've heard of all the things you've been doing to save the island. Tonosama Gekomon: I want to help you. You've been to the forest north of here, that we call Mistry Trees? 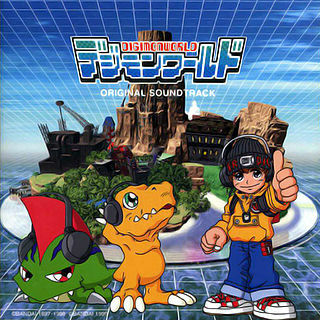 Tonosama Gekomon: A fog hangs over that place. It's very difficult to move through. 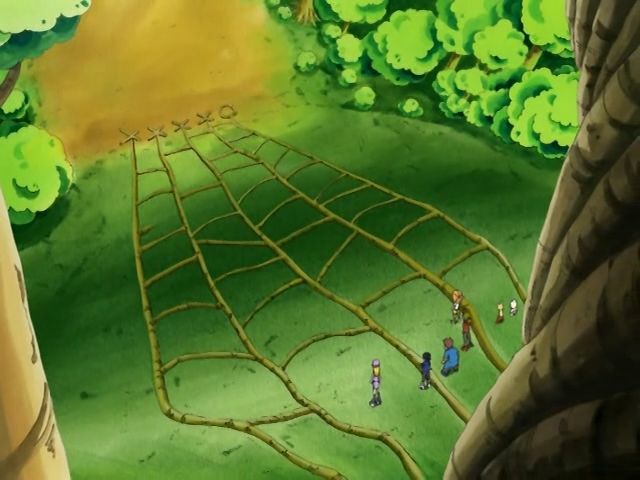 However, you need to meet with the head of the forest, Jureimon, who lies within there. 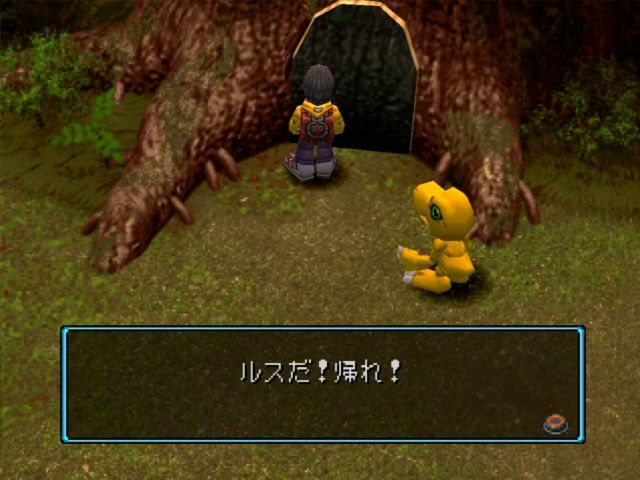 Tonosama Gekomon: The fog over Mistry Trees is Jureimon's doing. After learning of the disaster facing the island, he created the fog to protect the forest. 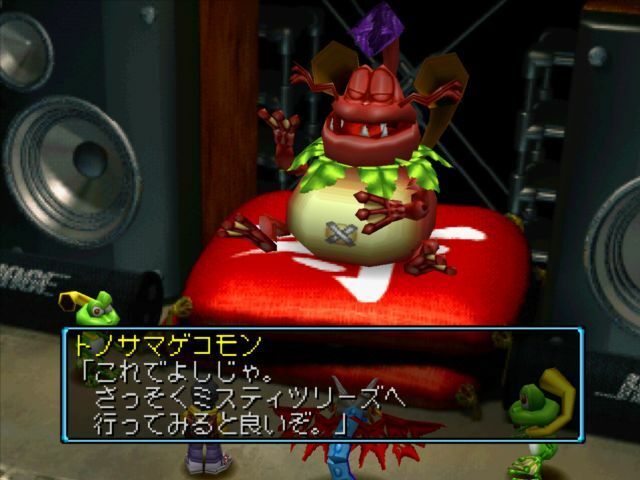 Tonosama Gekomon is named for the term 殿様 tonosama, "feudal lord," as well as a play on 殿様蛙 Tonosama Gaeru, the Japanese name for the black-spotted pond frog. 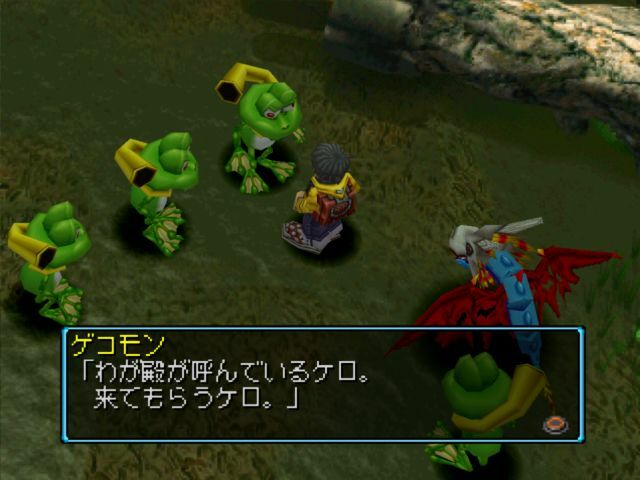 (Tonosama Gaeru are sometimes called "King Frogs" or "Lord Frogs" in English.) I've never seen an exact reasoning given for the Lord Frog's name. Touya: It's a problem for us, though. 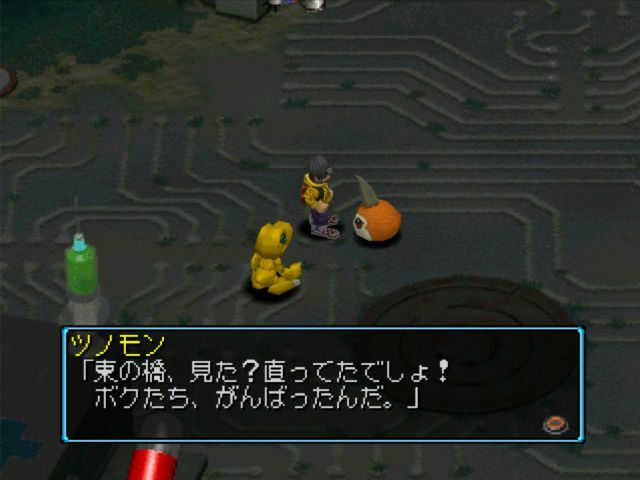 Tonosama Gekomon: Jureimon knows something about the root of this crisis. In spite of the fog, it's important that you meet him. 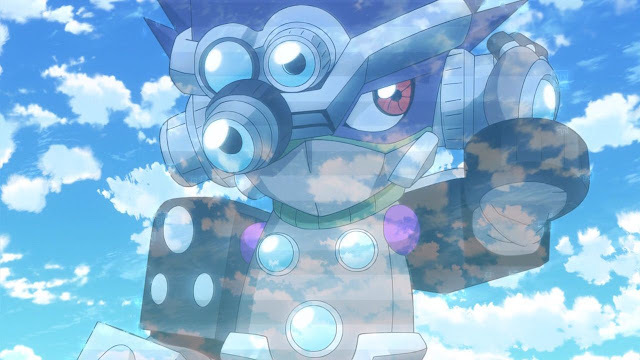 Tonosama Gekomon: Only Jureimon can stop the fog itself. However, there is still a way for you to meet. I will cast a spell over you. 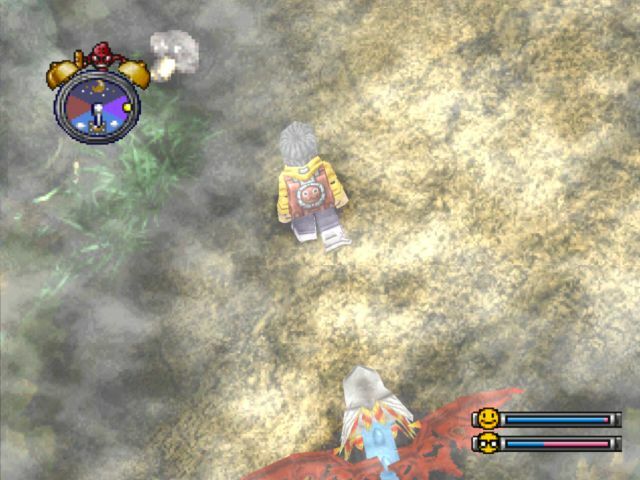 Tonosama Gekomon: So you can see your way through the fog. Touya: That would be great! Tonosama Gekomon: Then I'll cast it right away. Tonosama Gekomon: This will do. Hurry and go to Misty Trees. Gekomon: Our lord collects rare things. 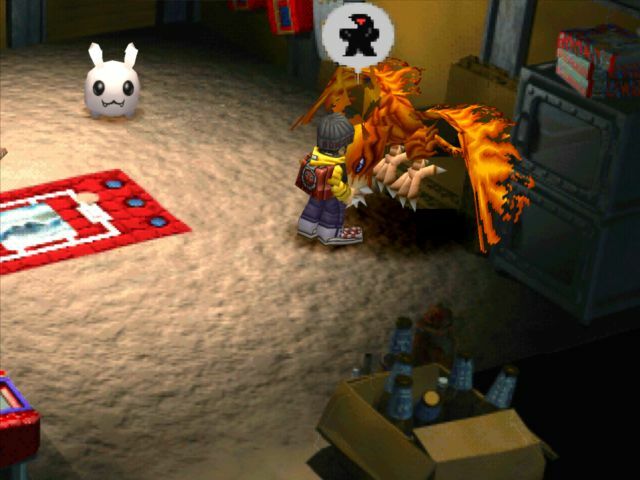 Before he collected items, but now he's devoted himself to Digimon cards. Anyone who brings him rare cards can receive "Merit" points. And "Merit" can be exchanged for items. Daion Township is probably intended to be every tamer's toolbox for competitive multiplayer. 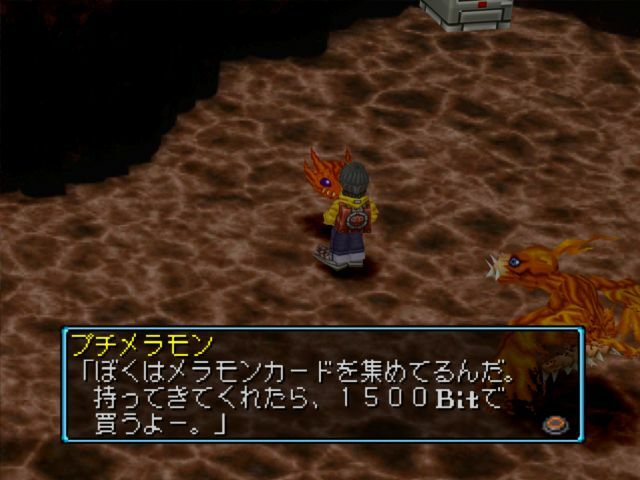 It's the only location where you can buy stat-maxing chips, it indirectly provides the tools for extending a Digimon's lifespan, and it provides access to evolution items for rare aquatic and dragonic Digimon that can evolve into the "holy trinity" of powerful hidden Perfects, Hououmon, Mega Seadramon, and Heracle Kabuterimon. 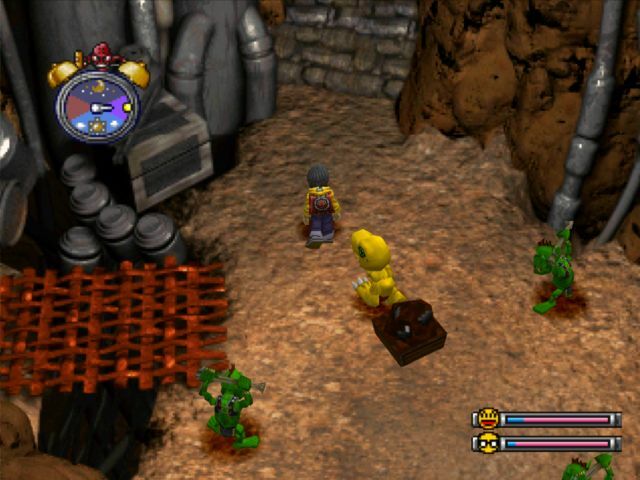 A bit like the exchange shop portions of the Battle Tower/Battle Resort in Pokémon, but this game came out two years before Crystal added the first Battle Tower. Tonosama Gekomon: Ohh, do you also want "Merit?" Now, what do you have for me? We have a heck of a haul. Our 10 extra SS-rares alone are worth 1000 Merit, which nets us the Amazing Rod. 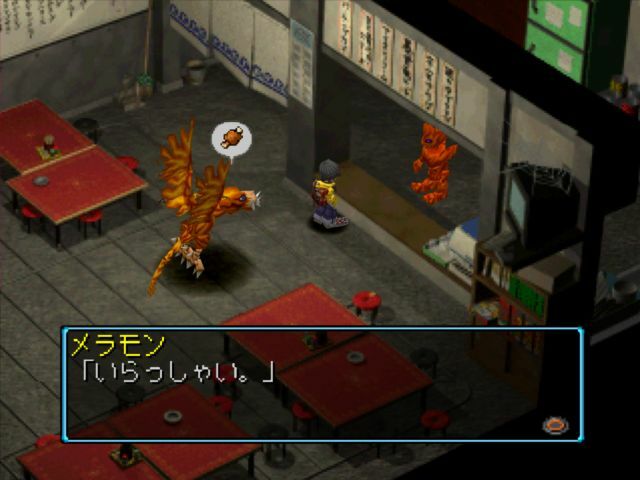 The evolution items are all for Adult-level Digimon, including our Airdramon. From top to bottom they are the Rainbow-colored Horn (Airdramaon) Offering Sake (Seadramon) Red Shell (Shellmon) Hard Scale (Coelamon) and Ice Crystal. 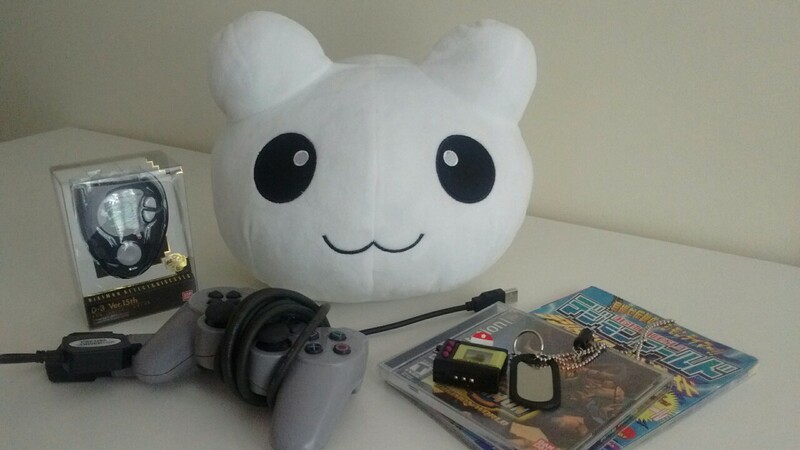 (Yukidarumon) These items all only work on Child-level Digimon, evolving them direct to the Adult stage. 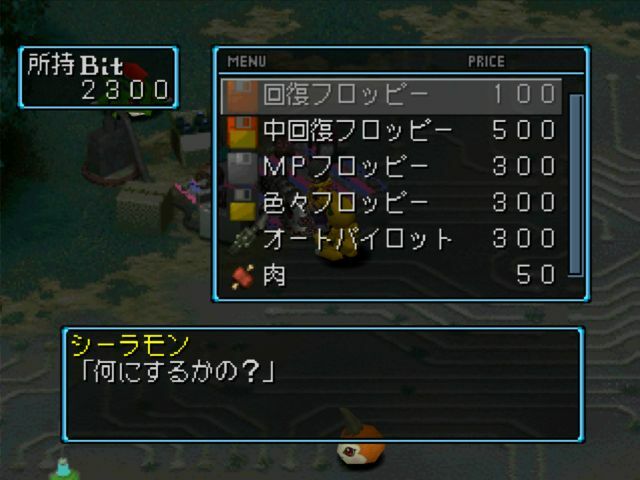 Tonosama Gekomon also sells stat Chips for 800 Merit each, as well as Super Restore Floppies (cures all status errors, recovers from KO, and restores all HP) for 100 Merit. After selling all of my additional cards and buying the Amazing Rod, we have just shy of 4182 Merit left over. We can get 5 status chips, or 40 Super Restore Floppies, or any evolution items we want. 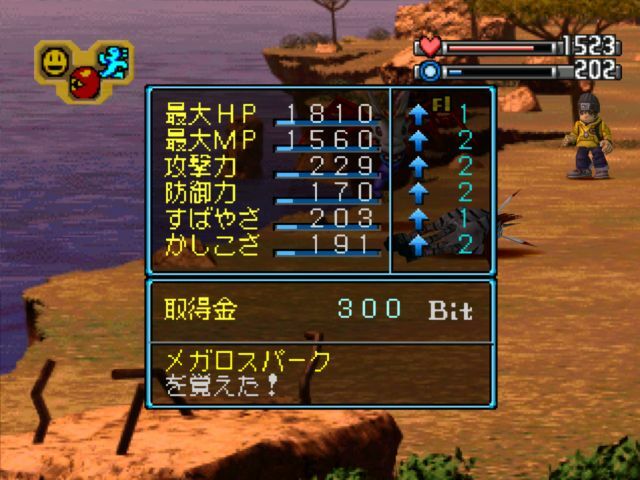 Since each stat chips represents +50 to a stat (+500 for HP/MP) even 5 chips in any one stat can be a massive boost. Money is infinite now, and money can be turned into cards and through that Merit, ergo we technically do have infinite stat chips already. I'm going to tap into the power of at least one of those evolution items late in the game, but for now I invest in Offense Chips, as we need to win 12 more battles to qualify for Airdramon's Perfect and some of those will be boss fights. 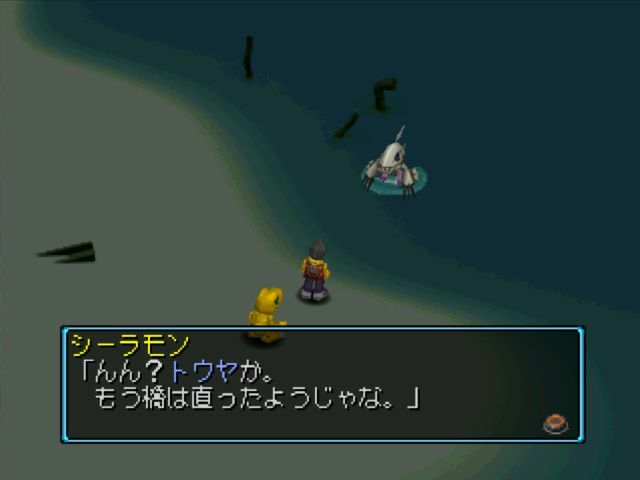 Tonosama Gekomon: Mm, that's right, since that Amazing rod is a Special Item, I'll take it out of your inventory. The Amazing Rod is a key item that doesn't need to be equipped. It automatically replaces the Old Rod we picked up from Trash Mountain. Daion Township connects directly from the northwestern end of Gekko Swamp. It's another really pretty render where you can see the blend of technology and nature, an element that I think is missing from most of the sequels. As a whole, the games from World 2-on lean more toward settings that are primarily digital with no natural elements, rather than nature recreated by technology. This is the result of Samus downing 5 Offense Chips, putting us halfway to the 999 cap. Having big numbers goes a long way toward mitigating the difficulty level, though individual techs are far more important than stats in this game, and in that department Airdramon isn't setting any records just yet. Next up: the wisdom of the forest.